2005-10-24 Application filed by 킴벌리-클라크 월드와이드, 인크. filed Critical 킴벌리-클라크 월드와이드, 인크. 샘플내 미생물 존재의 반-정량적 또는 정량적 검출 방법이 제공된다. Sample half of microorganisms present-quantitative or quantitative detection method is provided. 상기 방법은 1종 이상의 미생물 존재하에서 검출가능한 색 변화가 일어나는 시험 염료를 이용한다. The method utilizes a test dye is detectable color change under the presence at least one microorganism occurs. 예를 들어, 한 실시양태에서는, 시험 염료는 미생물 성분 (예를 들면, 세포막, 세포질 등)과 세포 외부 환경 사이의 극성 차이에 반응하는 용매화발색 염료 (예를 들면, 레이차트 염료)이다. For example, in one embodiment, the test dye is a microbial component (e.g., cell membrane, cytoplasm, etc.) and the plum color development dye (e.g., ray chart dye) for in response to the polarity difference between the extracellular environment. 별법으로, 다른 메카니즘이 염료와 미생물 사이의 상호작용, 예컨대 산-염기 반응, 산화환원 반응 등을 전적으로 또는 부분적으로 초래할 수도 있다. Alternatively, a different mechanism is the interaction between the dye and the microorganism, for example acid-base reactions may lead to, oxidation-reduction reaction, such as wholly or partially. 어느 것이든 상관없이, 시험 염료의 색을 대조 염료의 색과 비교할 수 있으며, 상기 대조 염료의 색은 기지 미생물 농도에 대응한다. Without any thing or correlation, can be compared with the color of the contrast dye, and the color of the test dye, the color of the contrast dye corresponds to the base biomass concentration. 본 출원은 2003년 12월 16일자로 출원된 미국 특허 출원 10/737,574호의 우선권을 주장하는, 국제 출원 PCT/US2004/042461호 (2004년 12월 16일자로 출원됨)의 일부 계속 출원이다. This application is a continuation-in-part application filed on December 16, 2003, US patent application (filed December 16, 2004 to date). 10 / 737,574, which claims priority favors, International Application PCT / US2004 / 042461 arc. 본 발명은 세균, 효모, 곰팡이 및 바이러스와 같은 미생물의 검출을 위한 방법 및 제품에 관한 것이다. The present invention relates to methods and products for the detection of microorganisms such as bacteria, yeasts, fungi and viruses. 일상생활 속에서 우리는 질병의 원인이 될 수 있는, 미생물로 오염된 표면에 무의식적으로 노출되어 있다. In everyday life, we are unwittingly exposed to surface contamination, microorganisms that can cause disease. 여러 연구들이 특정 세균으로 오염된 "위험지점"이 공중전화, 문 손잡이, 병원 대기실과 어린이 보육기관의 장난감, 열풍 손 건조기, 주방에서 사용되는 타월 및 스펀지, 일상적인 환자 간호 중에 있는 병원 직원의 손, 및 생고기와 야채를 섞는 음식 조리대 표면과 칼로부터의 교차 오염을 포함한다는 것을 보여주고 있다. A number of studies are contaminated with certain bacteria "danger point" a public telephone, door handles, hospital waiting rooms and children of nursery toys, hot-air hand dryers, towels used in the kitchen and a sponge, hospital staff during routine patient care hand and shows that include cross-contamination of food from the kitchen counter surfaces and mix the meat and vegetables with a knife. 미국 내에서만도 여러 지역에서 최근 세균 오염의 발생이 아동 및 노인의 사망을 초래하였고 그 외의 사람들을 질병에 걸리게 하였다. Only the United States had also occurred in recent bacterial contamination caused the death of several children and elderly in the area were caught by other people with the disease. 또한, 음식물의 미생물 오염도 전 세계적으로 주요 문제이다. In addition, the main issue before the microbial contamination of food worldwide. 살모넬라( Salmonella ), 대장균( E. coli ) 및 기타 음식물 유래의 세균은 매년 셀 수 없을 정도의 질병을 야기하고 있다. Salmonella (Salmonella), of Escherichia coli bacteria (E. coli) and other food-derived illnesses are caused each year not enough cells. 급성 증상은 메스꺼움, 구토, 비정상적인 복통, 설사, 고열 및 두통을 포함한다. Acute symptoms include nausea, vomiting, unusual stomach pain, diarrhea, fever and headache. 급성 증상의 발병 이후에는 만성적인 결과가 따를 수 있다. Since the onset of the acute symptoms have chronic consequences can follow. 표면의 교차 오염은 육류, 생선 및 가금류에서 유래한 세균을 야채와 같은 비조리 음식물로 전달할 수 있기 때문에, 음식 조리대 표면의 세균 존재 여부를 간단히 검출할 수 있으면 큰 도움이 될 수 있다. Cross-contamination of the surface, because if you can pass the bacteria derived from meat, fish and poultry to uncooked foods such as vegetables, can easily detect the presence of bacteria in the food surface countertops can be a big help. 마찬가지로, 식품 가공 산업에서 미생물의 유해 수준의 검출이 가족과 소비자의 건강을 같이 유지하는 데 있어서 매우 중요하다. Similarly, the detection of harmful levels of microorganisms in the food processing industry is very important to keep as a family and consumer health. 식품 가공 산업에서는 세균의 모니터링이 중요하다. In the food processing industry, it is important to monitor the bacteria. 육류 포장에서 치즈 생산에 이르는 실질적으로 모든 식품의 가공은 식품 공급의 안전성을 보장하기 위해 미생물 수준을 모니터링하는 것을 포함한다. In the meat packing substantially ranging from cheese production and processing of food involves monitoring the microbial level in order to ensure the safety of the food supply. 미생물 오염으로 인한 폐해가 식품 산업에만 국한되는 것은 아니다. The harm caused by microbial contamination is not limited to the food industry. 최근 수십년간 병원 및 보건 공동체가 진원지인 것이 문제가 되는 "슈퍼버그(superbug)"의 급격한 증가가 나타나고 있다. It is the last decades of the hospital and the health community is the epicenter appears sharp increase of "super bugs (superbug)" is a problem. 항생제의 남용 뿐만 아니라 병원의 불충분한 청결은 메티실린-내성 S. 아우레우스( S. aureus ) (MRSA) 및 클로스트리디움 디피실( Clostridium difficile ) 뿐만 아니라, 반코마이신-내성 장구균(enterococci) 및 다른 그람-음성 간균을 초래하였다 (Dancer, 2004). Abuse, as well as the cleanliness of the hospital sufficient antibiotic is methicillin-resistant S. aureus (S. aureus) (MRSA) and Clostridium difficile (Clostridium difficile) as well as vancomycin-resistant enterococci (enterococci) and other Gram-negative bacilli resulted in (Dancer, 2004). 최근 BBC의 보고에 따르면, MRSA로 인한 사망이 한해 5000명으로 추정된다고 한다. According to a recent report of the BBC, and that the deaths due to MRSA estimated 5,000 people a year. 상기 기사는 "청결은 환자의 주요 관심사이며 MRSA 문제는 점점 심각해지고 있다"고 밝혔다. The article said, "Cleanliness is a major concern is the issue of MRSA patients are becoming more serious." 병원의 많은 환자들이 이미 면역-결핍 상태이며 따라서 감염의 위험이 더욱 크다는 것을 고려하면, 병원 환경에서 악성 세균으로 인한 위험은 보다 더욱 위협적이게 된다. Many patients in hospitals are already immune-deficient state and thus you consider that even greater risk of infection in the hospital environment, the risk caused by malicious bacteria is more threatening than this. 병원 청결 및 병원 감염의 예방에 관한 수많은 보고서와 연구가 있다. There are numerous reports and studies on the prevention of hospital cleanliness and hospital infections. 유사하게, 맥각과 같은 곰팡이도 호밀과 같은 특정 곡물에서 성장하는 것으로 알려져 있으며, 리세르그산과 유사한 독성이 있는 알칼로이드의 생산에 의해 잠재적으로 유해할 수 있다. Similarly, and as ergot fungus, also known as growth in certain grains such as rye, Sergio Li can be potentially harmful to the mountains and by the production of alkaloids that have similar toxicity. 아스퍼질러스 니게르( Aspergillus niger ) 및 기타 곰팡이들은 천식과 같은 호흡기 증상을 악화시킬 뿐만 아니라, 알레르기 반응을 일으킬 수 있는 포자를 만드는 것으로 알려져 있다. Aspergillus your Stavanger (Aspergillus niger) and other fungi may not only aggravate respiratory conditions such as asthma, known for making spores that can cause allergic reactions. 만일 A. 니게르가 습기찬 벽이나, 집 또는 상업용 건물의 에어 컨디셔닝 장치에서 성장하기 시작하면, 특히 문제가 될 수 있다. A. When you ten thousand days Gershon began to grow in an air conditioning unit or cold wall, house or commercial building moisture can be particularly problematic. 칸디다 알비칸스( Candida albicans )와 같은 특정 효모는 문제가 되는 또다른 부류의 미생물일 수 있다. Specific yeasts such as Candida albicans (Candida albicans) may be yet another class of microorganisms in question. C. 알비칸스는 유아 기저귀 발진, 아동 및 면역-결핍 성인의 아구창, 및 효모에 의한 질내 감염 등과 관련있다. C. albicans infant diaper rash, children and immuno-deficient adults is related to the thrush and vaginal infections caused by yeast. 효모는 또한 위장관과 신체의 인두 부위를 감염시킬 수도 있다. Yeast may also infect the pharyngeal region of the GI tract and the body. 현재의 세균 검출 방법은 비품의 표면에서 샘플을 채취하는 것을 포함한다. Current bacterial detection method includes taking samples from the surface of the fixtures. 식품 가공 환경에서는 이러한 비품이 육류 절단기일 수 있고, 식당이나 가정과 같은 음식물 조리 환경에서는 이러한 표면이 식탁, 도마, 냉장고 내부 또는 작업 표면일 수 있다. In the food processing environment can be a fixture such meat cutter, in a restaurant or home cooked food, such as the environment can be the surface of these tables, cutting boards, work surfaces or inside the refrigerator. 그 후에, 샘플을 밤새 인큐베이션하여 배양물을 생육하였다. Thereafter, the samples were incubated overnight growth the culture. 밤새 성장 배지는 샘플이 적절한 온도와 습도하의 한천 평판 배지 상에서 성장하도록 하여, 육안으로도 볼 수 있을 만큼 충분히 큰 콜로니를 형성할 때까지 세균을 생육 및 증식시킨다. Growth medium overnight to grow on an agar plate medium under a proper sample temperature and humidity, the growth and proliferation of bacteria until it forms colonies large enough enough to be seen by the naked. 정해진 시간 동안 인큐베이션하고 세균의 콜로니가 성장하도록 한 후에, 훈련된 전문가가 한천 평판 배지 샘플을 손으로 검사하고 콜로니 형성 수 (CFU)를 추정한다. Incubating for a fixed period of time and after the bacterial colonies to grow, a trained professional checks the agar plate medium and the sample by hand to estimate the number (CFU) to form colonies. 이러한 방법은 다소 고가이며 상당한 시간 지체를 수반한다; And these methods are expensive and involve a somewhat considerable time lag; 지체된 시간 동안 오염된 제품이 옮겨지거나 존재하는 미생물에 사람들이 노출될 수 있다. The contaminated product during the lag time can be moved or people exposed to microorganisms that exist. 유해한 미생물을 신속하게 검출할 수 있는 방법 및 제품이 명백히 요구되고 있다. Methods and products that can quickly detect harmful microorganisms are clearly required. 당업자들이 겪는 상기 어려움에 대한 반응으로서, 본 발명자들은 미생물의 존재하에서 시각적으로 검출가능한 변화가 일어나는 미생물 감수성 착색제 및 이동상을 포함하는 지시 조성물을 개발하였다. As a reaction to the problems experienced by those skilled in the art, the present inventors have developed an indicating composition containing a microorganism susceptible colorant and a mobile phase capable of visually detecting a change taking place in the presence of a microorganism. 이러한 조성물은 미생물의 존재를 나타내도록 표면에 도포될 수 있다. These compositions can be applied to the surface to indicate the presence of microorganisms. 이동상은 살균제일 수 있다. The mobile phase can be sterilized first. 착색제는 미생물의 존재하에서 육안으로 볼 수 있는 색 변화를 제공한다. Colorant provides a color change visible to the naked eye in the presence of a microorganism. 이동상은 액체이거나 겔일 수 있고 착색제는 염료일 수 있다. The mobile phase is a liquid or gelil and colorant may be a dye. 몇몇 실시양태에서, 착색제는 미생물의 농도에 비례하는 속도로 색이 변화한다. In some embodiments, the colorant may be a color change at a rate proportional to the concentration of microorganisms. 다른 실시양태에서는, 존재하는 미생물의 양은 변화가 일어나는 착색제의 양에 비례한다. In other embodiments, the amount of microorganisms present is proportional to the amount of the colorant changes that occur. 적합한 염료의 예로는 메로시아닌 염료, 4-[2-N-치환-1,4-히드로피리딘-4-일리딘)에틸리덴]시클로헥사-2,5-디엔-1-온, 적색 피라졸론 염료, 아조메틴 염료, 인도아닐린 염료, 디아자메로시아닌 염료, 레이차트(Reichardt's) 염료로 예시되는 양쪽성 이온 염료 등과 이들의 혼합물이 있다. Examples of suitable dyes include dyes, merocyanine 4- [2-N- substituted-1,4-dihydro-4-sense Dean) ethylidene] cyclohexanone-2,5-dien-1-one, red pyrazolone dyes, the azo dyes, aniline dyes India, diaza booties during non-dye-ray chart (Reichardt's) zwitterion dyes as a mixture thereof as exemplified by dyes. 특별히 적합한 것은 양쪽성 이온이 염료의 색소원을 포함하는 연속된 π 전자계 안에 함유된 양쪽성 이온 염료이다. Particularly suitable is a zwitterion-containing dye in a series of π electron system including a source of coloring the zwitterion dyes. 미생물 지시제로서 특히 유용한 것으로 여겨지는 또다른 부류의 염료는 메로시아닌 염료이다. Another class of dyes is believed to be particularly useful as a microorganism instruction is a merocyanine dye. 염료는 또한 용매계 또는 수성계 용액으로서 표면에 도포되고 건조되어, 도포된 염료 용액의 건조 잔류물을 남긴다. The dye also is applied to the drying surface as solvent-based or composition measuring solution, leaving a dry residue of the applied dye solution. 이러한 건조 잔류물은 미생물과 접촉시 색이 변화하므로, 미용 화장지 상자와 같은 포장재, 장갑과 같은 의료 용구, 및 재료가 사용되기 전에 염료와 함께 제조될 수 있고 차후에 미생물의 오염을 지시하는 기타 표면 상에 사용될 수 있다. The dry residue microorganisms and so on contact with color changes, cosmetic tissue box and the other surface that can be produced and subsequently directed the contamination of microorganisms with dye before medical devices, and materials are used, such as such as packaging, gloves to be used. 놀랍게도 본 발명자들은 이들 염료가 표면에 도포되고 건조되었을 때, 코팅물을 제조하는데 사용된 용매와 히드록시프로필-베타-시클로덱스트린과 같은 첨가제 및 계면활성제의 사용이, 코팅물의 미생물 검출 능력에 유의한 영향을 미친다는 것을 발견하였다. Surprisingly, the inventors of these dyes have when applied to a surface and dried, the solvent and hydroxypropyl used to prepare a coating-beta-use of the additive and a surfactant, such as cyclodextrin, significant to coating the microorganism detection capabilities it was found that the influence. 히드록시프로필-베타-시클로덱스트린은 종이 타월이나 유사한 와이프 재료에 코팅된 후 착색제의 휘도를 증가시키는데 효과적인 것으로 밝혀졌다. Hydroxypropyl-beta-cyclodextrin have been found to be effective in increasing the brightness of the colorant after the coating in a similar wipe material or paper towel. 이론에 구애받기를 원하지 않지만, 본 발명자들은 시클로덱스트린 유도체의 첨가에 의해 염료의 결정화를 억제함으로써 염료의 색이 향상된다고 믿고 있다. Not want to be bound by theory, the inventors believe that the improved color of the dye by inhibiting the crystallization of the dye by the addition of a cyclodextrin derivative. 염료를 간섭하는 것으로 밝혀진 표백제의 존재로 인해 위 양성으로 판독되는 것을 막는데 도움이 되도록 다른 화합물을 와이프에 첨가할 수도 있다. Due to the presence of bleaching agents have been found to interfere with the dye may be added to other compounds in the wipe to help prevent read out by the above cultivation. 미생물 지시 착색제를 혼입한 측방 유동 장치 또한 본 발명의 범주에 포함된다. A lateral flow devices incorporating microbe indicating colorants are also included in the scope of the invention. 이러한 장치는 검출 대역 및 대조 대역을 갖는 막이 있으며, 상기 검출 대역은 세균 존재에 반응하여 색이 변화하고 대조 대역은 분석이 적절하게 행해졌는지 를 나타내기 위해 본래의 염료 색을 유지하게 된다. This device is a film having a detection zone and the control zone, the detection zone is the color changes in response to the presence of bacteria and the control zone remains the original dye color to indicate that the analysis has been done properly. 또한, 미생물 감수성 착색제를 함유하는 용액을 표면에 도포하고 미생물의 존재를 나타내는 시각적으로 검출가능한 변화를 관찰함으로써 표면 상의 미생물을 검출하는 방법이 본원에 기재되어 있다. In addition, a method of applying a solution containing a microorganism susceptible to the colorant surface and detecting the microorganisms on the surface by observing a visually detectable change indicating the presence of the microorganisms described herein. 본 발명의 기타 특징 및 측면이 하기에 더욱 상세히 기재되어 있다. It is more fully described in the following other features and aspects of the invention. 본 발명의 최상의 양식을 비롯하여, 당업자들을 위한 본 발명의 충분하고 실시가능한 기재는 첨부된 도면을 참조로 하여 본 명세서의 나머지 부분에 더욱 구체적으로 상술되어 있다. Including the best form of the invention, the full and operable base material of the present invention for those skilled in the art and is described in more detail in the rest of this specification with reference to the accompanying drawings. 도 1은 5가지 기본적인 세균 세포 모양의 도면이다. 1 is a drawing of the five basic bacterial cell shapes. 도 2는 세균 세포 배열의 도면이다. 2 is a view of the bacterial cell array. 도 3은 한 메로시아닌 염료의 구조이다. Figure 3 is a structure of the dye and not when the booties. 도 4 및 도 5는 메로시아닌 염료의 합성 방법을 도해한다. 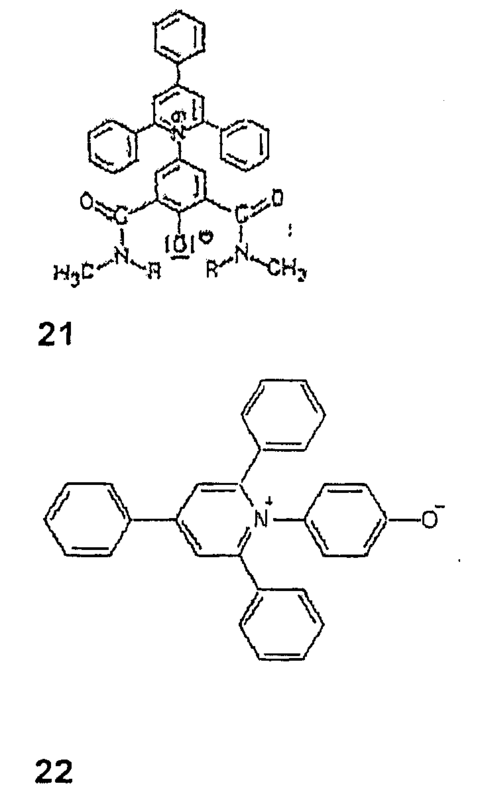 4 and 5 illustrates the synthesis of merocyanine dyes. 도 6 AD는 오래된 닭을 사용한 미생물 오염의 지시에 관한 도해이다. Fig. 6 AD are illustrated on the instructions of microbial contamination with the old chicken. 도 7 AG는 단계적인 미생물 오염의 지시 및 세정에 관한 도해이다. Figure 7 is a schematic AG according to an instruction, and the cleaning step of microbial contamination. 도 8 AD는 서로 다른 농도의 세균을 이용한 미생물 오염의 지시에 관한 도해이다. Figure 8 is an illustration related to AD indication of microbial contamination using bacteria of different concentrations. 도 9 AE는 세균을 이용한 미생물 오염의 지시 및 정량화, 및 지시 염료의 적정에 관한 도해이다. Figure 9 is an AE indication of microbial contamination using bacteria and quantified, and the appropriate diagrams relating to the indicator dye. 도 10 AC는 컴퓨터 키보드 상의 미생물 오염의 지시에 관한 도해이다. Figure 10 AC are illustrated on the instructions of microbial contamination on a computer keyboard. 도 11 AD는 용액에 계면활성제를 첨가한 경우와 첨가하지 않았을 경우 미생물 오염의 지시에 관한 도해이다. Figure 11 AD is a diagram of the directions of microbial contamination if you do not added and the addition of a surfactant to the solution. 도 12 AF는 용매에 따른 미생물 오염 지시 속도를 나타내는 도해이다. Figure 12 is an illustrative view showing the AF microbial contamination instruction speed of the solvent. 도 13 AC는 착색제가 기재 상에서 건조된, 미생물 오염의 지시에 관한 도해이다. Figure 13 is a schematic AC colorant according to an instruction of the dried on the substrate, microbial contamination. 도 14는 델타 E를 S. 아우레우스의 기지 농도에 대해 플롯팅한 실시예 30에서 얻어진 결과의 그래프이다. 14 is a graph of the results obtained in Example 30 plotted against the delta E the known concentration of S. aureus. 도 15는 델타 E를 P. 애루기노사(P. aeruginosa)의 기지 농도에 대해 플롯팅한 실시예 30에서 얻어진 결과의 그래프이다. 15 is a graph of the results obtained in Example 30 plotted against the delta E the known concentration of the P. Ke rugi labor (P. aeruginosa). 도 16은 델타 E를 대장균의 기지 농도에 대해 플롯팅한 실시예 30에서 얻어진 결과의 그래프이다. 16 is a graph of the results obtained in Example 30 plotted against the delta E the known concentration of E. coli. 도 17은 본 발명에서 사용될 수 있는 측방 유동 분석 장치의 한 실시양태의 상면도이다. Figure 17 is a top view of one embodiment of a lateral flow assay device that may be used in the present invention. 본 명세서 및 도면에서 참조 기호를 반복 사용하는 것은 본 발명의 동일하거나 유사한 특징 또는 요소를 나타내기 위함이다. The repeated use of reference characters in the present specification and drawings is intended to represent same or analogous features or elements of the invention. 본 발명은 세균 및 기타 미생물의 검출을 포함하며 본원에서 "미생물"이란 용어의 사용은 세균, 효모 및 곰팡이와 같은 진균, 및 바이러스를 포함하는 것으로 이해되어야 한다. The invention includes the detection of bacteria and other microorganisms, and herein, the term "microorganism" used in the term is intended to include fungi, and viruses, such as bacteria, yeast and mold. 수천개의 다양한 종류의 세균이 존재한다. Thousands of different types of bacteria are present. 몇몇은 단지 미미하게 상이하여 고도로 훈련된 사람만이 그들을 확인할 수 있다. Some people have only a negligible differently by highly trained to check them. 또한, 성장 양태 및 외형상 큰 차이가 있어 매우 용이하게 확인할 수 있는 군도 있다. Further, the islands to check very easily got a growth aspects and outer shape difference. 사소한 차이점을 무시하면, 대부분의 세균은 도 1에 나타낸 5가지의 기본적인 세포 모양에 따라 분류될 수 있다. Ignoring the minor differences, most bacteria can be classified according to the five basic cell shapes of shown in Fig. 도 1의 좌측에서부터 우측으로 구형 또는 구균, 막대형 또는 간균, 나선형 또는 나선균, 콤마형 또는 비브리오균 및 사상균의 형태이다. FIG spherical or bacteria from the left to the right of Figure 1, in the form of a bar or rod, spiral or spirillum, comma-like or parahaemolyticus and fungi. 그들의 서로 다른 모양 외에도, 그들의 세포 배열이 쌍구균, 연쇄상 구균 및 포도상 구균 (도 2에서 좌측에서부터 우측으로)으로 서로 다르다. In addition to their different shapes, their cell arrangement is different from each other in (to the right from the left in Fig. 2) ssanggugyun, Streptococcus and Staphylococcus. 예를 들어, 몇몇 구균은 항상 쌍으로 모여있다 (쌍구균). For example, some cocci are always assembled in pairs (ssanggugyun). 다른 것들은 사슬 모양으로 배열되어 있다 (연쇄상 구균). Others are arranged in a chain shape (streptococci). 또다른 것들은 다발지어 있다 (포도상 구균). While others are built bundle (Staphylococcus aureus). 쌍구균은 폐렴을 일으키는 것으로 알려져 있다. Ssanggugyun are known to cause pneumonia. 연쇄상 구균은 종종 "연쇄구균 인두염"과 관련있다. Streptococcus is often associated with "strep throat". 포도상 구균은 "포도상구균 감염증"과 몇몇 종류의 식중독에서의 그들의 역할 때문에 많은 사람들에게 잘 알려져 있다. Staphylococcus aureus is well known to many people because of "staph infection" and their role in some types of food poisoning. 또한 세균은 크기에 있어서도 어느 정도 차이가 있으나, 평균적으로 세균마다 약 1/25,000 인치 (2.54 cm)이다. In addition, bacteria is also to some extent, but the difference, on average, bacterial about 1 / 25,000 inch (2.54 cm) each in size. 다른 말로 하면, 25,000개의 세균을 옆으로 늘어 놓았을 때 일직선으로 단지 1 인치밖에 안 된다. In other words, it is not just a straight line only one inch when you place an increase of 25,000 bacteria to the side. 9조 마리의 평균 크기의 세균을 담기 위해서 1 입방 인치면 충분하다 -- 지구상 모든 사람에게 약 3,000마리의 세균이 있다. 9000000000000 Marie is one cubic inch is enough to Add to bacteria of the average size - there are about 3,000 horses germs to anyone on the planet. 최신 분자 생물학 개념에 기초한 세균의 하위 분류의 이론적 원리에 관하여 많은 논의가 있으나, 실지 미생물학자가 하위 분류하는 신속한 수단은 그람 반응 (세균을 분류하기 위한 염색법) 및 형태학을 기초로 한다. Although discussed with reference to a number of theoretical principles of sub-classification of the bacterium based on the most recent molecular biological concepts, practical means for rapid microbiology self subdivision is based on the (staining method to classify bacteria) and morphology, gram-reaction. 그람-양성 세균은 알콜 또는 아세톤 존재하에서 크리스탈 바이올렛 염색액을 유지한다. Gram-positive bacteria retain crystal violet dye under an alcohol or acetone present. 이들은 중요한 속을 포함한다: 액티노마이세스( Actinomyces ), 바실러스( Bacillus ), 비피도박테리움( Bifidobacterium ), 셀룰로모나스( Cellulomonas ), 클로스트리디움( Clostridium ), 코리네박테리움( Corynebacterium ), 마이크로코쿠스( Micrococcus ), 미코박테리움( Mycobacterium ), 노카르디아( Nocardia ), 스타필로코쿠스( Staphylococcus ), 스트렙토코쿠스( Streptococcus ) 및 스트렙토마이세스( Streptomyces ). These include a major in: liquid Tino Mai Seth (Actinomyces), Bacillus (Bacillus), Bifidobacterium (Bifidobacterium), cellulose Monastir (Cellulomonas), Clostridium (Clostridium), Corynebacterium (Corynebacterium), microcode kusu (Micrococcus), Mycobacterium (Mycobacterium), no carboxylic Dia (Nocardia), Staphylococcus (Staphylococcus), Streptococcus (Streptococcus) and Streptomyces (Streptomyces). 몇몇 그람-양성 세균, 특히 코리네박테리움, 미코박테리움 및 노카르디아 속의 것들은 산 존재하에서도 염료를 유지한다. Some gram-positive bacteria ones, in particular Corynebacterium, Mycobacterium, and in the no-carboxylic dia maintains also under acid dyes present. 이들은 항산성균으로 알려져 있다. These are known as hangsanseonggyun. 그람-음성 세균은 알콜 또는 아세톤 존재하에서 크리스탈 바이올렛 염색액을 유지하지 않는다. Gram-negative bacteria do not retain the crystal violet dye solution under an alcohol or acetone present. 이들은 중요한 속을 포함한다: 아세토박터( Acetobacter ), 아그로박테리움( Agrobacterium ), 알카리지너스( Alcaligenes ), 보르데텔라( Bordetella ), 브루셀라( Brucella ), 캄피로박터( Campylobacter ), 카울로박터( Caulobacter ), 엔테로박터( Enterobacter ), 에르위니아( Erwinia ), 에스케리키아( Escherichia ), 헬리코박테리움( Helicobacterium ), 레지오넬라( Legionella ), 네세리아( Nesseria ), 니트로박트( Nitrobact ), 파스퇴렐리아( Pasteurelia ), 슈도모나스( Pseudomonas ), 리조비움( Rhizobium ), 리켓시아( Rickettsia ), 살모넬라( Salmonella ), 시겔라( Shigella ), 티오바실러스( Thiobacilus ), 베이엘로니엘라( Veiellonealla ), 비브리오( Vibrio ), 크산토모나스( Xanthomonas ) 및 예르시니아( Yersinia ). These include a major in: acetonitrile bakteo (Acetobacter), Agrobacterium (Agrobacterium), alkaline jineoseu (Alcaligenes), Bordetella (Bordetella), brucellosis (Brucella), Kam fatigue bakteo (Campylobacter), bakteo (Caulobacter a cowl ), Enterobacter (Enterobacter), El Winiah (Erwinia), Escherichia (Escherichia), Halley M. Te Leeum (Helicobacterium), Legionella (Legionella), four ceria (Nesseria), nitro bakteu (Nitrobact), Paz compost Lely ah (Pasteurelia), Pseudomonas (Pseudomonas), Rizzo Away (Rhizobium), riket Asia (Rickettsia), Salmonella (Salmonella), Shigella (Shigella), TiO bacillus (Thiobacilus), Bay Ilo you Ella (Veiellonealla), Vibrio (Vibrio) , Xanthomonas (Xanthomonas) and Yersinia (Yersinia). 세균의 막은 일반적으로 지질당의 지질 이중층으로 이루어져 있다. A film of bacteria generally consists lipid per lipid bilayer. 그람-음성 세균과 그람-양성 세균의 세포막, 즉 세포벽 사이에는 차이점이 있다. Gram-there are differences between the cell membranes of the positive bacteria, namely cell wall-negative bacteria and gram. 그람-음성 세균의 세포벽은 별개의 층으로 이루어진 얇은 구조로 되어 있다. Gram-negative bacteria cell walls are as thin structure consisting of distinct layers. 전형적인 3층 구조를 가지며 세포질 막과 유사한 조성을 갖는 외층이 있다. It has a typical three-layer structure has a layer having a composition similar to the cytoplasmic membrane. 그람-음성 세균의 세포벽의 주성분은 지질다당류이다. Gram-negative bacteria, is a major component of the cell wall of lipopolysaccharide. 또한 인지질, 단백질, 지단백질 및 소량의 펩티도글리칸이 존재한다. In addition, there are also a phospholipid glycan peptidomimetic, protein, lipoprotein and a small amount. 지질다당류는 다당류 잔기의 반복 단위가 부착되어 있는 코어 부위로 이루어진다. Lipopolysaccharide comprises a core region that has a repeating unit of the polysaccharide moiety attached. 대부분의 그람-음성 세균의 세포벽을 이루는 성분은, 그람-음성 감염으로 인한 발열성 효과와 연관있는 내독소 활성과 관련있다. Most Gram-component constituting the cell wall of negative bacteria are gram-endotoxin activity which is related to the related to the exothermic effects of the negative infection. 이러한 유기체의 균체 항원 특이성을 위한 근거는 측쇄 위에 존재하고 있다. Basis for cell antigen specificity of these organisms are present on the side chains. 상이한 당류의 배열뿐만 아니라 성분 측면에서 이러한 측쇄의 화학 조성이 균체 또는 O-항원 결정요소의 성질을 결정하고, 이는 수많은 그람-음성 종을 혈청학적으로 분류하는 중요한 수단이다. The chemical composition of these side chains, as well as arrangement of the different sugars determines the nature of the side components in the cell or O- antigenic determinants, which in many gram-negative species is an important means to classify the serological. 많은 경우에, 상이한 종에 속하는 특정 유기체가 강력한 혈청학적 교차 반응성을 제공하는 이유는, 화학적으로 유사한 탄수화물 잔기를 지질다당류 측쇄의 일부로 갖기 때문이고, 이것은 일반적으로 약 30개의 반복 단위를 갖는다. In many cases, the reason to offer a strong serological cross-reactivity certain organisms belonging to different species, and they have a similar carbohydrate moieties as part of the chemical lipopolysaccharide side chains, which generally have about 30 repeating units. 그람-양성 세균은 세포벽 구조의 일부로서 펩티도글리칸 및 다당류 및/또는 테이코산을 갖는 것을 특징으로 한다. Gram-positive bacteria are characterized by having the peptidoglycan and polysaccharide and / or table Kosan as part of the cell wall structure. 종종 무레인이라고도 불리는 펩티도글리칸은 짧은 펩티드를 통해 서로 가교된 글리칸 스트랜드의 헤테로폴리머이다. Often peptidoglycan, also known as the stuffiness is a a hetero polymer of glycan strands cross-linked to each other via a short peptide. 무레인의 기본 골격은 베타-1,4-연결되며 교대하는 N-아세틸글루코사민과 N-아세틸 무람산 잔기의 사슬이다. The fundamental structure of the stuffiness is a chain of N- acetylglucosamine and N- acetyl muram acid residues linking 1,4-beta and alternately. 무람산은 세균의 세포벽과 회합된 특이한 물질이다. Muram acid is a cell wall with a unique association substance of the bacteria. 이러한 사슬은 L- 및 D- 아미노산들로 이루어진 짧은 폴리펩티드 사슬에 의해 가교된다. These chains are cross-linked by a short polypeptide chain consisting of the L- and D- amino acids. 그람-음성 세균에서는 펩티도글리칸이 구조가 단순하고 대부분의 속에서 비교적 균일한 반면, 그람-양성 세균에서는 구조와 조성에 있어서 매우 큰 차이가 있다. Gram-positive bacteria in a composition of the structure and significant differences - in negative bacterial peptidoglycan the structure is simple, relatively uniform, while in most of the gram-in. 일반적으로 펩티도글리칸은 다층을 이루고 있다. In general, peptidoglycan may form the multiple layers. 또한 몇몇 군에서는 조성에 있어 몇가지 미미한 차이가 기록되었다. In addition, several groups have been recorded some minor differences in the composition. 따라서, 미코박테리움 및 노카르디아는 무람산의 N-아세틸 잔기가 산화된 형태의 N-글리콜릴로 대체되어 있다. Thus, Mycobacterium and no carboxylic dia has N- acetylglucosamine residues of the acid is replaced muram of N- glycol reel oxidized form. 폴리펩티드 줄기와 가교 양쪽의 아미노산 조성은 다른 군 사이에서는 광범위하게 다를 수 있다. Amino acid composition of the polypeptide and the stem cross-linking, both of which may vary widely between the different groups. 이러한 차이는 이들 유기체 분류의 기초를 이룬다. These differences form the basis of the classification of these organisms. 곰팡이 및 효모는 진균계에 속하는 유기체이다. Fungal and yeast organisms are fungi belonging to the system. 비록 수많은 곰팡이와 진균이 인간에게 유익하나, 몇몇은 병원성이며 중독을 일으키거나 사망에 이르게 할 수 있는 유해한 진균독을 방출할 수 있다. Although a number of one mold and fungi beneficial to humans, some are pathogenic and can cause addiction or emit harmful fungi poison that can cause death. 효모 또한 감염을 일으킬 수 있으며, 가장 널리 알려진 것은 효모균 질염일 것이다. Yeast can also cause infection, it will be the most well-known yeast vaginitis. 접합균류는 검은 빵곰팡이, 및 식물 및 동물과 공생 관계를 갖고 있는 다른 곰팡이들을 포함하는 진균 강이다. Zygomycota is a fungal River that includes black bread mold and other fungi, and plants and animals that have a symbiotic relationship. 이러한 곰팡이들은 융합하여 단단한 "접합포자"를 형성할 수 있다. This mold can be fused to form a rigid "joint spores". 자낭균류는 진균의 한 강이며, 효모, 흰가루병균, 검은 곰팡이 및 청녹색 곰팡이, 및 느릅나무병(Dutch elm disease), 사과나무검은별무늬병(apple scab) 및 맥각병과 같은 질병을 일으킬 수 있는 몇몇 종을 포함한다. Ascomycetes is a river of fungi, yeast, mildew fungus, black fungus and blue-green mold, and the elm disease (Dutch elm disease), Apple Tree Black byeolmunui Bottle (apple scab) and several species that can cause diseases such as ergot It includes. 이러한 진균의 생활사는 유성 생식과 무성 생식을 조합하고, 균사는 핵 및 세포질의 통과가 가능한 다공성의 벽으로 분할된다. The life of a fungi live combination of sexual reproduction and asexual reproduction and the hyphae are divided into the nucleus and the porous wall of the possible passage of the cytoplasm. 불완전균류는 또다른 강의 진균으로, 앞서 언급한 강이나 담자균류 강 (대부분의 버섯, 소공 진균(pore fungi) 및 말불버섯(puffball fungi)을 포함함)에 쉽게 일치하지 않는 여러 종의 진균 집합을 포함한다. Imperfect fungi Another lesson fungi, mentioned a river or Basidiomycetes river several species of fungi collection of mismatched easily (including most of the mushroom, pore fungus (pore fungi) and fuzz-ball (puffball fungi)) It includes. 이러한 불완전균류는 치즈 및 페니실린을 생산하는 종을 포함하나, 또한 무좀 및 백선의 원인이 되는 것과 같은 병원성 종류도 포함한다. One such imperfect fungus comprises a species of producing cheese and penicillin, but also includes the pathogenic types, such as that caused the athlete's foot and ringworm. 최근 생물의학 분야에서 염료의 사용은 연구에서의 관심과 기술적 중요성 측면에서 괄목할만한 성장을 보여왔다. Recent biological use of dyes in medicine has shown a remarkable growth in the interest and importance of the technical aspects of the study. 염료는 예를 들면, 분석 생화학, 의학적 진단과 심지어는 질병의 치료 및 예방과 같은 수많은 분야에서 사용된다. Dyes, for example, biochemical analysis, medical diagnosis, and even can be used in many areas such as prevention and treatment of disease. 이러한 염료의 색은 특정 응용 분야 뿐만 아니라 분광학적 검출 (미국 특허 제5,036,000호) 및 체액 분석 대상물의 측정 (유럽 특허 제0 250 700호)을 위한 단순 유기 반응에서부터 종양의 검출을 위한 고 정밀 영상기술 (Motohashi, Med. Res. Rev., 11, 239, 1991)에 이르는 분야에서 필수적이다. Color of such a dye is not only a particular application spectroscopic detection (US Patent No. 5.036 million call) and the body fluid measurement of the analysis object from simple organic reactions for (EP 0 250 700 call) and for the detection of tumor precision imaging techniques It is essential in the field of up to (Motohashi, Med. Res. Rev., 11, 239, 1991). 염료는 또한 질병 치료에 있어 임상적으로 이용될 수도 있다 (미국 특허 제5,468,469호). Dyes can also be got used clinically in the treatment of diseases (US Patent No. 5,468,469). 피부, 머리, 목, 폐 및 식도의 악성 종양과 같은 특정 종류의 암의 치료에 있어, 광역학적 치료법이 성공적으로 사용되었다 (Sedlacek, "The change in research for the therapy of tumors", Chimia, 45, 52, 1991). Skin, head, neck, and in the treatment of certain types of cancer, such as lung and malignant tumors of the esophagus, wide chemical treatments have been used successfully (Sedlacek, "The change in research for the therapy of tumors", Chimia, 45, 52, 1991). 다른 치료적 응용은 염료의 항바이러스성 및 살균성과 연관있다. Other therapeutic applications are associated with antiviral and disinfectant of the dye. 염료는 또한 조직학, 형광 바이오라벨링(biolabeling) 및 형광 바이오프로브(bioprobe)의 중요 분야에서 핵심 성분이다. Dye is also a key component in the important areas of histology, fluorescent labeled bio (biolabeling) and a fluorescent probe bio (bioprobe). 이와 연관된 기술들은 매우 복잡하며 염색, 세척 및 교차 염색을 필요로 한다 (Blum, "Photodynamic action and disease caused by light", Reinhold, New York, 3, 1941). This will be the associated technologies are very complex and require staining, washing and cross-staining (Blum, "Photodynamic action and disease caused by light", Reinhold, New York, 3, 1941). 본 발명자들은 특정 착색제를 사용함으로써 미생물-지시 스프레이와 신속한 미생물 정량법을 달성할 수 있음을 발견하였다. The present inventors have found that by using a specific colorant microorganism has been found that to achieve the directed spray and rapid microbial assay method. 본 기술의 잠재적 응용 범위는 주방용 조리대, 손, 의료 구역, 욕실, 침대의 가로널, 의료 용구, 수술대, 가정용품, 주방, 음식물, 음식 조리대 표면, 식품 가공 설비, 문 손잡이, 전화기 및 컴퓨터 키보드와 같은 고체 표면 상에서의 미생물의 검출을 포함하나 이에 한정되지는 않는다. The potential scope of application of this technology, countertops, hand, health area, bathroom, horizontal boards, medical equipment, operating table, housewares, kitchen, food, food countertops surface of a bed, food processing equipment, doorknobs, telephones and computer keyboards and include, microorganism detection on such a solid surface is not limited thereto. 이러한 착색 염료의 코팅물, 스프레이 또는 용액은 세균 및 기타 미생물의 유해 수준에 대하여 감수성이며, 색 변화는 표면의 세정 및/또는 오염제거가 효과적이었는지를 증명하는 시각적 지시 기구로서 이용된다. Such a coating, or spraying a solution of colored dyes are susceptible to harmful levels of bacteria and other microorganisms, the color change is used as a visual indication that the mechanism proves effective yieotneunjireul cleaning and / or decontamination of a surface. 사용되는 염료는 그람-양성 세균과 그람-음성 세균 균주 둘다에 감수성이어야 하기 때문에 지시 기술을 위한 요건이 상당히 엄격하다. Dyes used are gram-positive bacteria and Gram-negative bacteria because they should be susceptible to both isolates the requirements for indicating technique is extremely strict. 염료는 미생물이나 미생물의 대사산물과 신속히 반응해야만 한다. Dye must respond quickly and metabolites of microorganisms or microbes. 최대한의 다목적 용도를 위하여 염료는 효모 및 곰팡이와 같은 기타 미생물에도 감수성이어야 한다. For the most versatile use of the dye should be sensitive to other microorganisms such as yeast and fungi. 앞에서 언급하였듯이, 때때로 세포 및 세균의 확인을 위한 염색액으로서 염료가 이용되어 왔다. As mentioned earlier, it has been sometimes used as a dye staining solution for the identification of cells and bacteria. 염색액이 반응하거나 세포 또는 세균에 의해 선택적으로 계속 유지되어 이들과 백그라운드 또는 존재하는 기타 성분과의 대비를 향상시킴으로써 확인을 돕는다 (Johnson, 1995). Is selectively retained in the dye reaction, or by cells or bacteria helps determine by improving the contrast between them and the background or other components present (Johnson, 1995). 일반적으로 염색액을 표면에 도포하고, 그 후에 미생물의 존재가 드러나도록 진탕하거나 또는 씻어내어 초과분을 제거한다. In general, application of the dye to the surface, and then shaken out or washed so as to reveal the presence of microorganisms to remove the excess. 본 발명자들은 미생물에 노출되거나 미생물과 상호작용하였을 때 색이 변화하는 착색제에 관한 이전의 어떠한 보고도 아는 바 없다. The present inventors do not know bar also exposed to the microorganism or microorganisms and mutual any previous report on the colorant that changes color when working. 용매화발색현상이 관찰되는 색 변화의 원인이 될 수 있으나, 본 발명자들은 하나의 특정 이론에 구애받기를 바라지 않는다. It may cause a color change that is observed for a plum color developer, but the inventors do not wish to receive bound by one particular theory. 용매화발색 염료는 용매의 극성 및/또는 수소 결합의 성향과 같은 분자적 환경이 변화할 때 색 변화가 일어난다. Solvation chromogenic dyes include a color change takes place when the molecular environment, such as polar and / or hydrogen-bonding nature of the solvent changes. 예를 들어, 물과 같은 극성 환경에서 어떤 염료는 청색을 띄고 있으나, 지질-풍부 용액과 같은 비극성 환경에서는 황색이나 적색을 나타낼 수 있다. For example, in a polar environment such as water, which dye, but noticeable blue color, a lipid-rich solution in a non-polar environment such as may be represented by a yellow or red. 이와 같은 "적절한 염료"에 의한 색의 발현은, 하기에 더욱 상세히 기재된 염료의 바닥 상태와 들뜬 상태 간의 분자 극성 차이에 좌우된다. Such a color expressed by the "appropriate dyes" are, to be more fully depends on the molecular polarity difference between the ground state and the excited state of the dye described. 레이차트 염료가 연구를 위한 모델 염료로 선택되었다. Ray Chart dye was selected as a model dye for research. i) 세균 또는 기타 미생물에 의해 탈색되는 염료의 양은 염료에 노출되는 미생물의 농도와 상관관계를 가질 수 있고, 이는 본 방법이 정성적인 것에 대비한 정량적임을 시사한다. i) may have a correlation with the concentration of microorganisms exposed to the dye quantity of the dye decolorized by bacteria or other microorganisms, which suggests that the quantitative preparation for the method of the crystalline. ii) 그람-양성 세균, 그람-음성 세균, 효모 및 곰팡이를 비롯한 일련의 미생물이 검출될 수 있다. ii) Gram-positive bacteria, Gram-can be a series of micro-organisms, including the negative bacteria, yeasts and molds is detected. iii) 시험용 염료는 건조 막 코팅물로서 또는 세균 함유 액체에 첨가되는 용액으로서, 또는 스프레이-온(spray-on) 검출기 시스템으로서 사용될 수 있다. iii) The test is a dye solution which is added to a dry film coating or a bacteria-containing liquid, or a spray may be used as a whole (spray-on) the detector system. iv) 예를 들어 종이 타월이나 에나멜 표면상에서 건조 코팅물로서 사용될 경우, 이러한 염료가 그로부터 도포되어지는 용매의 성질은 검출 염료의 성능 (탈색 시간, 탈색 영역과 비탈색 영역 간의 대비, 및 감도)에 유의하게 영향을 미친다. To iv), for example when used as a dry coating on a paper towel or enamel surface, the nature of the solvent is such a dye is applied from which the performance of the detecting dye (contrast between the color of time, fading region and the non-decolorized areas, and sensitivity) significantly affected. v) 예를 들어 종이 타월상에서 건조 코팅물로서 사용될 경우, 염료와 함께 코팅물에 포함된 첨가제는 검출 염료의 성능 (탈색 시간, 탈색 영역과 비탈색 영역 간의 대비 및 감도)에 영향을 미칠 수 있다. v) For example, when used as a dry coating on a paper towel, additives included in the coating with the dye may impact the contrast and sensitivity of performance of the detecting dye (color fading time, fading region and the non-decolorized areas) . 예를 들어 히드록시프로필-베타-시클로덱스트린은 검출 염료의 성능을 향상시킨다. For example, hydroxypropyl-beta-cyclodextrin enhances the performance of the detecting dye. vi) 이들 염료의 세균 유도 탈색은 강염기를 사용하여 역전될 수 있다. vi) the bacteria induced decolorization of these dyes may be reversed using a strong base. 용매화발색현상이 관찰되는 색 변화에 기여할 수 있으나, 이러한 관찰 결과는 또한 다른 합당한 메카니즘과 양립할 수도 있다. For but may contribute to the color change that plum color development observed, these observations may also be consistent with other proper mechanism. 예를 들어, 이러한 관찰 결과는 또한 세균의 존재로 인한 염료의 색 변화에 기여할 수 있는 몇몇 유형의 산-염기 상호작용이나, 몇몇 유형의 양성자 공여 반응과 양립할 수도 있다. For example, this observation is also some type of acid that can contribute to the color change of the dye due to the presence of the bacteria - may be incompatible with the base interaction, or some types of proton-donating reaction. 본 발명자들은 또한, 특정 염료가 일련의 미생물들에 노출되었을 때, 산화환원 유형의 반응이 감지되는 색 변화에 기여할 수도 있다는 가능성을 완전히 배제하지 않았다. The inventors have also did not rule out the possibility that a specific dye when exposed to a range of microorganisms, may also contribute to the color changes of redox type reaction detected. 다른 요인들 또한 미생물의 존재하에서 특정 염료로 관찰되는 색 변화에 기여할 수 있으며, 예를 들면 색 변화를 일으키는 특정 염료와 세포막의 일부의 상호작용이 있을 수 있다. Other factors also may contribute to the color changes observed with certain dyes in the presence of a microorganism and includes, for example, be a part of the interaction of the specific dye and the cell membrane to cause a color change. 그러나 또다른 가능성은 세균의 세포벽에 있는 매우 조직화된 산 잔기가 특정 지시제 염료를 양성자화할 수 있으며, 그 결과 색이 소실된다는 것이다. However, another possibility is that the highly organized acid moieties on the cell wall of the bacterium may be a proton hwahal dye specific instructions, is that the resulting color is lost. 본 발명자들은 놀랍고도 아직까지 설명되지 않은 현상을 발견하였고, 이들을 사용하여 여러 미생물을 검출하고 정량화하는데 유용한 방법을 개발하였다. The present inventors have found the surprising and has not yet been described so phenomenon, we developed a useful method for detecting and quantifying the number of microorganisms by using them. 일반적으로 색 변화의 시각적 검출과 관련하여, "색"이라는 것은 물체로부터 반사되거나 방사되는 가시 영역의 여러 파장의 광의 존재 또는 부재를 인간 눈의 기구가 감지할 때 발생하는 지각의 한 종류이다. In general, related to the visual detection of the color change, it is called "color" is a kind of crust that occurs when the mechanism of the human eye detects the presence or absence of light of various wavelengths in the visible region which is reflected or emitted from the object. 눈에 들어온 광은 가시 스펙트럼의 특정 영역에 대해 감수성인 망막의 3종류의 추상세포에 의해 분광학적으로 분석된다. Light entering the eye is optically analyzed in minutes by the three kinds of abstract cells of the retina is sensitive to a particular region of the visible spectrum. 이러한 세포로부터의 자극은 차례로 망막 뉴런, 시신경 뉴런 및 시각령에 의해 처리되어 색의 지각이 일어난다. Irritation from these cells are in turn processed by retinal neurons, optic nerve neurons and the visual command causing a color perception. 색을 부여하는 몇몇 메카니즘 (예를 들면, 흡광, 방사, 형광, 인광, 굴절, 회절 등)이 있으나, 적절한 것은 흡광에 의한 색에 집중되어 있다. Several mechanisms to impart color (for example, absorption, emission, fluorescence, phosphorescence, refraction, diffraction, etc.). However, it is concentrated in the appropriate color according to the light absorption. 다른 말로 하면, 본 발명은 광의 특정 파장을 흡수함으로써 그들의 색을 나타내는 염료에 관련되어 있다. In other words, the invention is related to a dye indicates their color by absorbing certain wavelengths of light. 인간의 눈이 기능하는 방식 때문에, 감지되는 색은 일반적으로 물체에 의해 흡수되는 파장의 광과 보색 관계이다. Because of the way in which the human eye functions, the color to be detected is generally light and the complementary color of the wavelength relationship it is absorbed by the object. 예를 들어, 백색광 아래에서 볼 때 적색으로 보이는 물체는, 실제로는 490 내지 500 nm 파장 범위의 청색광을 선택적으로 흡수하는 것이다. For example, the object appears to be red when viewed under white light, the fact is to selectively absorb the blue light of 490 to 500 nm wavelength range. 이와 유사하게, 백색광 아래에서 볼 때 황색으로 보이는 물체는, 실제로는 435 내지 480 nm 범위의 청색광을 흡수하는 것이다. Similarly, it is shown in yellow when viewed under white light objects, in fact, to absorb blue light of 435 to 480 nm range. 식 중, E = 에너지, h = 플랭크 상수, ν = 흡수된 광의 광자의 진동수이며, 이는 파장 λ 및 광의 속도 c와 하기 식의 상관관계가 있다. Wherein, E = it is the frequency of the energy, h = Planck constant, ν = the absorbed photon of light, which is correlated to the wavelength λ and the light speed c equation relationship. 명백히, 흡수된 광자의 에너지는 광자의 파장에 반비례한다. Obviously, the energy of the absorbed photon is inversely proportional to the wavelength of the photon. 따라서 청색 광 (435 내지 480 nm)의 광자는 황색광 (580 내지 595 nm)보다 큰 에너지를 갖고 있다. Thus, photons of blue light (435 to 480 nm) has a higher energy than yellow light (580 to 595 nm). 따라서, 백색광 아래에서 봤을 때 용액이나 물체 상의 염료의 색은 염료 분자의 바닥 상태와 첫번째 허용된 들뜬 상태 간의 전이 에너지에 의해 결정된다. Therefore, the color of the dye solution or on an object when viewed under white light is determined by the transition energy between the first allowed excited state and the ground state of the dye molecule. 염료의 광 흡수 부위는 일반적으로 그 염료의 색소원으로 알려져 있다. The light absorbing portion of the dye is more commonly known as a dye source of the dye. 색소원은 콘쥬게이션계와 연결된 발색단을 포함한다. The coloring agent comprising a chromophore associated with the conjugation system. 발색단은 근본적으로 염료를 발색시키는 작용기이며 그 예로, 아조 염료 경우에는 아조기, 카로틴의 경우에는 폴리엔기, 안트라퀴논 염료 경우에는 카르보닐기가 있다. Chromophore is essentially functional groups of the coloring dye and Examples, the azo dye case, there is a carbonyl group when the azo group, carotene when polyene group, an anthraquinone dye. 그외의 발색단이 다수 있다. The other has a large number of chromophores. 조색단은 콘쥬게이션된 색소원에 작용함으로써 염료의 색과 강도에 영향을 준다. Toning stage by acting on the dye-ligated circles conjugate affects the color and intensity of the dye. 조색단은 색소원과 콘쥬게이션될 수도 있거나 그렇지 않을 수도 있다. Goldenrod stage may or may not be ligated or conjugated with dye source. 일례로 아미노기는 예를 들어, 벤젠 고리를 통하여 아조기 (발색단)와 콘쥬게이션되어 아미노아조 색소원을 형성할 것이다. One example with an amino group are, for example, will form an azo group (chromophore) and the conjugation is amino azo dye source through the benzene rings. 콘쥬게이션된 아미노 조색단은 아조기의 흡수대를 보다 긴 파장으로 변위시키고 흡수대의 강도를 증가시킨다. Conjugated amino auxochrome displaces the absorption band of the azo group to longer wavelengths and increasing the intensity of the absorption band. 그러나 아미노 아조 색소원에 술폰산기를 적절하게 배치시키면 콘쥬게이션되지는 않지만, 전자를 끌어당기는 효과로 흡수를 보다 긴 파장으로 변위시킨다. However, when properly placed amino azo dye in an acid source displaces with the absorption wavelength is longer than a pulling effect, but are not ligated conjugate, drag e.
바닥 상태가 들뜬 상태보다 더 극성인 염료의 예로는 하기 나타낸 메로시아닌 염료 1이 있다. 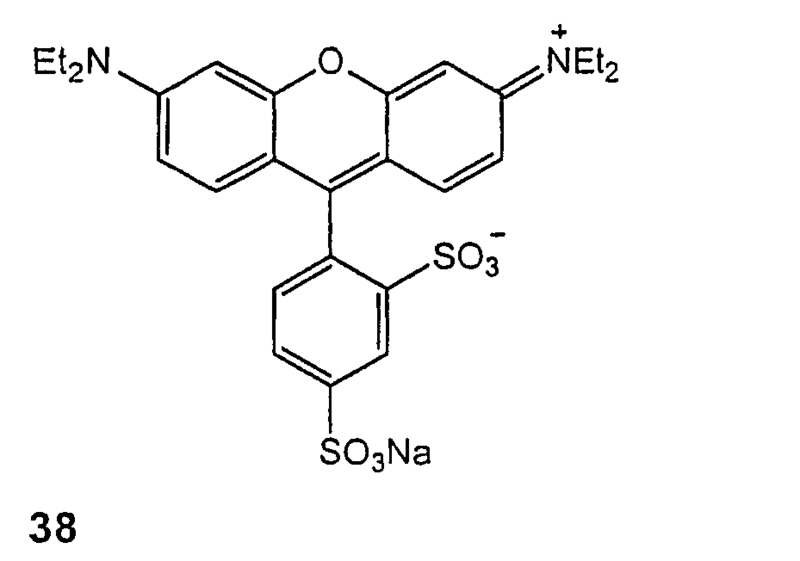 Examples of the dye are in the ground state more polar than the excited state is the merocyanine dye 1 as shown below. 전하-분리된 좌측의 카노니칼 1은 바닥 상태의 주요 기여체인 반면, 우측의 카노니칼 1'은 첫번째 들뜬 상태의 주요 기여체이다. Charge -carbamic say knife 1 of the separated left, while the main contribution chains of the ground state, the right side of the car say knife 1 'is a major contribution of the body first excited state. 하기 나타낸 인디고 2는 바닥 상태가 들뜬 상태보다 극성이 현저히 낮은 염료의 한 예이다. To Indigo 2 shown is an example of a significantly lower polarity than the dye excited state is the ground state. 좌측의 카노니칼 형태 2는 염료의 바닥 상태의 주요 기여체인 반면, 우측의 카노니칼 2'는 들뜬 상태의 주요 기여체이다. Car say in the form of a knife 2, while the left main contributes chains of the ground state of the dye, 2 car say knife to the right, is the main contribution of the body excited state. 본 발명의 실시에 적합한 염료는 상기 기재된 것들 뿐만 아니라 레이차트 염료, 메로시아닌 염료, 연속된 π 전자계 안에 형식 양전하와 음전하를 지닌 양쪽성 이온 염료, 4-[2-N-치환-1,4-히드로피리딘-4-일리딘)에틸리덴]시클로헥사-2,5-디엔-1-온, 적색 피라졸론 염료, 아조메틴 염료, 인도아닐린 염료, 디아자메로시아닌 염료 및 이들의 혼합물을 포함한다. Dyes suitable for the practice of the present invention are zwitterions having the dye dyes, form positive and negative charges in a series of π electron system, not during ray chart dyes, booties, as well as those described above, 4- [2-N- substituted-1,4 -dihydro-4-sense Dean) ethylidene] cyclohexanone-2,5-dien-1-one, red pyrazolone dyes, azomethine dyes, aniline dyes India, diaza including dyes and mixtures thereof merocyanine do. 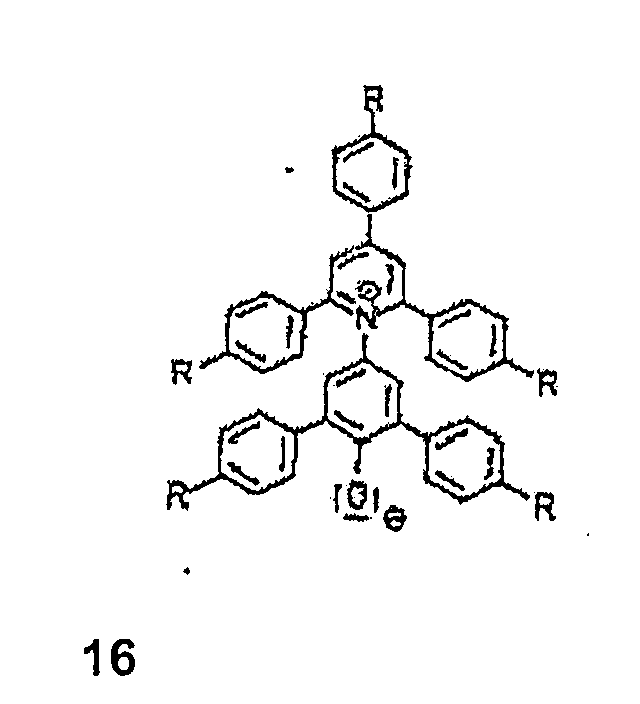 메로시아닌 염료는 문헌 ["Colour and Constitution of Organic Molecules", Academic Press (London) 1976]에 논의된 그리피트(Griffiths)의 공여체-단순 수용체 색소원 분류 내에 속하고, 여기에서 카르보닐기는 전자 수용체 잔기로서 작용한다. 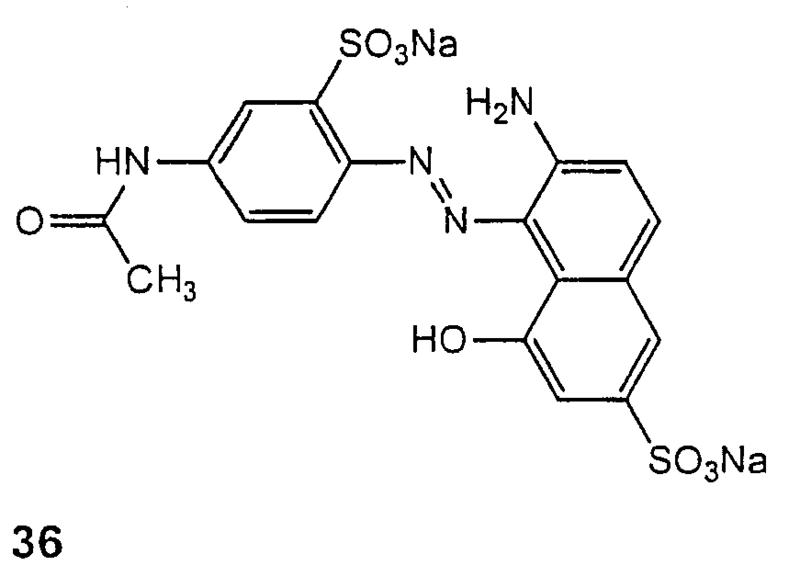 Dyes merocyanine may be found in [ "Colour and Constitution of Organic Molecules", Academic Press (London) 1976] The draw donor of feet (Griffiths) discussed - and is within simple acceptor dye source category, here in the group is an electron acceptor moiety It acts as a. 전자 수용체는 예를 들어 히드록실기 또는 아미노기와 같이 전자를 공여할 수 있는 전자 공여기와 콘쥬게이션되어 있다. Electron acceptor, for example, electron-is ligated with this conjugate capable of donating electrons, such as a hydroxyl group or an amino group. 메로시아닌 염료는 화학식 3과 같은 구조를 포함하는 비교적 광범위한 부류의 염료이며, 여기서 헤테로시클릭 시스템 안의 질소 원자는 공여체로서 작용한다. Merocyanine dye is a dye of relatively wide class including the same structure as the general formula (3), wherein the nitrogen atom in a heterocyclic system serves as a donor. n은 0을 포함하는 어떠한 정수도 될 수 있다. n can be any integer including zero. 메로시아닌 염료는 전하가 분리 (양쪽성 이온)된 공명 형태를 갖는다. Merocyanine dyes have the resonance form charge separated (zwitterions). 비닐계 아미드를 비롯한 아시클릭 메로시아닌 염료 또한 알려져 있다. 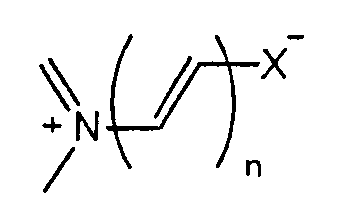 Dyes not know cyclic booties, including vinyl amides are also known. 메로시아닌 염료는 사진 필름에 사용될 때 특정 파장의 광에 대하여 할로겐화 은을 광감작화하는 그의 능력 때문에 연구되었다. Merocyanine dyes have been investigated because of their ability to drawing photosensitive halide is with respect to light of a particular wavelength when it is used in the photographic film. 수많은 메로시아닌 염료의 구조가 알려져 있다. The structure of a number of non-Melo dye when it is known. 화학식 4 내지 14는 메로시아닌 염료의 몇 가지 비-제한적인 예를 보여준다. Formula 4 to 14 are some of the ratio of the dyes merocyanine - shows a limiting example. 이들 염료 각각에 대하여, 전하 분리된 공명 구조를 유도할 수 있음을 주목한다. For each of these dyes, and may be induced to separate the charge resonance structure. 참조문헌이 전하 분리된 (양쪽성 이온) 형태가 염료의 바닥 상태에 유의하게 기여하고 있음을 설명하고 있다. This reference has a discrete (zwitterion) form of the charge demonstrates that contributes significantly to the ground state of the dye. 식 중, R은 메틸, 알킬, 아릴, 페닐 등일 수 있다. In the formula, R may be a methyl, alkyl, aryl, phenyl. 특정 염료는 영구적으로 양쪽성 이온 형태로 제조될 수 있다. Specific dyes may be made of a zwitterion form permanently. 다시 말해서, 이들 염료는 π-전자계와 회합된 영구 전하를 갖고 있으며, 색소원의 중성 공명 구조를 유도할 수 없다. That is, these dyes may have a π- electron system and an associated permanent electric charge, it is not possible to derive a neutral resonance structure of the dye source. 이러한 염료는 일반 화학식 16에 부합하는 레이차트 염료 15를 포함한다. Such dyes include the dyes ray chart 15 consistent with the general formula (16). 레이차트 염료 외에, 적합한 음성 용매화발색 피리디늄 N-페놀레이트 베타인 염료의 또다른 예는 하기 화학식 16 내지 21로 상술되어 있다. In addition to ray chart dyes, suitable for still another example of a voice plum color pyridinium N- phenolate betaine dyes is to is described by the general formula 16 to 21. 식 중, R은 수소, -C(CH 3 ) 3 , -CF 3 또는 C 6 F 13 이다. In the formula, R is hydrogen, -C (CH 3) 3, -CF 3 or C 6 F 13. 추가의 비-제한적인 화학식 24 내지 32는 일반 화학식 23에 부합하는 하기를 포함할 수 있다. Add ratio-limiting general formula 24 to 32 may include the following, which conform to general formula 23. 식 중, X는 산소, 탄소, 질소, 황일 수 있다. In the formula, X may be oxygen, carbon, nitrogen, hwangil. 염료의 양은 미생물과 접촉시 육안으로 그 변화를 검출할 수 있을 만큼의 색 변화가 일어날 수 있도록 충분해야 하며, 따라서 염료의 감도에 좌우될 것이다. When the amount of the dye in contact with the microorganism, and should be sufficient to cause a color change as much as it is possible to detect the change with the naked eye, and thus will depend on the sensitivity of the dye. 충분한 것으로 밝혀진 염료의 양은 일반적으로 건조 상태 기준으로 0.001 내지 20 중량％, 몇몇 실시양태에서는 0.01 내지 10 중량％, 몇몇 실시양태에서는 0.05 내지 5 중량％, 몇몇 실시양태에서는 0.1 내지 3 중량％이다. The amount of dye found to be sufficient is generally from 0.001 to 20% by weight, dry basis, in some embodiments from 0.01 to 10% by weight, and in some embodiments 0.05 to 5% by weight, in some embodiments in the range of 0.1 to 3% by weight. 색 변화는 미생물의 농도 및 유형에 의존되는 방식으로 매우 신속하게 일어난다. Color change takes place very rapidly in a manner that depends on the concentration and type of microorganism. 조성물은 상기 기재된 바와 같이 미생물-감수성 착색제 및 이동상을 포함한다. Microbial compositions as described above - comprises a colorant susceptible and mobile phase. "이동상"이라는 용어는 착색제를 위한 담체로서 사용될 수 있는 액체 및 기체를 포함한다. The term "mobile phase" includes liquids and gases that may be used as carriers for the colorant. 아세토니트릴, 테트라히드라푸란; Acetonitrile, tetra hydra furan; 크실렌; xylene; 포름알데히드 (예를 들면, 디메틸포름아미드), 및 알콜 (예를 들면, 메탄올, 에탄올, n-프로판올 및 이소프로판올)이 적합한 담체인 것으로 밝혀졌으나, 어떤 효과적인 담체라도 사용될 수 있다. Formaldehyde (e.g., dimethylformamide), and alcohols (e.g., methanol, ethanol, n- propanol, and isopropanol) are jyeoteuna found to be a suitable carrier, which can be used at any effective carrier. 이동상은 추가로 소독제 또는 살균제의 조성물일 수도 있다. The mobile phase may be an additional disinfectant or sanitizer composition of a. 착색제 염료는 미생물의 존재를 나타내도록 표면 상에 분무하거나 문질러 바를 수 있는 액체 형태일 수 있다. Colorant dye may be in a liquid form that can be sprayed or rubbed onto the surface of the bar to indicate the presence of microorganisms. 염료를 함유하는 액체를 표면에 도포할 수 있고, 도포된 액체가 건조되어, 차후에 미생물에 의한 오염에 노출될 수 있는 염료의 건조 잔류물을 형성한다. To applying a liquid containing the dye to the surface, and the applied liquid is dried to subsequently form a dried residue of the dye that may be exposed to contamination by microorganisms. 미생물에 노출 시에, 건조 잔류물은 색이 변화하게 되고, 이는 미생물의 존재를 나타낸다. Upon exposure to the microorganisms, drying the residue and the color changes, which indicate the presence of microorganisms. 색 변화는 본 발명에 따라 신속하게 일어날 수 있다. Color changes can occur rapidly in accordance with the present invention. 예를 들면, 색소원은 약 30분 미만 내에, 몇몇 실시양태에서는 약 5분 미만 내에, 몇몇 실시양태에서는 약 1분 미만 내에, 몇몇 실시양태에서는 약 30초 미만 내에, 몇몇 실시양태에서는 약 10초 미만 내에 색이 변화하기 시작할 수 있다. For example, a pigment agent in the within less than about 30 minutes, in some embodiments in less than about 5 minutes, in a In some embodiments in less than about 1 minute, in some embodiments less than about 30 seconds, in some embodiments about 10 seconds It can begin to color changes in the under. 용액 도포된 염료의 건조 잔류물을 이용하는 그러한 지시 방법은 고체 표면, 예를 들면 미용 화장지 상자와 같은 포장재, 스티커, 종이, 화장지, 의료 용구, 예컨대 수술용 장갑, 수술용 가운 및 드레이프, 안면 마스크, 부팡형 모자(bouffant cap), 수술용 모자 및 두건과 같은 머리 덮개, 검사용 및 수술용 장갑, 구두 싸개, 부츠 싸개 및 슬리퍼와 같은 신발류, 상처 드레싱, 붕대, 멸균 랩, 와이퍼, 실험복, 원피스형 전신 작업복, 에이프런 및 쟈켓과 같은 의복류, 환자용 침구류, 들것 및 유모차 시트, 음식 조리용 랩, 설거지용 스펀지, 클로쓰, 문 손잡이, 전화기, 컴퓨터 키보드, 컴퓨터 마우스, 펜, 연필, 메모장, 화장실 손잡이, 상처 드레싱, 붕대 및 장난감 (예를 들어, 병원 대기실, 탁아시설에 있는)에 사용하기에 유용할 수 있다. Solution such indicating method using the dry residue of the applied dye is a solid surface, for example, cosmetic toilet paper and packing material, such as, stickers, paper, tissues, medical article, for example surgical gloves, surgical gowns and drapes for, face mask, part panghyeong cap (bouffant cap), head covering, such as surgical caps and hood for inspection glove for and surgical, shoes stall, boots envelope and footwear such as slippers, wound dressings, bandages, sterilization wraps, wipers, lab coats, dresses type such as body coveralls, aprons and jackets uibokryu, patient bedding, stretcher and stroller seat, for cooking food wrap, dishwashing sponge cloth for, door knobs, telephones, computer keyboards, computer mouse, a pen, a pencil, a notepad, toilet handle , wound dressings, bandages and toys may be useful to use (for example, hospital waiting rooms, in child care facilities). 따라서, 용매화발색 염료가 코팅될 수 있는 기재는 와이프 뿐만 아니라 상기 언급한 것과 같은 세균에 노출될 수 있는 기타 물품들을 포함할 수 있다. Thus, the substrate with a plum color dyes can be coated may contain other products which may be exposed to bacteria, such as those mentioned above, as well as a wipe. 또한 용매화발색 염료는 손의 미생물 오염을 파악하기 위해 사용되는 로션이나 크림에 혼입될 수도 있다. Plum color dyes may also be incorporated into a lotion or cream that is used to determine the microbial contamination of hands. 염료는 오염을 경고하기 위해 스펀지나 설거지용 타월에 혼입될 수도 있다. The dye can also be incorporated into the sponge or washing-up towels to warn the pollution. 착색제로 코팅되어 와이프로 사용되기에 적합한 기재는 필름, 직물 및 부직포, 셀룰로스 기재, 예컨대 화장지, 종이 타월 및 코폼 재료, 에어레이드 재료, 본디드-카디드 웹 등을 비롯한 전통적으로 와이프를 위해 사용되는 것들을 포함한다. The substrate adapted to be coated with a coloring agent using a wipe film, fabric and non-woven fabric, cellulosic substrates, such as toilet paper, paper towels and coform materials, air-laid materials, bonded-carded web, etc. which traditionally used for wipes including including ones. 기재의 비제한적인 예는 미국 특허 제4,775,582호, 미국 특허 제4,853,281호, 미국 특허 제4,833,003호 및 미국 특허 제4,511,488호에서 찾아 볼 수 있다 (이 모든 특허는 킴벌리-클라크 코포레이션(Kimberly-Clark Corporation)에 양도됨). Non-limiting examples of substrate U.S. Patent No. 4,775,582 No., U.S. Patent No. 4,853,281 No., U.S. Patent No. 4,833,003 and U.S. Patent No. be found in 4,511,488 No. (all patents Kimberly-Clark Corporation (Kimberly-Clark Corporation) It is transferred to). 부직포는 스펀본딩, 멜트블로잉, 에어레잉, 본딩 및 카딩 등의 공정을 통해 제조될 수 있다. The nonwoven fabric may be produced by processes such as spunbonding, meltblowing, air laying, carding and bonding. 부직포는 폴리에스테르, 나일론 및 폴리올레핀을 포함하나, 이들로 한정되지는 않는 열가소성 수지로부터 제조될 수 있다. Non-woven fabric may be made of polyester, nylon and polyolefin from a thermoplastic resin not limited to, it includes. 올레핀은 에틸렌, 프로필렌, 부틸렌, 이소프렌 등과 이들의 조합물을 포함한다. Olefins include ethylene, propylene, butylene, isoprene, etc. combinations thereof. "스펀본드 섬유"는 예를 들어 미국 특허 제4,340,563호 (Appel 등), 미국 특허 제3,692,618호 (Dorschner 등), 미국 특허 제3,802,817호 (Matsuki 등), 미국 특허 제3,338,992호 및 미국 특허 제3,341,394호 (Kinney), 미국 특허 제3,502,763호 (Hartman) 및 미국 특허 제3,542,615호 (Dobo 등)에서와 같이, 용융된 열가소성 물질을 다수의 미세하고 일반적으로 원형의 모세관인 방사구로부터 필라멘트 형태로 압출한 후에 압출된 필라멘트의 직경을 급속히 감소시키는 방법에 의해 형성된 작은 직경의 섬유이다. "Spunbond fibers" are, for example, U.S. Patent No. 4,340,563 No. (Appel, etc. ), (such as Dorschner) U.S. Patent No. 3,692,618 No., U.S. Patent No. 3,802,817 No. (Matsuki, etc. ), U.S. Patent No. 3,338,992 and U.S. Patent No. 3,341,394 No. (Kinney), U.S. Patent No. 3,502,763 No. (Hartman) and U.S. Patent No. 3,542,615 arc, as shown in (Dobo, etc. ), after a number of fine molten thermoplastic material is generally extruded from the capillaries of a radiation port of the circular filament form a small diameter fibers which are formed by a method of rapidly reducing the diameter of the extruded filaments. 스펀본드 섬유는 수집 표면에 침착되었을 때 일반적으로 끈적이지 않는다. Spunbond fibers are generally not sticky when deposited on a collecting surface. 스펀본드 섬유는 일반적으로 연속적이며 (최소 10개의 샘플로부터) 평균 직경이 7 마이크로미터 이상, 보다 바람직하게는 약 10 내지 20 마이크로미터이다. Spunbond fibers are generally continuous and (from a minimum of 10 samples), the average diameter is more than 7 micrometers, and more preferably from about 10 to 20 micrometers. "멜트블로운 섬유"는, 용융된 열가소성 물질을 다수의 미세하고 일반적으로 원형인 다이 모세관을 통해 용융된 쓰레드 또는 필라멘트로서 수렴되는 고속의 통상 고온 기체 (예를 들면, 공기) 스트림으로 압출시킴으로써 형성되는 섬유를 의미하고, 상기 고온 기체는 용융된 열가소성 물질의 필라멘트를 가늘게 하여 극세사 직경일 수 있는 그들의 직경을 감소시킨다. "Meltblown fibers" are formed by extrusion in a conventional high temperature gas in the high-speed to converge to the molten thermoplastic material a plurality of fine, generally as a thread or filament melt through the die capillary circular (e. G., Air) streams the hot gas means a fiber, and that reduce their diameter, which may be to microfiber diameter thin filaments of molten thermoplastic material. 그 후에, 멜트블로운 섬유는 고속 기체 스트림에 의해 운반되고 수집 표면 상에 침착되어 랜덤하게 분산된 멜트블로운 섬유의 웹을 형성한다. Thereafter, the meltblown fibers to form a fiber web of the Pacific blown carried by the high velocity gas stream and are deposited on a collecting surface randomly dispersed enamel. 이러한 공정은 예를 들면 미국 특허 제3,849,241호 (Butin 등)에 개시되어 있다. Such a process is disclosed in for (Butin, etc.) g. U.S. Patent No. 3,849,241. 멜트블로운 섬유는 연속적이거나 불연속적일 수 있는 극세사이고, 이는 일반적으로 10 마이크로미터 미만의 평균 직경을 갖고, 일반적으로 수집 표면 상에 침착되었을 때 점착성이다. Meltblown fibers are micro-fibers that can be continuous or a discontinuous, which is generally tacky when to 10 having a mean diameter of less than microns, generally deposited on a collecting surface. 본원에서 사용된 용어 "코폼"은, 제조하는 동안에 웹에 다른 물질을 첨가하는 통로인 활강로 근처에 적어도 하나의 멜트블로운 다이헤드가 배열되어 있는 공정을 의미한다. The term "coform" as used herein, means at least one meltblown die head, which process is arranged near to the passageway of adding other materials to the web sliding during manufacture. 이러한 다른 물질은 펄프, 초흡수성 입자, 천연 중합체 (예를 들면, 레이온 또는 면 섬유, 또는 다른 셀룰로스 물질) 및/또는 합성 중합체 (예를 들면, 폴리프로필렌 또는 폴리에스테르) 섬유일 수 있으며, 예를 들어 상기 섬유는 스테이플 길이일 수 있다. Such other materials may be pulp, superabsorbent particles, natural polymers (for example, rayon or cotton fibers, or other cellulosic material) and / or synthetic polymers (e.g., polypropylene or polyester) fibers, for example the fibers may be of staple length. 코폼 공정은 일반 양도된 미국 특허 제4,818,464호 (Lau) 및 미국 특허 제4,100,324호 (Anderson 등)에 나타나 있다. Coform processes are shown in commonly assigned U.S. Patent No. 4,818,464 (Lau) and US Patent No. 4,100,324 (Anderson, etc.). 코폼 공정에 의해 제조된 웹은 일반적으로 코폼 재료라고 지칭된다. Produced by the coform process, the web is referred to generally as coform materials. 본디드 카디드 웹은 코밍 또는 카딩 장치를 통해 보내지는 스테이플 섬유로부터 제조되고, 이것은 기계 방향으로 스테이플 섬유를 파괴하고 정렬시켜, 일반적으로 기계 방향-배향된 섬유상 부직 웹을 형성한다. Bonded carded webs are made from staple fibers are sent through a combing or carding unit, which is arranged by destroying the staple fibers in the machine direction, generally in the machine direction to form an oriented fibrous nonwoven web. 웹이 일단 형성되면, 이것을 몇가지 방법, 예컨대 분말 결합, 패턴 결합, 통풍 결합 및 초음파 결합 중 하나 이상에 의해 결합시킨다. When one web is formed, it is coupled by a number of ways, such as powder bonding, pattern bonding, one or more of the airflow combined and ultrasonic bonding. 에어레잉 공정에서는, 약 3 내지 약 52 밀리미터 범위의 전형적인 길이를 갖는 소섬유 다발을 분리하고, 공기 공급물 내에 동반시킨 다음, 일반적으로 진공 공급장치의 보조를 받아 성형 스크린 상에 침착시킨다. In the air laying step, separating the carbon fiber bundle having a typical length of about 3 to a range of about 52 mm, and was accompanied in the air feed, and then, generally assisted vacuum supply is deposited on a forming screen. 그 후에, 랜덤하게 침착된 섬유를 서로에 결합시킨다. Thereafter, the combination of the randomly deposited fibers to each other. 에어레이드 교시의 예는 미국 특허 제4,640,810호 (Laursen 등, 스캔 웹 오브 노쓰 아메리카 인크. (Scan Web of North America Inc.)에 양도됨)에 기재된 댄웹(DanWeb) 공정, 미국 특허 제4,494,278호 (Kroyer 등) 및 미국 특허 제5,527,171호 (Soerensen) (니로 세퍼레이션 a/s(Niro Separation a/s)에 양도됨)에 기재된 크로이어(Kroyer) 공정, 미국 특허 제4,375,448호 (Appel 등, 킴벌리-클라크 코포레이션에 양도됨)의 방법, 또는 기타 유사한 방법을 포함한다. Examples of airlaid teachings are US Pat. No. No. 4,640,810 (Laursen et al., Scanning Web of North America Incredible. (Scan Web of North America Inc.) being transferred to) daenwep (DanWeb) process, described in US Patent No. 4,494,278 (Kroyer etc. ), and U.S. Patent Nos. including 5,527,171 No. (Soerensen) (Niro separation a / s (Niro separation a / s) being transferred to) chroman Following (Kroyer) process, U.S. Patent No. 4,375,448 No. (Appel described, Kimberly-Clark It includes a method, or other similar methods of transfer of the search Corporation). 본 발명자들은, 예를 들어 하이포아염소산나트륨 용액, 염소 및 중아황산 나트륨과 같은 표면 세정에 사용되는 표백제가 용매화발색 염료에 부정적인 영향을 미칠 수 있고 세균이 존재하지 않는다 하더라도 색 변화를 일으킬 수 있음을 발견하였다. In the present inventors, for example, even if the sodium hypochlorite solution, chlorine, and bisulfite can have a negative effect on the plum color dye for bleaching agent used for the surface cleaning, such as sodium sulfate and do the bacteria exists, it may cause a color change It was found. 따라서, 본 발명의 또다른 측면은 용매화발색 염료와 함께 와이프 내에 있는 표백 검출 착색제를 포함한다. Accordingly, another aspect of the invention includes a coloring agent in the bleaching detection wipe with a plum color developing dyes. 지시제는 예를 들면 2,2',5,5'-테트라메틸 벤지딘일 수 있고, 이것은 보통 무색이고 염소 또는 하이포아염소산나트륨에 노출되었을 때 적색으로 변한다. The indicator may be, for example, 2,2 ', 5,5'-tetramethylbenzidine, which changes to red when exposed to normally colorless and chlorine or sodium hypochlorite. 지시제는 또한 전분 및 요오드의 조합일 수 있고 이것은 염소 또는 하이포아염소산염의 존재하에서 흑색으로 변한다. The indicator may also be a combination of starch and iodine which turns black and in the presence of chlorine or hypochlorite. 또다른 지시제인 푹신(fuchsine)은 메타중아황산나트륨과 같은 아황산염의 검출에 유용할 수 있다. 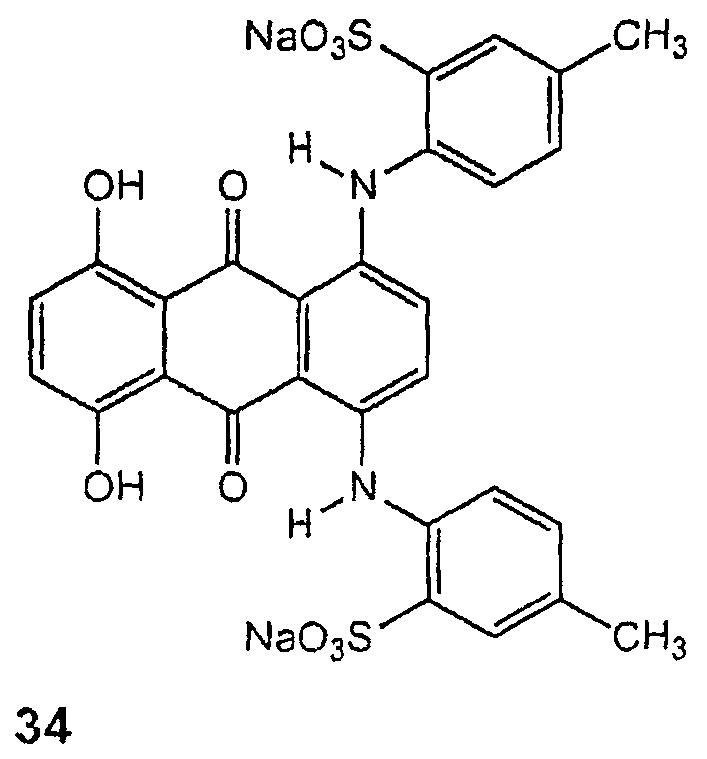 Another indication Jane fuchsin (fuchsine) may also be useful for detection of sulfites, such as sodium metabisulfite. 푹신은 분홍색이고 아황산염에 노출되었을 때 무색으로 변한다. Fuchsin changes to colorless when exposed to sulfites and pink. 이러한 방식으로, 와이프의 영역이 세균에 감수성인 것으로 표시될 수 있고, 다른 영역은 표백제 및 보존제에 감수성인 것으로 표시되며, 그 결과 활성 표백제를 함유하는 표면은 색 변화 조합을 제공하여 사용자가 세균 오염을 표백과 구별할 수 있게 된다. In this way, it can be shown that the area of ​​the wipe susceptible to bacteria and other areas are designated as being susceptible to bleaching agents and preservatives, as a result, the user and bacteria contaminated surfaces containing active bleach is to provide a color change in combination to be able to distinguish it from bleaching. 표백제 지시제는 와이프 상에 숨겨진 단어 "BLEACH"를 스펠링대로의 패턴으로 찍어 나타낼 수 있어, 와이프가 표백제를 통과한다면 단어 BLEACH가 용매화발색 염료에 표백제가 일으킬 수도 있는 다른 색 변화와 함께 눈에 보이게 된다. Bleach indicator is visibly together can represent read the pattern of the as spelling a hidden word "BLEACH" on a wipe, if the wipe is passed through a bleach word BLEACH is a different color change that may bleach the plum color dyes cause for do. 표백제 지시제의 양은 단지 육안에 의해 검출될 수 있는 색 변화를 일으키기에 충분한 양을 필요로 하고, 용매화발색 염료와 동일한 범위 내에 있다. Bleaching agents within the same range as the only indication the amount of plum color dyes as required, and a sufficient amount to cause a color change that can be detected by the naked eye of. 본 발명자들은 또한 예를 들면 a) 세균을 검출하는 용매화발색 염료, b) 테트라메틸 벤지딘과 같은 염소/하이포아염소산염 검출제 물질, c) 전분과 요오드화칼륨의 혼합물과 같은 산화제 검출제, d) 푹신과 같은 중아황산염 지시제, e) 아질산염 검출 시약의 소량의 견본을 지시 스트립 상에 포함시킬 수 있다고 믿고 있다. The inventors have also for example, a) a plum color dyes to detect bacteria, b) chlorine, such as tetramethylbenzidine / hypochlorite detecting the substance, c) an oxidizing agent detection agent, such as a mixture of starch and potassium iodide, d) bisulfite instructions, such as the soft, e) is believed to include a small amount of sample in the nitrite detection reagent on the strip instructions. 이러한 방식으로, 다양한 성질의 지시제가 예를 들어 식품의 상태 또는 품질을 제공할 수 있다. In this manner, the I instructions of various properties, for example, may provide a status or quality of the food. 본 발명의 또다른 측면에서, 기재 상의 코팅물을 사용하여 검출 염료(들)가 결정화되는 것을 억제함으로써 미생물에 대해 더욱 높은 감도를 갖는 코팅물을 수득할 수 있다. In yet another aspect of the invention, it is possible to obtain a coating having a higher sensitivity for the microorganism, by suppressing the use of coating on the substrate is crystallization detecting dye (s). 이상적으로는, 표면 상에 단일 염료 분자를 갖는 코팅물이 미생물에 대해 높은 감도를 갖는다. Ideally, the coating having a single dye molecules on the surface has a high sensitivity to microbes. 각각의 염료 분자는 미생물 막과 자유롭게 상호작용한다. Each of the dye molecules is free to interact with the microbial membrane. 반대로, 염료의 작은 결정은 우선 용해된 다음 막을 침투한다. In contrast, small crystals of the dye is first dissolved and then penetrate the membrane. 어떠한 이론에도 구애받기를 원하지 않지만, 본 발명자들은 히드록시프로필-베타-시클로덱스트린, 히드록시에틸-베타-시클로덱스트린, 감마-시클로덱스트린, 히드록시프로필-감마-시클로덱스트린, 히드록시에틸-감마-시클로덱스트린 (이하, 총괄적으로 "시클로덱스트린"이라 함) (이들 모두는 미국 인디애나주 해몬드 소재의 세레스타 인터내셔널(Cerestar International)로부터 입수가능함)이 염료의 결정화를 방해하여, 기재 상에서 더욱 선명한 염료 색이 나타나도록 한다고 믿고 있다. Not want to be committed by any theory, the present inventors have found that hydroxypropyl-beta-cyclodextrin, hydroxyethyl-beta-cyclodextrin, gamma-cyclodextrin, hydroxypropyl-gamma-cyclodextrin, hydroxyethyl-gamma- the sharper the dye color on the cyclodextrin (hereinafter referred to collectively as "cyclodextrin" referred to) (all of which are available from celebrity star of Indiana, USA Hammond materials International (Cerestar International)) to interfere with the crystallization of the dye, the substrate He believes that to appear. 효과적인 것으로 밝혀진 시클로덱스트린의 양은 0.001 내지 2 중량％, 바람직하게는 0.01 내지 1 중량％, 보다 바람직하게는 0.025 내지 0.5 중량％이다. The amount of 0.001 to 2% by weight of the cyclodextrin have been found effective, and preferably 0.01 to 1% by weight, more preferably 0.025 to 0.5% by weight. 특정 계면활성제 또한 미생물을 검출하는데 있어서 염료를 보조하는 것으로 밝혀졌다. In the detection of a specific surface active agent In addition, the microorganism has been found to assist the dye. 특히 바람직한 계면활성제는 비이온성 계면활성제, 예컨대 에톡실화된 알킬페놀, 에톡실화된 및 프로폭실화된 지방 알콜, 에틸렌 옥시드-프로필렌 옥시드 블록 공중합체, (C 8 -C 18 ) 지방산의 에톡실화된 에스테르, 에틸렌 옥시드와 장쇄 아민 또는 아미드의 축합 생성물, 에틸렌 옥시드와 알콜의 축합 생성물, 아세틸렌계 디올 및 이들의 혼합물이다. Particularly preferred surfactants are non-ionic surfactants such as ethoxylated alkyl phenols, ethoxylated the misfire and propoxylated fatty alcohols, ethylene oxide-ethoxylated propylene oxide block copolymer, (C 8 -C 18) fatty acid It is the condensation product, acetylenic diols and mixtures of these esters, ethylene oxide and long chain condensation product of ethylene oxide with an alcohol amine or amide. 적합한 비이온성 계면활성제의 여러 특정 예는 메틸 글루세트-10, PEG-20 메틸 글루코스 디스테아레이트, PEG-20 메틸 글루코스 세스퀴스테아레이트, C 11 -15 파레트-20, 세테트-8, 세테트-12, 도독시놀-12, 라우레트-15, PEG-20 피마자유, 폴리소르베이트 20, 스테아레트-20, 폴리옥시에틸렌-10 세틸 에테르, 폴리옥시에틸렌-10 스테아릴 에테르, 폴리옥시에틸렌-20 세틸 에테르, 폴리옥시에틸렌-10 올레일 에테르, 폴리옥시에틸렌-20 올레일 에테르, 3 내지 20개의 에틸렌 옥시드 잔기를 포함하는, 에톡실화된 노닐페놀, 에톡실화된 옥틸페놀, 에톡실화된 도데실페놀 또는 에톡실화된 (C 6 -C 22 ) 지방 알콜, 폴리옥시에틸렌-20 이소헥사데실 에테르, 폴리옥시에틸렌-23 글리세롤 라우레이트, 폴리옥시-에틸렌-20 글리세릴 스테아레이트, PPG-10 메틸 글루코스 에테르, PPG-20 메틸 글 Several specific examples of suitable nonionic surfactants are set methylglucamine -10, PEG-20 methyl glucose distearate, PEG-20 methyl glucose sesquioleate stearate, C 11 -15 -20 pallet, three Tet-8, three Tet -12, dodok resorcinol-12, laureth -15, PEG-20 castor oil, polysorbate 20, stearate inlet -20, -10, polyoxyethylene cetyl ether, polyoxyethylene -10 stearyl ether, polyoxyethylene -20 cetyl ether, polyoxyethylene oleyl ether, -10, -20, polyoxyethylene oleyl ether, 3 to 20 comprising the ethylene oxide moiety, the ethoxylated nonylphenol, ethoxylated octylphenol, ethoxylated the dodecylphenol or ethoxylated (C 6 -C 22) fatty alcohols, polyoxyethylene -20 isohexadecyl ether, polyoxyethylene -23 glycerol laurate, polyoxyethylene-ethylene -20 glyceryl stearate, PPG-10 methyl glucose ether, PPG-20 methylglutaryl 루코스 에테르, 폴리옥시에틸렌-20 소르비탄 모노에스테르, 폴리옥시에틸렌-80 피마자유, 폴리옥시에틸렌-15 트리데실 에테르, 폴리옥시-에틸렌-6 트리데실 에테르, 라우레트-2, 라우레트-3, 라우레트-4, PEG-3 피마자유, PEG 600 디올레에이트, PEG 400 디올레에이트 및 이들의 혼합물을 포함하나, 이들로 한정되지는 않는다. Lu course ether, polyoxyethylene -20 sorbitan esters, polyoxyethylene castor oil, -80, -15, polyoxyethylene tridecyl ether, polyoxy-ethylene -6 tridecyl ether, laureth-2, laureth -3 , laureth -4, PEG-3 castor oil, PEG 600 diol LES benzoate, PEG diol 400 LES Eight and one or a mixture thereof, but is not limited to these. 시판되고 있는 비이온성 계면활성제는 미국 펜실바니아주 알렌타운 소재의 에어 프러덕츠 앤드 케미컬즈(Air Products and Chemicals)로부터 입수가능한 아세틸렌계 디올 계면활성제인 설피놀(SURFYNOL; 등록상표) 및 미국 펜실바니아주 피츠버그 소재의 피셔 사이언티픽(Fischer Scientific)으로부터 입수가능한 폴리옥시에틸렌 계면활성제인 트윈(TWEEN; 등록상표)을 포함할 수 있다. Nonionic surfactants which are commercially available are the United States, Pennsylvania, Allentown material Air program reodeok Flats And Chemical's Inn snowshoe play possible acetylenic diol surfactants available from (Air Products and Chemicals) (SURFYNOL; registered trademark), and the United States, Pennsylvania, Pittsburgh It can include, (a registered trademark tWEEN) of the material, Fisher Scientific (Fischer Scientific), available polyoxyethylene surfactant from the twin. 또한 결합제를 사용하여 기재 상에서 착색제의 고정을 용이하게 할 수 있다. In addition, it is possible to facilitate the fixing of the coloring agent on the base material by using a binder. 예를 들면, 수용성 유기 중합체가 결합제로서 사용될 수 있다. For example, a water-soluble organic polymer may be used as the binder. 수용성 유기 중합체의 한 적합한 부류는 다당류 및 그의 유도체를 포함한다. One suitable class of water-soluble organic polymers include polysaccharides and derivatives thereof. 다당류는 양이온, 음이온, 비이온성 및/또는 양쪽성일 수 있는 탄수화물 반복 단위를 함유하는 중합체이다. Polysaccharides are polymers containing repeated carbohydrate units that are cationic, anionic, non-ionic holy days, and / or both. 한 특정 실시양태에서, 다당류는 비이온성, 양이온, 음이온 및/또는 양쪽성 셀룰로스성 에테르이다. In one particular embodiment, the polysaccharide is a nonionic, cationic, anionic and / or amphoteric cellulosic ether. 적합한 비이온성 셀룰로스성 에테르는 알킬 셀룰로스 에테르, 예컨대 메틸 셀룰로스 및 에틸 셀룰로스; Suitable nonionic cellulosic ether is an alkyl cellulose ethers, such as methyl cellulose and ethyl cellulose; 히드록시알킬 셀룰로스 에테르, 예컨대 히드록시에틸 셀룰로스, 히드록시프로필 셀룰로스, 히드록시프로필 히드록시부틸 셀룰로스, 히드록시에틸 히드록시프로필 셀룰로스, 히드록시에틸 히드록시부틸 셀룰로스 및 히드록시에틸 히드록시프로필 히드록시부틸 셀룰로스; Hydroxyalkyl cellulose ethers, such as hydroxyethyl cellulose, hydroxypropyl cellulose, hydroxypropyl hydroxybutyl cellulose, hydroxyethyl hydroxypropyl cellulose, hydroxyethyl hydroxybutyl cellulose and hydroxyethyl hydroxypropyl hydroxybutyl cellulose; 알킬 히드록시알킬 셀룰로스 에테르, 예컨대 메틸 히드록시에틸 셀룰로스, 메틸 히드록시프로필 셀룰로스, 에틸 히드록시에틸 셀룰로스, 에틸 히드록시프로필 셀룰로스, 메틸 에틸 히드록시에틸 셀룰로스 및 메틸 에틸 히드록시프로필 셀룰로스 등을 포함할 수 있으나, 이들로 한정되지는 않는다. Alkyl hydroxyalkyl cellulose ethers, such as and the like methyl hydroxyethyl cellulose, methyl hydroxypropyl cellulose, ethyl hydroxyethyl cellulose, ethyl hydroxypropyl cellulose, methyl ethyl hydroxyethyl cellulose and methyl ethyl hydroxypropyl cellulose but it is not limited to these. 본 발명의 또다른 측면에 따라서, 염료는 또한 그것이 노출된 미생물의 양에 관한 정보를 제공할 수 있다는 것이 밝혀졌다. According to still another aspect of the invention, the dye addition has been found that it is possible to provide information about the amount of exposed micro-organisms. 예를 들면, 레이차트 염료는 강력한 음성 용매화발색 현상을 나타낸다. For example, ray chart dye shows strong negative plum color-developer. 즉, 레이차트 염료는 1종 이상의 미생물 존재하에서 청색에서 무색으로 색 변화가 일어날 수 있다. That is, the ray chart dye may take place a color change from blue to colorless under one or more microorganisms present. 염료의 색 변화 정도를 시각적으로 또는 기구를 사용하여 측정하여 미생물 농도와의 반-정량적 및/또는 정량적 상관관계를 제공할 수 있다. Measured by the degree of color change of the dye used to visually or mechanism of the anti-microbial concentrations - it is possible to provide a quantitative and / or quantitative correlation. 예를 들면, 반응시킨 시험 염료의 색을, 미생물에 대한 반응성 측면에서 시험 염료와 동일하거나 유사한 화합물로부터 형성된 대조 염료의 색과 비교할 수 있다 (예를 들면, 시각적으로 또는 기구의 도움으로). For example, the color of the reaction in which the test dye may be compared to the color of the contrast dye formed from the same or similar compound with the reactive dye in the test side of the microorganisms (for the example, visually, or the help of the mechanism). 미생물의 서로 다른 농도에 대응하여 복수 개의 대조 염료 또한 사용될 수 있다. In response to different concentrations of micro-organisms it may also be used a plurality of contrast dye. 예를 들면, 각각 밀리리터당 10 3 , 10 4 , 10 5 , 10 6 및 10 7 콜로니 형성 단위 ("CFU")의 미생물 농도와 반응하는 5가지 대조 염료가 사용될 수 있다. For example, a liter of 10 mm 3, respectively, 10 4, 10 5, 10 6 and 10 7 There are five contrast dyes which react with a biomass concentration of colony forming units ( "CFU") may be used. 비교시, 대조 염료 중에서 1종 이상을 시험 시료와 반응하는 시험 염료와 동일하거나 실질적으로 유사한 색을 갖도록 선택할 수 있다. Equal to the comparison, at least from the control dye over the test sample and a test reaction or dyes can be selected so as to have substantially similar color. 그 후에, 시료내 미생물의 농도 (또는 농도 범위)를 선택된 대조 염료(들) 및 대응하는 기지 미생물 농도(들)로부터 결정한다. Thereafter, a determination is selected from a sample of microbial concentration (or concentration range) contrast dye (s) and the corresponding base biomass concentration (s). 이에 따라 정량적 (즉, 특정 농도) 또는 반-정량적 (즉, 농도 범위) 결과가 상기 기술을 사용하여 얻어질 수 있다. Accordingly quantitatively (i.e., a specific concentration) or semi-quantitatively (i.e., a range of concentrations), the result can be obtained using this technique. 필요하다면, 시료에 존재하는 1종 이상의 미생물의 실제 양을 더욱 잘 측정하기 위해 염료의 색 강도를 측정할 수 있다. If necessary, it is possible to measure the color intensity of the dye in order to better determine the actual amount of one or more microorganisms present in the sample. 한 실시양태에서, 색 강도는 광학식 판독기를 사용하여 측정된다. In one embodiment, the color intensity is measured using an optical reader. 광학식 판독기의 실제 구성 및 구조는 당업자에게 용이하게 이해되는 것처럼 일반적으로 다양할 수 있다. The actual configuration and structure of the optical reader may generally vary as is readily understood by those of ordinary skill in the art. 전형적으로, 광학식 판독기는 전자기 방사선을 방사할 수 있는 광원 및 시그널 (예를 들면, 투과되거나 반사된 광)을 기록할 수 있는 검출기를 함유한다. Typically, the optical reader comprises a light source and a detector capable of recording a signal which can emit electromagnetic radiation (e.g., the transmitted or reflected light). 광원은 전자기 방사선, 예컨대 가시광선 또는 근-가시광선 영역 (예를 들면, 적외선 또는 자외선)의 광을 제공할 수 있는 당업계에 공지된 임의의 장치일 수 있다. The light source is electromagnetic radiation, such as visible light or near-may be any device known in the art which can provide light in the visible light range (e.g., infrared or ultraviolet light). 본 발명에서 사용될 수 있는 적합한 광원은 예를 들면, 발광 다이오드 (LED), 섬광등, 냉음극 형광 램프, 전기발광 램프 등을 포함하나, 이들로 한정되지는 않는다. Suitable light sources that can be used in the present invention is, for example, light emitting diodes (LED), comprising a flash lamp, a cold cathode fluorescent lamp, electroluminescent lamp, but is not limited to one, of these. 조명은 다중 방사되고/되거나 시준될 수 있다. Illumination can be collimated multi-radiation and / or. 몇몇 경우에는, 조명을 펄스화하여 임의의 백그라운드 간섭을 감소시킬 수 있다. In some cases, it is possible to reduce any background interference by pulsed light. 또한, 조명은 연속적일 수 있거나 지속파 (CW)와 펄스화 조명을 조합할 수 있으며, 이때 복수 개의 조명 빔이 다중 방사되어 (예를 들면, 펄스화 빔은 CW 빔과 다중 방사됨) CW 기원에 의해 유도된 시그널과 펄스화된 기원에 의해 유도된 시그널 사이에 시그널 구별을 가능하게 한다. The illumination may be continuous or may combine continuous wave (CW) and pulsed illumination, wherein the plurality of illumination beams are radiated multiple (for example, a pulsed beam is being CW beam and multiple radiation) CW origin induced by signal and enables the signal to distinguish between induced signal by a pulsed origin. 예를 들면, 몇몇 실시양태에서는, LED (예를 들면, 알루미늄 갈륨 아르세나이드 적색 다이오드, 갈륨 포스파이드 녹색 다이오드, 갈륨 아르세나이드 포스파이드 녹색 다이오드, 또는 인듐 갈륨 니트라이드 보라색/청색/자외선(UV) 다이오드)가 펄스화 광원으로서 사용된다. For example, in some embodiments, LED (for example, aluminum gallium arsenide red diodes, gallium phosphide green diodes, gallium arsenide phosphide green diodes, or indium gallium nitride violet / blue / ultraviolet (UV ) diodes) are used as the pulsed light source. 본 발명에서 사용하기에 적합한 UV LED 들뜸 다이오드의 한 시판용 예는 반치폭이 10도이고, 최고 파장이 370 내지 375 나노미터이며, 스펙트럼 반높이 너비가 12 나노미터인 빔으로 10 밀리암페어 (3.5 내지 3.9 볼트)의 순방향 전류에서 750 내지 1000 마이크로와트의 광출력을 내보내는 모델명 NSHU550E (니키아 코포레이션(Nichia Corporation))이다. A commercially available example of a UV LED excitation diode suitable for use in the present invention is the full width at half maximum of 10 degrees, and a maximum wavelength of 370 to 375 nanometers, the spectrum full width at half maximum in the 12-nm beam 10 mA (3.5 to 3.9 a bolt) model export a light output of 750 to 1000 microwatts at a forward current of NSHU550E (nikiah Corporation (Nichia Corporation)). 몇몇 경우에, 광원은 염료에 확산 조명을 제공할 수 있다. In some cases, the light source may provide diffuse illumination to the dye. 예를 들면, 복수 개의 점광원의 어레이 (예를 들면, LED)는 상대적으로 확산 조명을 단순히 제공하는 데 사용될 수 있다. For example, (e.g., LED) array of a plurality of point light sources may be used to simply provide relatively diffuse illumination as. 비교적 저렴한 방식으로 확산 조명을 제공할 수 있는 또다른 특히 바람직한 광원은 전기발광 (EL) 장치이다. Another particularly preferred light source capable of providing diffuse illumination in a relatively inexpensive manner is an electroluminescent (EL) device. EL 장치는 일반적으로, 그 중 적어도 하나가 투명하여 광이 빠져나가는 전극들 사이에 개재된 발광 물질 (예를 들면, 인광체 입자)을 이용하는 콘덴서 구조이다. EL devices generally, at least one of which is transparent to the light emitting material sandwiched between electrodes outgoing light is out of a capacitor structure that utilizes the (e. G., Phosphor particles). 전극에 전압을 인가하면 발광 물질 내에서 변화하는 전기장이 발생하여, 광을 방사하도록 한다. When voltage is applied to the electrode to generate an electric field which changes in the luminescent material, and to emit light. 검출기는 일반적으로 시그널을 감지할 수 있는 당업계에 공지된 임의의 장치일 수 있다. The detector can generally be any device known in the industry of which can detect the signals. 예를 들면, 검출기는 공간의 식별을 위해 구성된 전자식 이미지화 검출기일 수 있다. For example, the detector may be an electronic imaging detector that is configured for the identification of the space. 이러한 전자식 이미지화 센서의 몇몇 예는 고속 선형 전하-결합 소자 (CCD), 전하-주입 소자 (CID), 상보적-금속-산화막-반도체 (CMOS) 소자 등을 포함한다. Some examples of such electronic imaging sensor is a linear high-speed charge-comprises a semiconductor (CMOS) element, or the like-coupled device (CCD), charge-injection device (CID), complementary-metal-oxide film. 이러한 이미지 검출기는 예를 들면, 일반적으로 전자식 광 센서의 2차원 어레이이지만, 단일 라인의 검출기 픽셀 또는 광 센서, 예를 들면 이미지를 스캐닝하기 위한 것들을 포함하는 선형 이미지화 검출기 (예를 들면, 선형 CCD 검출기) 또한 사용될 수 있다. Such image detectors, for example, in general, but the two-dimensional arrays of electronic light sensors, for the detector pixels or light sensors, such as a single-line imaging linear, including those for scanning the image detector (e.g., linear CCD detectors ) it may also be used. 어레이는 각각 "어드레스"라고 하는 이미 알고 있는 특정한 위치의 세트를 포함한다. The array comprises a set of specific locations already known that each of "address". 이미지 검출기에서 각각의 어드레스는 소정의 영역 (예를 들면, 전형적으로 박스형 또는 직사각형 모양의 영역)을 덮는 센서가 차지하고 있다. Each address in an image detector is a predetermined area (e. G., Typically a region of the box-shaped or rectangular) occupies a sensor covering a. 상기 영역을 일반적으로 "픽셀" 또는 픽셀 영역이라고 한다. It is referred to as "pixels" or area of ​​pixels to the area generally. 검출기 픽셀은, 예를 들면 CCD, CID 또는 CMOS 센서, 또는 광을 검출하거나 측정하는 임의의 다른 소자 또는 센서일 수 있다. Detector pixel, for instance, may be a CCD, CID or a CMOS sensor, or any other device or sensor that detects or measures light. 검출기 픽셀의 크기는 매우 다양할 수 있고, 몇몇 경우에는 직경 또는 길이가 0.2 마이크로미터 정도로 작을 수 있다. The size of detector pixels may vary widely, and in some cases have a diameter or length may be as little as 0.2 micrometer. 다른 실시양태에서, 검출기는 공간 식별 능력이 결여된 광 센서일 수 있다. In other embodiments, the detector may be a lack of space identification ability photosensor. 이러한 광 센서는 예를 들면 광전자증배관 장치, 포토다이오드, 예컨대 애벌랜치(avalanche) 포토다이오드 또는 실리콘 포토다이오드 등을 포함할 수 있다. The light sensor may for example include photomultiplier devices, photodiodes, such as avalanche (avalanche) photodiode or a silicon photodiode or the like. 실리콘 포토다이오드는 이들이 저렴하며, 고감도이며, 고속으로 작업할 수 있으며 (짧은 라이즈타임/넓은 대역폭), 대부분의 다른 반도체 기술 및 모노리식 회로(monolithic circuitry)에 용이하게 통합된다는 점에서 때로는 유리하다. Silicon photodiodes, and they are low cost, and high sensitivity and can work at a high speed, and (short rise time / bandwidth), sometimes it is advantageous in that it is easily integrated into most other semiconductor technology and monolithic circuitry (monolithic circuitry). 또한, 실리콘 포토다이오드는 물리적으로 작아서, 이들을 다양한 유형의 검출 시스템에 용이하게 도입할 수 있다. In addition, silicon photodiodes are physically small, as can be easily introduced into them the various types of detection systems. 실리콘 포토다이오드가 사용된다면, 방출된 시그널의 파장 범위는 400 내지 1100 나노미터의 감도 범위 내에 있을 수 있다. If silicon photodiodes are used, the wavelength range of the emitted signal may be within the range of sensitivity of 400 to 1100 nanometers. b * = 대략 -100 내지 100 범위의 황색/청색 축; b * = Yellow / blue axis of approximately -100 to 100 range; 양의 값은 황색이고 음의 값은 청색임. A positive value being yellow, negative values ​​are blue. CIELAB 색 공간이 다소 시각적으로 균일하기 때문에, 인간에 의해 감지된 두 색 사이의 차이를 나타내는 단수가 계산될 수 있다. Because CIELAB color space is somewhat visually uniform, a number of stages representing the difference between the two colors sensed by the human may be calculated. 상기 차이를 ΔE로 하고 두 색 사이의 3가지 차이 (ΔL * , Δa * , 및 Δb * )의 제곱의 합을 제곱근하여 계산한다. It calculates the square root of the sum of squares of the three differences (ΔL *, Δa *, and Δb *) between the two colors and the difference in ΔE. CIELAB 색 공간에서, ΔE 단위는 각각 두 색 사이의 "최소 인지차 (just noticeable difference)"와 거의 동등하다. In the CIELAB color space, ΔE units is nearly equal to the "minimum recognition difference (just noticeable difference)" between each of the two colors. 따라서 CIELAB는 색 관리 및 색 변화의 표시를 목적으로 기준 색 공간으로서 사용될 수 있는 객관적인 장치-독립형 표색계를 위한 양호한 척도이다. CIELAB is therefore an objective apparatus that may be used as a reference color space for the purpose of color management and display of the color change - a good measure for the independent color space. 따라서 상기 시험법을 사용하여, 색 강도 (L * , a * , 및 b * )를 예를 들면, 일본 오사카 소재의 미놀타 컴퍼니 리미티드 (Minolta Co. Ltd.)의 소형 분광광도계 (모델명 CM2600d)를 사용하여 측정할 수 있다. Therefore, by using the foregoing test method, using a color intensity (L *, a *, and b *) a, for example, miniature spectrophotometer (model CM2600d) of Osaka, Japan material Minolta Company Limited (Minolta Co. Ltd.) of and it can be measured. 상기 기구는 CIE No. The mechanism CIE No. 15, ISO 7724/1, ASTME 1164 및 JIS Z8722-1982 (확산 조명/8도 관측 시스템)에 따라 D/8 기하학적 배열을 이용한다. 15, utilizes the D / 8 geometry according to ISO 7724/1, ASTME 1164 and JIS Z8722-1982 (diffused illumination / 8-degree viewing system). 표면의 수직선에 대해 8도의 각으로 견본 표면에 의해 반사된 D65 광이 견본-측정 광학 시스템에 투입된다. The D65 light reflected by the sample surface with 8 degree angle with respect to the normal of the sample surface - is injected into the measuring optical system. 또다른 적합한 광학식 판독기는 그 전문이 본원에 참조로 포함되는, 미국 특허 출원 공개번호 2003/0119202호 (Kaylor 등)에 개시된 반사 분광광도계이다. Another suitable optical readers is a reflecting spectrophotometer disclosed in its entirety (including Kaylor), U.S. Patent Application Publication No. 2003/0119202 which arc incorporated herein by reference. 마찬가지로, 투과식 검출 시스템 또한 본 발명에서 사용될 수 있다. Similarly, the transmission type detection system also may be used in the present invention. 색 강도 측정 방식과 상관없이, 몇몇 실시양태에서는 결과를 미리 결정된 검출 곡선과 비교할 수 있다. Regardless of the color intensity measurement method, in some embodiments it may compare the result with a predetermined detection curve. 검출 곡선은 여러 기지 미생물 농도에서 염료의 색 강도를 플롯팅함으로써 만들어진다. Detection curve is made by plotting the color intensity of the dye in various microorganisms known concentration. 이러한 방식으로, 반응시킨 시험 염료의 색을 측정할 수 있고, 검출 곡선을 사용하여 용이하게 미생물 농도와 상호 연관시켜 사용자에게 정량적 또는 반-정량적 결과를 제공할 수 있다. In this way, and the color of the reaction was tested to measure the dye, to facilitate detection using the curve to correlate biomass concentration to the user a quantitative or semi-quantitative result can be provided. 검출 곡선을 광범위한 미생물에 대해 만들 수 있지만, 검출 곡선을 단일 종류의 미생물에 대해 만들 수 있다는 것 또한 고려된다. Although you can create for the detection curve on a wide range of microorganisms, that you can create for the detection curve for a single type of microorganism it is also considered. 따라서, 색 강도는 특정 적용에서 해당 미생물의 검출 곡선과 상관관계를 가질 수 있다. Therefore, the color intensity may have a correlation to the detection curve for the microorganisms in a particular application. 예를 들면, 대장균에 대하여 특유의 반응성을 나타내는 염료가 선택될 수 있다. For example, a dye showing a specific reactivity to the E. coli can be selected. 이어서 색 변화가 일어나면, 색 강도를 대장균의 미리 결정된 검출 곡선과 상호 연관시킬 수 있다. Then occurs a color change, the color intensity can be correlated with a predetermined detection curve of E. coli. 또한, 다수 개의 검출 곡선을 여러 종류의 미생물에 대하여 만들 수 있다. In addition, it can make for a plurality of detection curve for different types of microorganisms. 상기 기재한 상호 연관시키는 방법은 자동으로 및/또는 수동으로 실시될 수 있다. A method for the mutual described association may be automatically carried out and / or manually. 예를 들면, 마이크로프로세서를 임의적으로 이용하여 목적하는 상호 연관시키는 기술을 자동으로 선택하고 검출기로부터의 측정치를 정량적으로 또는 반정량적으로 미생물 농도를 나타내는 결과로 전환시킬 수 있다. For example, it is possible to automatically select the technique to correlate to the desired using the microprocessor and optionally converted to a result indicating the biomass concentration in a semi-quantitative or quantitative measurements from the detector. 마이크로프로세서는 사용자가 최후 몇몇 결과를 상기하도록 기억 능력을 포함할 수 있다. The microprocessor may include memory capability to the user the last several results. 당업자라면 임의의 적합한 컴퓨터-판독형 기억 소자, 예컨대 RAM, ROM, EPROM, EEPROM, 플래쉬 메모리 카드, 디지털 비디오 디스크, 베르누이(Bernoulli) 카트리지 등을 사용할 수 있다는 것을 알 것이다. Those skilled in the art any suitable computer-It will be appreciated that they will be available for readable storage device, for example, RAM, ROM, EPROM, EEPROM, flash memory cards, digital video disks, Bernoulli (Bernoulli) cartridges. 필요하다면, 결과는 액정 (LCD) 또는 LED 디스플레이를 사용하여 사용자에게 전달될 수 있다. If desired, the results may be communicated to the user by using a liquid crystal (LCD) or LED display. 상기 기재된 상호 연관시키는 기술은 본 발명에 따라 다양한 방법으로 실시될 수 있다. The technique of correlating described can be implemented in a variety of ways in accordance with the present invention. 예를 들면, 임의 갯수의 독립된 검출 영역 (예를 들면, 선, 점 등)을 제공하는 검출 대역을 함유하는 기재를 이용하여 사용자가 시료내 1종 이상의 미생물의 농도를 더욱 잘 측정할 수 있다. For example, the discrete sensing area of ​​any number may be used a substrate comprising a detection zone that provides (e.g., lines, dots, etc.) the user to better determine the concentration of at least 1 of jong microorganism sample. 각각의 영역은 동일한 시험 염료를 함유할 수 있거나 상이한 종류의 미생물과 반응하는 상이한 염료를 함유할 수 있다. Each area may contain different dyes that may contain different types of microorganisms, or the reaction with the same dye tests. 예를 들면, 몇몇 염료는 그람-양성 세균에 대해 더욱 고감도이고 몇몇 염료는 그람-음성 세균에 대해 더욱 고감도이다. For example, some dyes are gram-positive bacteria and more sensitive for several dyes are gram-negative bacteria are more sensitive to the. 이러한 방식으로, 1종 초과의 미생물이 검출될 수 있다. In this manner, the microorganism can be a one kind of excess detection. 시험 염료 농도를 또한 선택적으로 조절하여 목적하는 수준의 검출 감도를 제공할 수 있다. The test dye concentration also can provide a detection sensitivity level which is selectively adjustable for the purpose. 예를 들면, 보다 높은 농도는 낮은 미생물 수준이 추정될 때 높은 수준의 검출 감도를 제공할 수 있다. For example, higher concentrations may provide a high level of detection sensitivity when the estimated low microorganism level. 필요하다면, 기재는 또한 시험 염료와 동일하거나 이와 유사한 대조 염료가 도포된 대조 대역을 함유할 수 있다. If desired, the substrate can also contain the same or similar are applied contrast contrast dyes band and the test dye. 대조 대역은 일반적으로 시험하는 동안에 색이 변화하지 않아 정량적 및/또는 반-정량적 비교를 위해 사용될 수 있다. Contrast bands do not change color during the test in general quantitatively and / or semi-can be used for quantitative comparison. 검출 대역과 마찬가지로, 대조 대역 또한 임의 갯수의 독립된 영역을 제공할 수 있다. Like the detection zone, the control zone may also provide any number of independent regions. 예를 들면, 대조 대역은 전술한 바와 같이 상이한 예정된 미생물 농도에 대응하는 영역을 함유할 수 있다. For example, the control zone may contain a region corresponding to different predetermined biomass concentration, as described above. 또한, 상기 영역은 상이한 종류의 미생물에 대하여 상이한 감도 수준을 갖는 염료를 함유할 수 있다. Further, the region may contain a dye having a different sensitivity levels for different types of microorganisms. 기재는 염료로 도포될 수 있는 다양한 물질로부터 형성될 수 있다. The substrate may be formed from a variety of materials that can be coated with a dye. 예를 들면, 기재는 필름, 종이, 부직포, 편직물, 제직물, 발포체 등으로부터 형성될 수 있다. For example, the substrate may be formed from a film, paper, nonwoven fabric, knit fabric, woven fabric, foamed material or the like. 한 특정 실시양태에서, 기재는 라벨의 제조에 통상 이용되는 원단(facestock) 물질, 예컨대 종이, 폴리에스테르, 폴리에틸렌, 폴리프로필렌, 폴리부틸렌, 폴리아미드 등이다. In one particular embodiment, the substrate is a fabric normally used (facestock) for the production of label material, for example paper, polyester, polyethylene, polypropylene, polybutylene, polyamide and the like. 접착제, 예컨대 감압 접착제, 열-활성화 접착제, 용융 접착제 등을 원단 물질의 한 표면 이상에 이용하여 원단 물질을 목적하는 물품에 부착시키는 것을 보조할 수 있다. Adhesives, such as pressure sensitive adhesives, heat-activated adhesives may be used for a melt adhesive or the like on at least one surface of the fabric material to assist in attaching the article to the desired fabric material. 감압 접착제의 적합한 예는 예를 들면, 아크릴계 접착제 및 탄성 접착제를 포함한다. Suitable examples of pressure sensitive adhesives include, for example, an acrylic adhesive and elastomeric adhesive. 한 실시양태에서, 감압 접착제는 아크릴산 에스테르 (예를 들면, 2-에틸 헥실 아크릴레이트)와 극성 공단량체 (예를 들면, 아크릴산)의 공중합체 기재이다. In one embodiment, the pressure sensitive adhesive is a copolymer based on acrylic acid esters (e.g., 2-ethylhexyl acrylate) and a polar comonomer (e.g., acrylic acid). 접착제는 두께가 약 0.1 내지 약 2 밀 (2.5 내지 50 마이크로미터)의 범위일 수 있다. The adhesive may be a thickness of about 0.1 to about 2 mil range (2.5 to 50 micrometers). 사용하기 전에 접착제와 접촉하는 박리 라이너 또한 이용될 수 있다. The release liner in contact with the adhesive prior to use can also be used. 박리 라이너는 당업계에 공지된 다양한 물질, 예컨대 실리콘-코팅된 종이 또는 필름 기재를 함유할 수 있다. The release liner has a wide range of materials known in the art, for example silicone-may contain a coated paper or film substrate. 사용하는 동안에, 처리된 기재 및 접착제는 박리 라이너로부터 박리된다. During use, the treated substrate and the adhesive is peeled from the release liner. 그 후에, 접착제를 목적하는 위치에 인접하게 위치시켜 처리된 기재를 주위에 노출시킨다. After that, adjacent to the position where the desired adhesive exposed around the treated substrate. 도 17에, 기재가 측방 유동 장치 (20)인 본 발명의 또다른 실시양태가 도해되어 있다. In Figure 17, there is described yet another embodiment of the present invention is illustrated in the lateral flow device 20. 보다 구체적으로, 장치 (20)는 유체 매질로서 작용하고 임의로는 경질 재료 (도시되지 않음)에 의해 지지되는 다공막 (23)을 함유한다. More particularly, the device 20 acts as a fluid medium, and optionally containing porous membrane 23 which is supported by a rigid material (not shown). 일반적으로, 다공막 (23)은 시료가 통과할 수 있는 다양한 물질로부터 제조될 수 있다. In general, the porous membrane 23 can be made from various materials in the sample is allowed to pass through. 예를 들어, 다공막 (23)을 형성하기 위해 사용되는 물질은 합성 개질되는 천연, 합성 또는 자연 발생 물질, 예컨대 다당류 (예를 들면, 종이와 같은 셀룰로스 물질 및 셀룰로스 아세테이트 및 니트로셀룰로스와 같은 셀룰로스 유도체); For example, the material used to form the porous membrane 23 is synthesized to be modified natural, synthetic or naturally occurring substances, such as polysaccharides (e.g., cellulose derivatives such as cellulose material, and cellulose acetate and nitrocellulose, such as paper ); 폴리에테르 술폰; Polyether sulfone; 폴리에틸렌; Polyethylene; 나일론; nylon; 폴리비닐리덴 플루오라이드 (PVDF); Polyvinylidene fluoride (PVDF); 폴리에스테르; Polyester; 폴리프로필렌; Polypropylene; 실리카; Silica; 무기 물질, 예컨대 탈활성화된 알루미나, 규조토, MgSO 4 , 또는 비닐 클로라이드, 비닐 클로라이드-프로필렌 공중합체 및 비닐 클로라이드-비닐 아세테이트 공중합체와 같은 중합체의 다공성 중합체 매트릭스에 균일하게 분산된 기타 무기 미분 물질; Inorganic materials such as deactivated alumina, diatomaceous earth, MgSO 4, or vinyl chloride, vinyl chloride-propylene copolymer, and vinyl chloride-vinyl acetate copolymer and uniformly dispersed in a porous polymer matrix, such as polymer and other inorganic finely divided material; 자연 발생 (예를 들면, 면) 및 합성 (예를 들면, 나일론 또는 레이온) 클로쓰; Naturally occurring (e.g., cotton) and synthetic used (e.g., nylon or rayon) chloride; 다공성 겔, 예컨대 실리카 겔, 아가로스, 덱스트란 및 젤라틴; Porous gels such as silica gel, agarose, dextran, and gelatin; 중합체 필름, 예컨대 폴리아크릴아미드 등을 포함할 수 있으나, 이들로 한정되지는 않는다. The polymer film, for example, but may include such as polyacrylamide, but is not limited to these. 한 특정 실시양태에서, 다공막 (23)은 니트로셀룰로스 및/또는 폴리에테르 술폰 물질로부터 형성된다. In one particular embodiment, the porous membrane 23 is formed from nitrocellulose and / or polyether sulfone materials. "니트로셀룰로스"라는 용어는 니트로셀룰로스 단독이거나 또는 질산 및 다른 산, 예컨대 탄소수 1 내지 7의 지방족 카르복실산의 혼합된 에스테르일 수 있는 셀룰로스의 질산 에스테르를 지칭하는 것으로 이해되어야 한다. The term "nitrocellulose" are to be understood to refer to either a nitrocellulose alone or nitric acid and other acids, such as nitric acid esters of cellulose, which may be a mixed ester of an aliphatic carboxylic acid having 1 to 7. 장치 (20)는 또한 흡수 패드 (28)를 함유할 수 있다. Device 20 may also contain an absorbent pad (28). 흡수 패드 (28)는 일반적으로 전체 다공막 (23)을 통해 이동하는 유체를 수용한다. Absorbent pad 28 generally receives a full multi-fluid moving through the membrane (23). 당업계에 널리 공지된 것처럼, 흡수 패드 (28)는 막 (23)을 통한 모세관 작용 및 유체 유동을 용이하게 하는 것을 보조할 수 있다. As is well known in the art, the absorbent pad 28 may assist in facilitating capillary action and fluid flow through the membrane 23. 시료내 미생물의 검출을 개시하기 위해, 사용자는 시료를 이들이 차후에 이동하는 다공막 (23)의 일부에 직접 도포할 수 있다. To initiate the detection of the microorganism sample, the user of the sample which they can be applied directly to the part of the membrane 23 to move in the future. 별법으로, 시료를 우선, 다공막 (23)과 유동 소통하는 샘플링 패드 (도시되지 않음) 및/또는 콘쥬게이트 패드 (도시되지 않음)에 도포할 수 있다. Alternatively, the sample may be applied first, and the membrane 23 and the flow communication with the sampling pad (not shown) and / or conjugate pad (not shown). 샘플링 패드 및 콘쥬게이트 패드를 형성하기 위해 사용될 수 있는 몇몇 적합한 물질은 니트로셀룰로스, 셀룰로스, 다공성 폴리에틸렌 패드 및 유리 섬유 여과지를 포함하나, 이들로 한정되지는 않는다. Some suitable materials that may be used to form the sample pad and conjugate pad including, nitrocellulose, cellulose, porous polyethylene pads, and glass fiber filter paper, but is not limited to these. 도포되는 곳과 상관없이, 시료는 미생물의 존재를 시그널링할 수 있는 다공막 (23)에 의해 한정된 검출 대역 (31)으로 이동한다. Regardless of the place to be applied, the sample is moved to the detection zone 31 defined by the membrane (23) capable of signaling the presence of microorganisms. 특히, 도 17에 도시된 것처럼, 검출 대역 (31)은 1종 이상의 미생물과 접촉시 검출가능한 색 변화를 나타내는 시험 염료를 포함한다. In particular, as the detection range 31 shown in Figure 17 it comprises a test dye indicates a detectable color change upon contact with at least one microorganism. 분석 장치 (20)는 또한 대조 염료로 도포되고 임의로는 검출 대역 (31)의 하류에 위치하는 대조 대역 (32)을 이용한다. Analysis device 20 is further coated with a contrast dye optionally uses the control band (32) which is located downstream of the detection zone (31). 대조 대역 (20)은 시험하는 동안에 일반적으로 색이 변화하지 않아 반-정량적 및/또는 정량적 비교를 위해 사용될 수 있다. The control band (20) is not generally change color during the test with anti-may be used for the qualitative and / or quantitative comparison. 시험 염료 및 대조 염료는 때때로 다공막 (23)의 매트릭스를 통해서는 실질적으로 확산되지 않는 방식으로 도포된다. Test dyes and the control dye is applied in a manner that at times it is not substantially diffuse through the matrix into the membrane (23). 그에 따라 사용자가 목적하는 반응 시간 후에 염료의 색을 용이하게 검출할 수 있다. Thus the color of the dye after a reaction time that the user object along can be easily detected. 예를 들면, 염료는 다공막 (23)의 표면에 존재하는 관능기와 이온 결합 및/또는 공유 결합을 형성하여 고정된 상태로 잔류한다. For example, the dye is to form a functional group with ionic bonding and / or covalent bonds existing on the surface of the membrane (23) remains fixed. 한 실시양태에서, 양으로 하전된 염료는 몇몇 다공막 (예를 들면, 니트로셀룰로스)의 표면에 존재하는 음으로 하전된 카르복실기와 이온 결합을 형성할 수 있다. In one embodiment, the positively charged dye may form a few membrane (e.g., nitrocellulose) ion charged carboxyl group and negatively from the surface of the coupling. 별법으로, 염료가 다공막 (23)의 매트릭스로 확산되는 것을 실질적으로 억제하는 특정 성분을 염료 용액에 첨가할 수 있다. Alternatively, a certain ingredient is substantially suppressed in that the dye is diffused into the matrix of the porous membrane 23 may be added to the dye solution. 기타 경우에는, 고정화가 필요하지 않을 수 있고, 대신 염료가 시료와의 반응을 위해 다공막 (23)의 매트릭스로 확산될 수 있다. In other cases, the immobilization can not be required, and the dye is able to diffuse into the matrix of the membrane sample (23) to a reaction with instead. 하기 실시예가 본 발명의 다양한 실시양태를 예시하는 것을 도와준다. Carrying example helps to illustrate various embodiments of the invention. 모든 바이러스는 미국 뉴저지주 페어필드 소재의 지브랄타르 래보러토리즈, 인크. (Gibraltar Laboratories, Inc.)로부터 입수하였다. All viruses were obtained from Gibraltar to watch Le below in Fairfield, New Jersey, USA Sat material Leeds, Incredible. (Gibraltar Laboratories, Inc.). 레이차트 염료 (2,6-디페닐-4-(2,4,6-트리페닐피리디니오)-페놀레이트) 및 1-도코실-4-(4-히드록시스티릴)-피리디늄 브로마이드는 미국 위스콘신주 밀워키 소재의 알드리치 케미컬 컴퍼니로부터 구입하였다. Ray chart dye (2,6-diphenyl-4- (2,4,6-phenyl pyridinium NO) phenolate) and 1-docosyl-4- (4-hydroxy styryl) pyridinium bromide It was purchased from Aldrich Chemical Company of Milwaukee, Wisconsin, USA. 본 연구에서 사용된 다른 메로시아닌들은 직접 합성하였고 하기에 상세히 기재되어 있다. And not during the other booties used in this study is described in detail below were synthesized directly. 1-데코실-4-(4-히드록시스티릴)-피리디늄 브로마이드는 알드리치 케미컬 컴퍼니 (미국 위스콘신주 밀워키)로부터 구입하여 직접 사용하였다. 1-deco room-4- (4-hydroxy styryl) pyridinium bromide was used directly purchased from Aldrich Chemical Company (Milwaukee, Wisconsin, USA). 메로시아닌 염료의 추가 예들은 2단계 반응을 통해 실험실에서 합성되었다. Additional dyes merocyanine examples were synthesized in a laboratory using a two-phase reaction. 합성 방법을 사용하여 제조된 합성 염료는 도 3에 나타내었다. It prepared using the synthesis method Synthetic dyes are shown in Fig. 도 4에 도시된 것처럼, 메틸 요오다이드를 빙조에서 이소프로판올 50 ml 중 δ-피콜린의 교반 용액에 서서히 첨가하였다. Figure 4, as, methyl iodide was slowly added to a stirred solution of the δ- picoline in 50 ml of isopropanol in an ice bath shown in. 첨가를 완료한 후에, 반응물을 가열 환류시키고 2시간 동안 계속 환류하였다. After the addition was complete, the reaction was heated to reflux was continued at reflux for 2 hours. 그 후에, 빙조에서 용액을 냉각한 뒤 부흐너(Buchner) 깔때기에서 침전물을 여과하고, 냉각된 알콜로 세척하였다. Thereafter, the precipitate was filtered off on a Buchner back (Buchner) funnel and the solution was cooled in an ice bath, and washed with cold alcohol. 이어서 2시간 동안 증기 후드에서 분말을 건조시켰다. Then the powder was dried in a steam hood for 2 hours. 조 생성물의 수율은 18.6 그램이었다. The yield of crude product was 18.6 grams. 조 생성물을 더 이상 정제하지 않고 다음 단계에 직접 사용하였다. Without further purification the crude product was used directly in the next step. 도 5에 도시된 것처럼 N-메틸-δ-피콜론 (9.4 g, 0.04 몰) 및 바닐린 (6.1 g, 0.04 몰)을 모두 에탄올 50 ml 중에서 교반하면서 용해시켰다. Also the N- methyl -δ- blood colon, as shown in 5 (9.4 g, 0.04 mol) and vanillin (6.1 g, 0.04 mole) both dissolved with stirring in 50 ml of ethanol. 상기 용액에 피페리딘 (3.4 g, 0.04 몰)을 첨가하고, 혼합물을 16시간 동안 환류하였다. It was added piperidine (3.4 g, 0.04 mol) to the solution, and the mixture was refluxed for 16 hours. 그 후에, 반응 혼합물을 빙조에서 냉각하고 부흐너 깔때기를 사용하여 생성물을 여과하고 냉각된 에탄올로 세척하였다. Thereafter, the reaction mixture was cooled in an ice bath and the product filtered, using a Buchner funnel, washed with cold ethanol. 그 후에, 상기 화학식 13 (여기서, R=메틸)의 조 염료를 60분 동안 0.2몰 수산화칼륨 용액 250 ml 중에서 교반하여 양쪽성 이온을 형성한 뒤 부흐너 깔때기를 사용하여 여과하였다. Thereafter, the formula (13) (wherein, R = methyl) was filtered and the crude was stirred in 250 ml of a dye solution of 0.2 mol of potassium hydroxide for 60 minutes, using the zwitterion form a rear Buchner funnel. 이어서 최소량의 1:1 물/메탄올 혼합물로부터 염료를 결정화하였다. Then a minimal amount of 1: dye was crystallized from 1 water / methanol mixture. 수율은 9.4 g (98％)이었다. The yield was 9.4 g (98%). 다른 염료도 각각의 알킬 요오다이드로부터 출발하여 유사한 방식으로 합성하였다. Other dyes were also synthesized in a similar manner starting from the respective alkyl iodide. 하기 표 1은 3가지 다른 R기의 화합물 및 화학식 13의 염료의 수율을 나타내고 있다. Table 1 shows the yield of the compound and the dye of formula (13) in three different R groups. 스프레이로서 이들 염료의 사용을 연구하기 위해, 레이차트 염료 용액 (아세토니트릴 10 ml 중 160 mg)을 제조하였다. 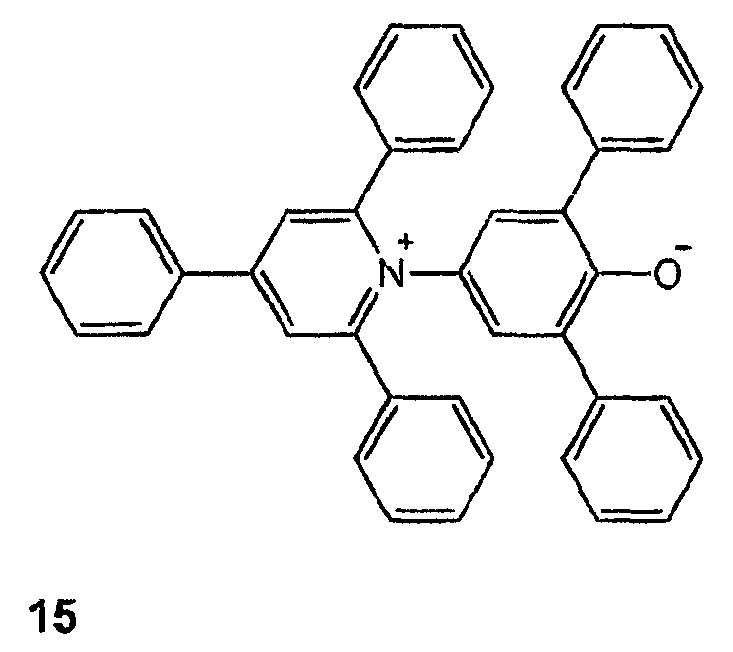 As a spray to study the use of these dyes, the dye solution was prepared ray chart (acetonitrile 160 mg in 10 ml). 에어로졸 추진체를 갖는 스프레이병을 이용하여 스프레이 장치를 형성하였다. By using a spray bottle having an aerosol propellant to form a spray. 생닭의 다리를 수일간 상온에 방치하여 높은 세균 수준을 보장하였다. Allowed to stand for several days at room temperature the raw chickens legs were ensure high bacterial levels. 도 6에 도시된 것처럼, 닭 다리를 세라믹 플레이트 표면 상에 몇 초간 놓아둔 뒤 (6A), 제거하고, 그 후에 닭즙의 잔류물을 제거하기 위해 표면을 압지로 닦아냈다 (6B). As it is shown in Figure 6, after the chicken legs placed on a ceramic plate for several seconds and release surface (6A), removed, and then wiped the surface with blotting paper to remove the remainder of the daljeup (6B). 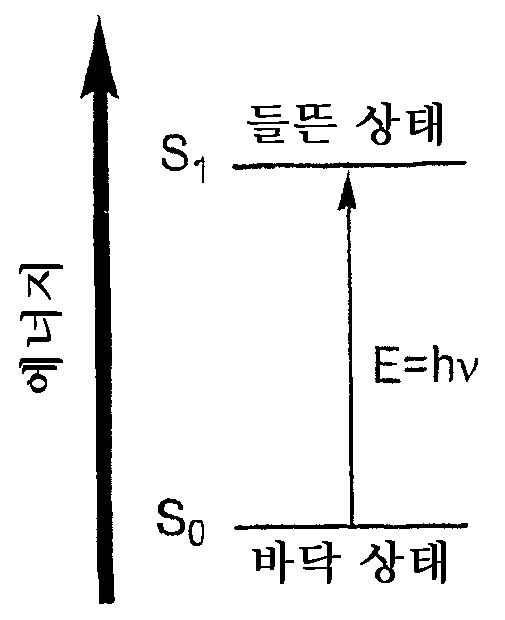 이어서, 스프레이병을 이용하여 표면에 레이차트 염료 용액을 분무하였다 (6C). Was then using a spray bottle to spray-ray chart dye solution to the surface (6C). 반복성을 보장하기 위해 추가의 닭 조각으로 시험을 반복하여 유사한 결과를 얻었다. Repeat the test with a piece of chicken added to ensure the repeatability, to obtain similar results. 표면에 지시제 염료 용액을 분무한 후, 닭과 접촉하였던 전 영역이 탈색되었으며 (즉, 지시제 스프레이의 색이 청색에서 매우 옅어지거나 무색으로 변함), 닭의 윤곽을 나타내었다 (6D). After spraying the dye solution indicated in the surface, the entire area was in contact with the chickens who exhibited a discoloration (i.e., or the color of the spray directed so faded change from blue to colorless), the outline of the chicken (6D). 표면상에 닭이 놓여졌던 곳에 상응하는 정확한 지점에서 염료가 신속히 탈색되었다. In the corresponding exact point where chickens had been placed on the surface of the dye it was rapidly fading. 이소프로판올은 그 자체의 소독 능력으로 인해 추가의 이점을 가질 수 있는담체로서 연구되었다. Isopropanol has been studied as a carrier that can have the added advantage of due to its ability to disinfect itself. 레이차트 염료를 이소프로판올에 용해시켰다 (이소프로판올 10 ml 중의 염료 160 mg). It was dissolved in isopropanol ray chart dye (dye in 10 ml isopropanol, 160 mg). 세균 오염을 시험하기 위한 "실세계" 표면으로서 플라스틱 문 손잡이를 이용하였다. As a "real world" test the surface for bacterial contamination were used for the plastic door handles. 오래된 닭에서 생긴 즙을 사용하여 손잡이 중 하나의 표면을 표시하였다. Use the juice from looking old chickens were displayed to one surface of the handle. 나머지 문 손잡이는 대조군으로서 오염되지 않은 채로 남겨 두었다. The remaining door handle was left untouched as pollution control. 두 손잡이 모두를 닦아냈다. It wiped both handles. 염료의 이소프로판올 용액을 두 표면 모두에 분무하였다. Isopropanol solution of the dye was sprayed on both surfaces. 레이차트 염료의 청색에서 무색으로의 탈색에 의해 문 손잡이의 오염 영역을 용이하게 관찰하였다. In blue-ray chart of the dye by the color of the colorless and was observed to facilitate the contaminated area of ​​the door handle. 레이차트 염료 지시제는 닭에서 유래한 미생물에 대하여 높은 감도를 보이는 것으로 나타났다. Ray chart indicator dye was found to show high sensitivity to microbes derived from chicken. 지시제를 위 양성 판독인지를 시험하기 위해, 지질 및 단백질과 같은 닭즙의 다른 성분이 사용되었다. An instruction to test the whether the above positive reading, the other components of the daljeup such as lipids and proteins have been used. 비-세균성이면서 잠재적인 간섭의 가능성이 높은 닭 브로쓰가 사용되었다. Non-bacterial, yet is likely chicken broth potential interference was used. 새로 개봉한 캔의 스완슨(Swanson; 등록상표) 닭 브로쓰 (미국 뉴저지주 소재의 캠프벨 수프 컴퍼니(Campbell Soup Co.), 소매 식료품점에서 구입 가능함)를 세라믹 표면 상에 피펫으로 떨어뜨리고, 스코트 (SCOTT; 등록상표) 종이 타월로 닦아 건조하였다. Swanson is a newly opened cans; dropping the (Swanson TM) chicken broth (USA Campbell Soup Company of New Jersey material (Campbell Soup Co.), purchased from retail grocery stores possible) dropped with a pipette onto the ceramic surface, Scott (SCOTT; registered trademark) was wiped dry with a paper towel. 또한 기지의 양성 대조군으로서, 오래된 닭에서 생긴 즙을 세라믹 표면 상의 다른 위치에 피펫으로 떨어뜨리고 닦아 건조하였다. In addition, by drying as a positive control of the base, and the resulting clean dropping juice from old chickens with a pipette to another location on the ceramic surface. 레이차트 염료 지시제 (이소프로판올 10 ml 중 160 mg)를 세라믹 표면 상에 분무하였더니 명확하게 오래된 닭즙 (따라서 세균)을 함유하는 면만이 탈색되었다. Ray chart dye indicator (160 mg in isopropanol, 10 ml) was made sprayed onto the ceramic surface was clearly daljeup old (and thus bacteria) bleaching the dwell containing. 본 실험을 통하여, 닭의 경우에 탈색 반응을 일으키는 것이 닭의 지방이나 단백질 같은 몇몇 이차 성분이 아니라, 실제로 세균인 것으로 결론내릴 수 있었다. Through this study, it causes discoloration reaction in the case of chickens, but some secondary ingredients such as chicken fat or proteins, could conclude that the bacteria actually. 세정 보조제로서 이소프로판올 중 레이차트 염료 스프레이의 사용 또한 시험하였다. The use of dye-spray-ray chart of isopropanol as washing aids were also tested. 도 7에 도시된 것처럼, 사각형 모양의 세라믹 표면을 절반으로 나누어 양쪽 모두에 오래된 닭즙을 세로로 발랐다 (7A). As shown in Figure 7, was right old daljeup both the ceramic surface of the square shape divided in half vertically (7A). 하나의 절반 A면에, 스코트 (등록상표) 종이 타월로 표면을 철저하게 닦는 것 외의 다른 세정은 실시하지 않았다. To one half of the A-side, SCOTT (R) other than other washing thoroughly wiping the surface with a paper towel was not carried out. 나머지 절반 B면에는, 킴벌리-클라크 프로페셔널 모이스춰라이징 인스턴트 손 소독제 (60％ 에탄올 용액, 미국 조지아주 로즈웰)를 타월에 묻혀, 표면을 세정하는데 사용하였다 (7B). Other half of the B-side, the Kimberly-Clark Professional Moisturizing Instant Hand soaked in a disinfectant (60% ethanol solution, Roswell, Georgia, USA) in a towel and used to clean the surface (7B). 그 후에, 세정에 차이가 있는지를 판단하기 위해 레이차트 염료 스프레이를 도포하였다 (7C). After that, the Ray Chart dye spray was applied to determine whether a difference in cleaning (7C). 세정제가 도움이 되기는 했으나, 몇몇 영역을 "놓친" 것을 알 수 있었다 (7D). But detergent Although helpful, it was found that "missed" some areas (7D). 다음으로, KC 프로페셔널 소독제로 다시 양쪽의 가늘고 긴 영역의 아래 절반을 철저하게 세정하고, 이때 가장 세정이 필요한 곳을 나타내기 위해 스프레이로부터 나타난 표시를 사용하였다 (7E). Next, KC Professional disinfectant to thoroughly clean the bottom half of the back of an elongated area of ​​both sides, at which time the display appears from the spray was used to indicate where the cleaning is necessary (7E). 상기 영역에 다시 분무를 하면 (7F), 탈색이 일어나지 않았고 이는 표면의 청결함을 증명하였다 (7G). When the re-sprayed to the area (7F), the discoloration did not take place, which proved that the cleaning of the surface (7G). 본 실험은 세균 오염에 대한 레이차트 염료의 표면 코팅물의 반응능을 시험하였다. This experiment tested the ability of the surface coating reaction ray chart dyes for bacterial contamination. 도 8에 도시된 것처럼, 종이 시트를 레이차트 염료 용액 (80 mg/10 ml 아세토니트릴)으로 브러쉬-코팅하였다 (8A). 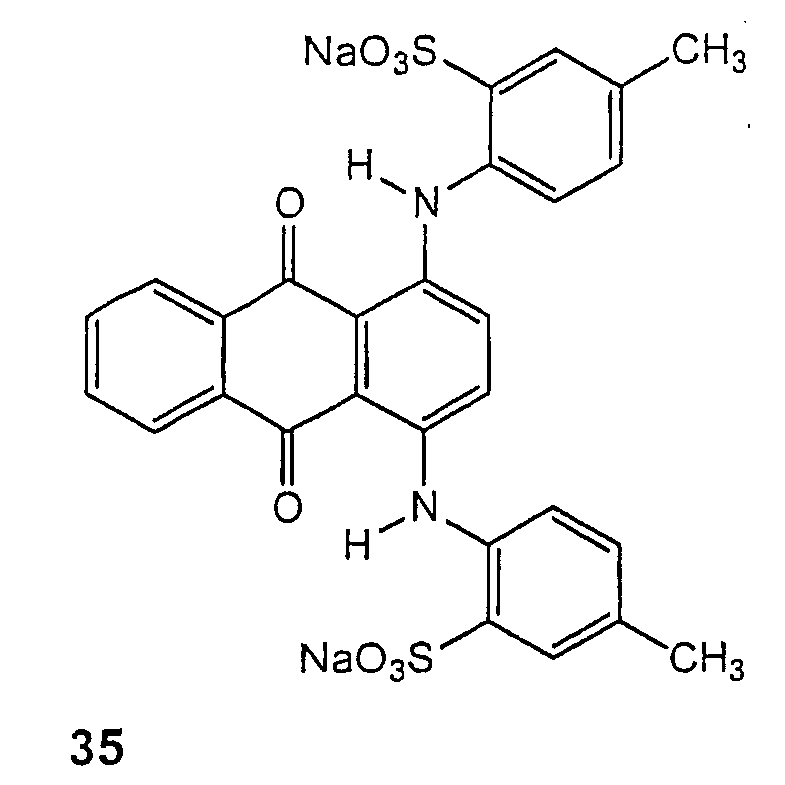 It was coated (8A) - the brush-ray chart as the dye solution (80 mg / 10 ml acetonitrile), the paper sheet, as shown in Fig. 상기 종이에 10 7 , 10 6 , 10 5 및 10 4 CFU/ml의 대장균 또는 S. 아우레우스 용액 100 ㎕ 분량을 첨가하였다 (8B). 10 7, 10 6, 10 5 and 10 4 E. coli or S. aureus solutions 100 ㎕ amount of CFU / ml was added to the paper (8B). 물을 음성 대조군으로서 사용하였다. Water was used as a negative control. 두 종류 모두 세균으로 오염되었을 때 염료의 색이 신속히 사라졌으나 (8C), S. 아우레우스의 경우에 더욱 신속하였다 (8D). Jyeoteuna the color of the dye disappears rapidly when both kinds be contaminated with bacteria (8C), it was more rapid in the case of S. aureus (8D). 두 세균 용액이 모두 실제로 10 7 CFU/ml 농도였으나, 대장균 용액이 1 X 10 7 CFU/ml인 것에 비해, S. 아우레우스 용액의 실제 농도는 7 X 10 7 CFU/ml라는 것이 후에 밝혀졌다. Two yeoteuna bacteria solution are all actually 10 7 CFU / ml concentration, as compared to the E. coli solution is 1 X 10 7 CFU / ml, S. Au LES actual concentration of the solution Uz was found later that of 7 X 10 7 CFU / ml . 세균 용액에 대해 신속한 탈색 (1분 미만)이 관찰된 반면, 물은 수분 후에 염료의 약간의 탈색을 일으켰다. While the rapid discoloration (less than one minute) for the bacteria solution was observed, the water is caused a slight discoloration of the dye after moisture. 자가-접착 스티커 (에버리-데니슨(Avery-Dennison)) 종이 시트를 2가지 다른 농도의 레이차트 염료 용액 (160 mg/10 mL 아세토니트릴, 80 mg/10 mL 아세토니트릴)으로 브러쉬-코팅하였다. The self-adhesive stickers-brush (Avery Dennison (Avery-Dennison)), the paper sheet 2 ray chart dye solution of different concentrations (160 mg / 10 mL acetonitrile, 80 mg / 10 mL acetonitrile) were coated. 스티커를 하기스(Huggies; 등록상표) 젖은 와이프 상자의 뚜껑 및 래치 장치에 부착하였다. Huggies stickers (Huggies; registered trademark) was attached to the lid and latch mechanism of a wet wipe box. 장갑 낀 손으로 스티커의 표면에 10 7 CFU/mL의 S. 아우레우스를 옮겼다. Gloved hands moved to 10 7 CFU / mL of S. aureus on the surface of the sticker. 두 농도 모두에서 신속히 탈색되었으나, 보다 낮은 농도의 염료를 도포한 표면에서 탈색이 보다 쉽게 보였으며, 이는 검출과 명확한 시각적 대비를 보이는 최적의 코팅 농도가 있을 수 있음을 나타낸다. But quickly discolored at both concentrations, it showed more easily than the color of a dye in a surface coating of a low density, which indicates that there may be an optimal coating concentration showing the detection and clear visual contrast. 스티커는 다양한 용도에서 세균 오염을 쉽고 신속하게 검출하는 수단을 제공할 수 있다. Stickers may provide a means for easily and quickly detect bacterial contamination in a variety of applications. 기재에 고정된 염료를 액상 세균과 접촉 (실시예 5)시키는 것보다는 기재 상에서 세균을 액상 염료를 사용하여 시험함으로써 레이차트 염료-기반 세균 지시제의 신규한 잠재력을 파악할 수 있었다. They were able to identify novel potential of the bacterium-based instruction - contacting a dye fixed to the base material and liquid bacteria (Example 5) based on the bacterial vector chart dye by testing using a liquid dye, rather than to. 본 실험은 어떤 표면에 있는 기지 농도의 세균에 염료 용액이 어떻게 반응하는지를 밝혀내는데 주력하였다. This experiment was focused figure out how the dye solution in response to a known concentration of bacteria in any surface. 100 ㎕의 10 8 CFU/ml 그람-양성 세균을 스코트 (등록상표) 타월에 묻혔다 (도 9A). Of 100 ㎕ 10 8 CFU / ml Gram-positive bacteria in the buried SCOTT (R) towel (Figure 9A). 이 지점에 아세토니트릴에 용해된 레이차트 염료 (10 ml 아세토니트릴 중의 160 mg) 한 방울을 떨어뜨렸다 (9B). Dropped (160 mg in 10 ml acetonitrile) one drop at this point the ray chart dye dissolved in acetonitrile (9B). 비교를 위해, 염료를 떨어뜨린 지점을 타월 위에서 건조시킨 후 동량의 세균을 첨가하였다. For comparison, after drying the dropped point the dye on the towel was added to the same amount of bacteria. 일단 세균이 있는 지점에 첨가되면, 레이차트 염료는 즉시 탈색되었다. Once added to the bacteria that point, the chart-ray dye was fading away. 이와 반대로 염료-함유 셀룰로스 타월 상에 있는 세균의 반응은, 탈색에 수분이 소요되었다. In contrast, the dye-containing reaction of bacterial cellulose on the towel, the water was required for bleaching. 세균이 있는 지점에 추가로 염료 방울을 적가하면 (9C), 네번째 방울까지 탈색 상태가 유지되었다가, 이 시점부터 보라색이 지속되었다 (9D). If the dropwise addition of dye droplets in addition to the point that the bacteria (9C), until the color of the fourth droplet remained and became a purple continues from the point (9D). 피펫으로 아세토니트릴을 첨가하여 염료가 코팅된 스코트 (등록상표) 타월 위의 염료 색을 다시 복구하려는 시도는 실패하였다 (9E). By the addition of acetonitrile to a pipette attempt to re-dye the recovery of the dye color of the upper Scott (registered trademark) coated towel was unsuccessful (9E). 기재-고정 세균에 의한 염료 용액의 신속한 탈색과 그 반응이 종료점에 도달한다는 사실의 발견은, 세균의 CFU/ml에 관한 정량적 정보를 제공하는 염료의 능력에 관한 조사를 촉진시켰다. Substrate - discovery of the fact that the dye solutions of rapid fading and the reaction using the fixed bacteria reached the ending point is to promote the research on the ability of a dye to provide a quantitative information on the CFU / ml of bacteria. 본 실험은 기재-고정 세균의 여러 농도를 염료로 적정하여 색을 안정화시키는데 필요한 염료의 양이 세균의 CFU/ml에 따라 변하는지를 확인하는데 목적이 있다. The experiment described - aims to ensure that the amount of dye required to stabilize the color by titrating the various concentrations of the fixed bacteria, a dye that varies the CFU / ml of bacteria. 연속 희석된 S. 아우레우스 세균 현탁액 100 ㎕를 각각 스코트 (등록상표) 종이 타월에 묻혔다. SCOTT (R) a series of diluted S. aureus bacterial suspension 100 ㎕ each was buried in the paper towel. 레이차트 염료의 아세토니트릴 용액 (40 mg/10 ml)의 방울 (10 ㎕)을 피펫을 이용하여 세균이 있는 각 지점에 떨어뜨렸다. Ray using a droplet (10 ㎕) in acetonitrile solution (40 mg / 10 ml) of the dye chart pipette and dropped at each point in the bacteria. 염료 용액은 처음에는 색을 띄나 거의 즉각적으로 (1초 미만) 탈색이 되며, 염료가 더 이상 탈색되지 않으며 보라색/청색이 흐려지지 않을 때까지 동일한 지점에 추가로 방울을 떨어뜨렸다. Dye solution is dropped to the drop initially added to the same point ttuina color almost immediately (less than one second), and discoloration, until the dye is not be no longer decolorized the violet / blue blur. 이를 상이한 세균 농도를 묻힌 각각의 지점에서 반복하였다. This was repeated at each point moistened with different bacteria concentrations. 결과는 표면 또는 기재 상에서 세균 오염 수준과 충분한 상관관계가 있음을 보여 주었다. The results showed that there is sufficient correlation with the level of bacterial contamination on a surface or substrate. 본 신규 방법의 실제 사용 예를 예증하기 위해, 오래된 풀링 여성 소변 샘플 (100 ㎕)을 셀룰로스 타월에 묻혀 몇몇 지점에서 각각 100 ㎕ 부피의 소변을 제공하였다. To illustrate the practical use of the present novel process, the old pooled female urine sample (100 ㎕) to give a volume of 100 ㎕ urine respectively at some point buried in the cellulosic towel. 2종류의 염료 용액을 적정 연구를 위하여 사용하였다: 40 mg 염료/10 ml 아세토니트릴 및 160 mg 염료/10 ml 아세토니트릴. The two kinds of the dye solution was used for titration study: 40 mg dye / 10 ml acetonitrile and 160 mg dye / 10 ml acetonitrile. 이어서 염료 용액을 10 ㎕ 분량으로 소변 지점에 떨어뜨리고, 청색/보라색 염료 색이 유지될 때까지 계속하였다 (즉, 색이 일정해질 때까지 소변에 염료를 첨가함). Was then dropped in the urine point of the dye solution in an amount of 10 ㎕ was continued until the blue / purple dye color is maintained (that is, color is added to the dye on the urine until the constant). 표 2는 염료 색이 계속 일정하게 유지되기 (즉, 더 이상 탈색되지 않기) 위해 필요한 각 염료 용액의 부피를 나타내고 있다. Table 2 shows the volume of each dye solution required for the dye color (not to be that is, no longer decolorized) continues to be constant. 오래된 여성 소변은 세균 오염 수준이 높은 것으로 알려져 있으며, 본 사전 연구는 상기 특정 샘플이 높은 수준으로 오염되었다는 것을 보여주었다. Women and old urine is known to have high levels of bacterial contamination, the prior study showed that the samples contaminated above a certain higher level. 더욱 농축된 (4배 농축) 염료 용액보다 더욱 희석된 (4배 희석) 염료 용액이 4배로 필요하다는 것이 흥미롭다. The more dilute than the more concentrated (concentrated 4-fold) dye solution (4X dilution) are interesting it is that the dye solution is required four times. 이것은 포화 상태를 위해 필요한 양을 최소화하기 위해 최고 농도의 염료를 사용함으로써 서로 다른 산업 분야 (식품 대 의료 등)에서 나타나는 다양한 CFU 수준에 지시제 시스템을 맞출 수 있도록 한다. This allows the use of the dye of the highest concentration of each other comes to the indicator system, a variety of CFU depth are in different industries (food vs. healthcare, etc) in order to minimize the amount required for saturation. 예를 들어, 닭 부위는 시간과 보관 상태에 따라 어느 지점이나 10 2 내지 10 9 의 세균 농도를 초래할 수 있다. For example, chicken parts may result in a bacteria concentration of any point or 10 2 to 10 9 over time, and storage conditions. 그러나, 식품 생산자 및 취급자들은 질병에 대한 우려로 인하여 10 7 이나 이보다 높은 수준에만 주의를 기울인다. However, food producers and handlers will pay attention only to the high level of 7 or 10 than due to concerns about the disease. 반면, 병원은 일반적으로 질환, 질병, 또는 수술 때문에 몇몇 방식으로 이미 면역 결핍된 환자들을 치료하고 있다. On the other hand, hospitals are generally treating diseases, disorders, or patients already immunocompromised in some way because of the surgery. 따라서 병원 직원은 대부분의 다른 산업 분야보다 훨씬 낮은 수준의 세균에도 주의를 기울여야 하고 감염되기 쉬운 환자들의 감염 위험을 감소시키기 위하여 지시제 염료 농도를 그들의 특별한 요구에 맞춤으로써 잠재적으로 이득을 얻을 수 있다. Therefore, the hospital staff can get the potential benefits to the indicator dye concentration by matching their specific needs in order to reduce the risk of infection from a much lower level also tend to be pay infected attention bacteria patient than most other industries. 앞에서 기재한 것과 동일한 방식으로, 세균 및 기타 미생물을 피펫으로 떨어뜨리는 기재로서 셀룰로스 타월을 사용하였다. In the same manner as that described earlier, a cellulosic towel was used as the substrate to drop the bacteria and other microorganisms with a pipette. 10 7 CFU/ml의 S. 아우레우스, C. 알비칸스 (효모), G. 바기날리스, 대장균, P. 애루기노사 및 L. 액시도필러스를 타월에 피펫으로 떨어뜨렸다 (각각 100 ㎕). 10 7 CFU / ml of S. aureus, C. albicans (yeast), G. Bagi day lease, E. coli, P. rugi dropped her labor and L.'s solution with a pipette filler try the towel (100 each ㎕). 추가로, 10 5 의 A. 니게르 (흔한 곰팡이)를 타월에 피펫으로 떨어뜨렸다. In addition, they dropped a pipette A. Gershon (a common mold) on 10 May on the towel. 그 다음 레이차트 염료 용액 (10 ml 아세토니트릴 중의 160 mg)을 10 ㎕ 분량으로 각 지점에 첨가하고 지속적인 색을 얻는데 필요한 방울의 수를 계수하였다. Then ray chart dye solution (160 mg in 10 ml acetonitrile) was added to each counting the number of points required to drop to obtain a continuous color with 10 ㎕ amount. 각 유기체에 대하여 지속적으로 보라색을 유지하는데 필요한 염료의 양을 표 3에 나타내었다. To continue to maintain the violet for each organism is shown the amount of dye necessary in Table 3. 가장 강력한 반응은 L. 액시도필러스에서 관찰되었고, 뒤이어 S. 아우레우스, G. 바기날리스, 대장균, P. 애루기노사, C. 알비칸스, 그리고 마지막은 A. 니게르였다. The most powerful response was observed in L. liquid filler's attempts, followed by S. aureus, G. Bagi day lease, E. coli, P. rugi her labor, C. albicans and A. were you last Stavanger. 그람-음성인 G. 바기날리스만큼 그람-양성인 S. 아우레우스도 강력한 반응을 보이는 것 같지만, 정상상태 반응에 도달하는 데 필요한 양은 다양한 종류의 세균 및 병원체에 따라 서로 상이하였다. Gram-positive, were different from each other depending on the S. aureus is also a wide variety of bacterial pathogens and the amount needed to reach a steady state reaction, but will exhibit a strong reaction - negative G. Bagi less by Gram day. 본 지시제 기술이 어떻게 작용하는지는 세균 세포벽에서 통상 발견되는 분자를 이용하여 파악할 수 있었다. This indicated that the technology is what action could determine by using a molecule which is normally found in the bacterial cell wall. 그람-양성 세균 및 그람-음성 세균의 표면을 차지하는 화합물에 몇몇 공통성이 있으나, 그들의 배열 및 화학적 조성은 서로 다르다. Gram-positive bacteria and gram-but some commonality in the compounds which accounts for the surface of the negative bacteria, their arrangement and chemical composition differ from each other. 그람-음성 세균은 지질다당류 (LPS)로 코팅된 외막을 지니고 있다. Gram-negative bacteria may have an outer membrane coated with lipopolysaccharide (LPS). LPS는 그람-음성 세균의 표면에 순-음전하를 제공하고, 그것의 병원성에 기여한다. LPS is a gram-negative bacteria of the order on the surface - provided with a negative charge, and contributes to its pathogenicity. 그람-양성 세균은 두꺼운 펩티도글리칸 또는 무레인의 시트형 층으로 코팅되어 있다. Gram-positive bacteria are coated with a sheet-like layer of too thick peptidoglycan glycan or a stuffiness. 시트는 교대하는 N-아세틸글루코사민과 N-아세틸무람산 분자로부터 형성된다. A sheet is formed from alternating N- acetylglucosamine and N- acetyl muram acid molecules. 또한 테이코산도 그람-양성 세균에서 발견되며, N-아세틸무람산에 연결될 수 있다. In addition, table nose pH gram-positive bacteria are found in, can be coupled to the N- acetyl muram acid. 그람-음성 세균도 펩티도글리칸을 갖고 있으나, 그람-양성 세균의 층이 훨씬 두껍다. Gram-negative bacteria also have peptidoglycan, but glycans, gram-positive bacteria of the layer is much thicker. 게다가, 그람-음성 세균의 펩티도글리칸 층은 LPS 층의 아래에 위치하고 있어, 표면에서부터 접근하기가 어렵다. In addition, Gram-negative bacteria, peptidoglycan of FIG glycans layer is situated underneath the LPS layer, making it difficult to access from the surface. 스코트 (등록상표) 종이 타월에 대장균-유래 해독된 지질다당류 (지질 A 성분 제거됨), 스트렙토코쿠스 패칼리스( Streptococcus faecalis ) 유래의 리포테이코산, 대장균-유래 지질다당류, 및 무람산의 용액을 묻혔다. It was buried and the solution derived from lipopolysaccharide, and muram acid-SCOTT (R) paper towel coli to - a lipopolysaccharide decrypt origin (Lipid A component removed), Streptococcus faecalis (Streptococcus faecalis) lipoic table Kosan, E. coli-derived . 순수 LPS를 제외한 모든 용액은 5％ (중량/중량), 1％ (중량/중량) 및 0.2％ (중량/중량) 농도로 제조하였다. All solutions except Pure LPS was prepared in 5% (wt / wt), 1% (w / w) and 0.2% (weight / weight) concentration. 순수 LPS는 안전성 때문에 0.1％ (중량/중량), 0.02％ (중량/중량) 및 0.004％ (중량/중량)로 제조하였다. Pure LPS was prepared in 0.1% (w / w), 0.02% (w / w) and 0.004% (w / w) because of safety. 레이차트 염료 (10 ml 아세토니트릴 중의 160 mg)를 10 ㎕ 분량으로 각 지점에 첨가하고 지속적인 색을 얻는데 필요한 염료의 양을 기록하였다. Ray chart dye (160 mg in 10 ml acetonitrile) was added to each point with 10 ㎕ volume and record the amount of dye necessary to achieve continuous color. 종이 타월의 염료 지점에 세포벽 화합물을 떨어뜨리는 반대의 실험 또한 실시하였다. Experimental opposite to drop the cell wall to the dye compound point of paper towel were also carried out. 무람산은 가장 강력한 반응을 일으켜서, 양쪽 실험 설정에서 염료의 거의 즉각적인 탈색을 초래하였다. Muram acid causes the strongest reaction, it resulted in almost immediate decolorization of the dye in both experimental settings. 다른 화합물도 결국 염료의 탈색을 일으키나, 무람산만큼 강력하게 반응하지는 않는 것으로 보인다. Other compounds eventually ileukina discoloration of the dye, but does not appear to react as strongly acid muram. 무람산은 그람-양성 세균에서 보다 높은 농도로 발견되기 때문에, 이러한 결과는 상기 염료의 CFU/mL 데이터를 제공하는 능력 뿐만 아니라, 반응의 강도와 속도에 기초하여 그람-양성 세균 및 그람-음성 세균을 구별하는 능력을 보여주고 있다. Muram acid Gram - since than found in high concentrations in positive bacteria, these results as well as the ability to provide CFU / mL data of the dye, gram on the basis of the intensity and speed of the reaction - the negative bacteria-positive bacteria and gram show the ability to differentiate. 레이차트 염료 지시제는 상온에서 보관하였던 생 닭고기에서 성장하는 미생물에 대하여 높은 감수성을 갖는 것으로 나타났다. Ray chart dye indicator is shown to have a high sensitivity with respect to the micro-organisms growing in raw chicken who stored at room temperature. 그러나 위 양성 판독의 가능성을 고려할 때, 지질 및 단백질과 같은 닭즙의 다른 성분에 대한 지시제의 반응 시험이 필요하게 되었다. However, it has become necessary for the reaction test indicator to other components of the daljeup such as lipids and proteins, given the possibility of the above positive reading. 자연 발생 물질로 인한 잠재적인 간섭을 감시하기 위하여, 캔에 든 닭 브로쓰를 지질, 단백질 등과 같은 닭 유래 산물을 함유하는 대조군으로서 이용하였다. To monitor the potential interference caused by naturally occurring substances, it was used for all chicken broth to the can as a control containing a chicken derived products such as lipids, proteins. 새로 개봉한 스완슨 (등록상표) 닭 브로쓰를 고온 플레이트 표면에 피펫으로 떨어뜨리고 스코트 (등록상표) 타월로 닦아 건조하였다. To drop the newly opened Swanson (R) chicken broth with a pipette to the hot plate surface was wiped dry with SCOTT (R) towel. 양성 대조군으로서 며칠간 상온에서 보관한 생닭의 즙도 고온 플레이트에 피펫으로 떨어뜨리고 닦아 건조하였다. As a positive control, a juice of the raw chickens kept for several days at room temperature to dryness wipe dropped with a pipette on a hot plate. 레이차트 염료 지시제 (10 ml 이소프로판올 중의 160 mg)를 표면에 분무하였더니, 명백하게 오래된 닭즙 (따라서 세균)을 함유하는 면만이 탈색되었다. Ray was made on the chart dye indicator (160 mg in 10 ml of isopropanol) in the spray surface, obviously old daljeup (thus bacteria) the dwell containing became discolored. 본 실험으로부터, 닭의 경우에 있어서 탈색 반응을 일으키는 것은 닭의 지방이나 단백질 같은 몇몇 다른 성분들이 아니라 실제로 미생물의 존재라고 결론내릴 수 있었다. From this experiment, it causes discoloration reaction in the case of chickens, but that some other ingredient such as chicken fat or proteins could actually conclude that the presence of microorganisms. 무람산과 같은 세포벽 성분과 레이차트 염료의 상호작용에 관한 예비 결과와 잠재적인 위 양성 판독을 확인하기 위한 작업은, 산과의 반응이 레이차트 염료의 탈색에 기여할 수 있다는 점을 암시하였다. Working to ensure the preliminary results and the potential positive reading up on the interaction of cell wall components, such as dyes and Ray Chart muram mountains were suggesting that, the mountains and the response may contribute to the discoloration of the dye-Ray charts. 그에 따라, 산-염기 반응이 관찰되어지는 색 변화에서 소정의 역할을 할 수 있다고 추측하였다. Thus, acid-it speculated that the change in color that is a base the reaction is observed to a certain role. 탈색된 레이차트 염료에 대한 강염기의 효과를 시험하기 위한 실험을 계획하였다. It was planning an experiment to test the effect of a strong base for the chart-ray dye bleaching. 레이차트 염료 (10 ml 아세토니트릴 중의 160 mg) 몇 방울을 피펫을 이용하여 스코트 (등록상표) A (160 mg in 10 ml of acetonitrile), a few drops of the dye-ray chart using a pipette, Scotts (R) 타월에 떨어뜨리고 건조하였다. Dried dropped the towel. 색 변화를 일으키는 것으로 알려진 두 화합물 (아세트산 및 알드리치 완충액 pH 2.0)을 각각 두 지점에 떨어뜨리면 염료의 신속한 탈색이 일어났다. Two compounds known to cause color changes (acetic acid and Aldrich buffer pH 2.0) is dropped in each two points occurred the rapid fading of the dye. 그 후 1 N NaOH 한 방울을 상기 각각의 지점들 중 한 지점에 떨어뜨렸더니, 신속한 색의 재발현을 유도하였다. Then 1 N NaOH to drop a droplet on a point of the point of the respective ryeotdeoni, to induce re-expression of the rapid color. 1 N NaOH를 첨가한 후 레이차트 염료의 청색/보라색이 돌아왔다. After the addition of 1 N NaOH, the blue / violet ray chart of the dye back. 이러한 결과를 보강하기 위해 지시제 스프레이를 이용한 2차 실험을 수행하였다. The second experiment was performed using the indicator spray to reinforce these results. 오래된 생 닭즙을 용이하게 인식가능한 패턴으로 고온 플레이트 표면에 피펫으로 떨어뜨렸다. Easily he knocked down with a pipette to the hot plate surface in a recognizable pattern old Saint daljeup. 표면을 압지로 건조한 후 레이차트 염료 지시제 스프레이 (10 ml 아세토니트릴 중의 160 mg)를 분무하였더니, 닭즙과 동일한 패턴으로 염료의 탈색이 일어났다. After drying the surface with blotting paper ray chart indicating dye was made spraying a first spray (160 mg in 10 ml acetonitrile), the color fading of the dye took place in the same pattern and daljeup. 그 후에 1 N NaOH 한 방울을 이미 탈색이 일어난 영역에 떨어뜨렸더니, 작은 점으로 색이 재발현되었다. That is after 1 N NaOH ryeotdeoni dropped one drop of a region already fading occurs, a small color point was expressed material. 이러한 현상은 다른 영역에서도 반복되었다. This phenomenon was repeated in other areas. 1 N NaOH가 단지 세균에만 작용하고 염료에는 작용하지 않을 가능성을 시험하기 위해, 오래된 닭즙과 1몰 NaOH를 동일한 비율로 혼합한 후 30초간 정치하였다. 1 N NaOH was the only to act only on bacteria and test the possibility does not work, the dye for 30 seconds after mixing the old daljeup and 1 mole NaOH in the same ratio value. 그 후에 이 혼합물을 이용하여 또다른 동일한 (그러나 좀더 작은) 패턴을 형성하였다. After the mixture it was again form another identical (though smaller) pattern using. 이 용액 역시 레이차트 염료의 신속한 탈색을 일으키나, 색은 1 N NaOH를 첨가하면 다시 돌아왔다. Ileukina rapid discoloration of the solution, too ray chart dyes, color is the addition of 1 N NaOH was back again. 세균 기원의 질 감염의 높은 이환률을 고려하여, 건강한 질액 (낮은 pH, 세균 감염 없음), pH 양성/세균성 질염 (BV) 음성 질액 (세균 감염은 없으나 pH가 정상보다 높음), 및 pH 양성/BV 양성 질액 (pH가 정상보다 높고 세균 감염이 확인됨) 샘플에 대한 레이차트 염료-코팅된 스티커의 반응을 파악하기 위한 실험을 행하였다. Considering the high prevalence of vaginal infections of bacterial origin, healthy vaginal (low pH, bacteria, no infection), pH positive / bacterial vaginosis (BV) Voice vaginal (bacterial infection, but the pH is higher than normal), and pH positive / BV were subjected to experiments to determine the reaction of the coated sticky-positive vaginal fluid-ray chart for the dye (pH has confirmed the high bacterial infections than normal) samples. 2가지의 서로 다른 농도의 레이차트 염료 용액 (160 mg/10 mL 아세토니트릴, 80 mg/10 mL 아세토니트릴, 40 mg/10 mL 아세토니트릴, 20 mg/10 mL 아세토니트릴)을 스티커 시트에 브러쉬-코팅하였다. 2 ray chart dye solutions of different concentration of (160 mg / 10 mL acetonitrile, 80 mg / 10 mL acetonitrile, 40 mg / 10 mL acetonitrile, 20 mg / 10 mL acetonitrile), the brushes on the sticky sheet- It was coated. 각 농도의 스티커를 정상 질액, BV 양성/pH 양성 질액, 및 BV 음성/pH 양성 질액 샘플로 시험하였다. It was tested in the sticker of each concentration in normal vaginal fluid, BV positive / pH positive vaginal fluid, and BV negative / pH positive vaginal fluid samples. 정상 질액은, 아마도 락토바실러스와 낮은 pH의 조합으로 인해, 급격한 염료의 탈색을 가져왔다. Normal vaginal fluid, perhaps due to a combination of a Lactobacillus and a low pH, has brought a rapid fading of the dye. BV 양성/pH 양성 샘플은, 아마도 다수의 BV 세균의 존재로 인해, 그 다음으로 급격한 탈색을 보였다. BV positive / pH positive sample, possibly due to the presence of a large number of BV bacteria, showed a rapid fading to the next. BV 음성/pH 양성 샘플은, 아마도 정상 샘플보다 적은 양의 락토바실러스로 인해, 단지 약하게 염료가 탈색되었다. BV negative / pH positive sample, the dye was discolored, probably due to the small amount of Lactobacillus than normal samples, only weakly. 이 3가지 상태의 탈색은 용이하게 구별될 수 있었으며, 질 위생 분야에서 이 기술이 진단 능력이 있을 수 있음을 제시하였다. Discoloration of the three states were able to be easily distinguished, and suggests that this technique may have diagnostic capabilities in the field of sanitary quality. 건조된 표면에서 세균이 며칠 간은 아니지만, 몇 시간 동안은 생존할 수 있다는 것은 잘 알려져 있다. The fact that the bacteria in a few days the surface is dry, but can survive for several hours, is well known. 일반적인 표면 상의 세균 및 기타 미생물을 확인하고 소비자나 작업자에게 오염을 경고하는 능력은 세정 및 소독에 도움을 주고 감염이 확산되는 것을 최소화하는데 도움이 된다. Check the bacteria and other microbes on the surface, and the general ability to warn of pollution to the consumer or worker can help to minimize the infection spreading to assist in cleaning and disinfection. 도 10에 도시된 것처럼, 미생물 지시제 스프레이를 시험하기 위한 "실세계" 표면의 예로서 오래된 컴퓨터 키보드가 사용되었다 (10A). As shown in Figure 10, an old computer keyboard was used as an example of the "real world" surface to test the microbial indicator spray (10A). 이소프로판올에 레이차트 염료를 용해시키고 (10 ml 이소프로판올 중의 160 mg) 에어로졸-기반 분무 장치에 장착하였다. Dissolving a dye-ray chart of isopropanol and (160 mg in 10 ml of isopropanol), an aerosol-based spray device was mounted on. 이어서 지시제 용액을 키보드에 분무하였다 (10B). It was then sprayed with the solution indicated in the keyboard (10B). 레이차트 염료 지시제 용액을 키보드에 분무함으로써 특정 영역에서 염료의 탈색이 신속하게 일어났다 (10C). Ray chart dye indicated by spraying the solution on the keyboard happened to the bleaching of dyes in certain areas quickly (10C). 단지 특정 키나 영역만이 오염을 나타낸다는 것이 흥미로웠는데, 이는 숫자 판처럼 많이 오염된 키를 특별히 확인할 수 있도록 하였다. It just was interesting that only certain key areas represents the contamination, which was to confirm a lot of the pollution as the key number plate in particular. 키보드는 매우 자주 사용되나, 거의 세정하지 않기 때문에, 이 표면을 통해 실세계 표면들의 미생물 수준을 짐작할 수 있다. But because the keyboard is used very often, rarely cleaned, you can guess the real world, levels of microbial surface through the surface. 레이차트 염료 용액 (80 mg/10 mL 아세토니트릴)과 트윈 (등록상표) 80 (200 ㎕) 폴리옥시에틸렌 계면활성제 (미국 펜실바니아주 피츠버그 소재의 피셔 사이언티픽)를 제조하였다. Ray to prepare a chart dye solution (80 mg / 10 mL acetonitrile) and Tween (R) 80 (200 ㎕) polyoxyethylene surfactant (Fisher Scientific, Pittsburgh, PA American). 이어서 이 용액을 사용하여 세라믹 표면을 코팅하였고 (도 11) 통풍 건조하였다. Then the solution was used to coat a ceramic surface (Figure 11) were blow-dried. 계면활성제가 없는 제2 레이차트 염료 용액 (80 mg/10 mL 아세토니트릴)을 표면에 묻히고 또한 통풍 건조하였다 (11A). Surface active agent and a second ray chart dye solution (80 mg / 10 mL acetonitrile) was also not to be buried in the surface drying ventilation (11A). 건조 후 높은 세균 수를 갖고 있는 것으로 알려진 오래된 닭즙 한 방울을 각각의 코팅 영역에 떨어뜨렸다 (11B). Dropped one drop old daljeup known to be dried has a high number of bacteria in each region of the coating (11B). 트윈 (등록상표) Twin (TM) 80 계면활성제를 함유하는 영역 (11C)은, 트윈 (등록상표) Region (11C) containing 80 surfactant, Tween (registered trademark) 계면활성제를 함유하지 않는 영역 (11D)과 비교하였을 때 훨씬 빠른 속도 (> 20 내지 30초)로 탈색되었다. When compared with that do not contain a surfactant region (11D) was discolored at a much faster rate (> 20 to 30 seconds). 게다가, 트윈 (등록상표) 계면활성제를 첨가함으로써 표면에서 염료를 제거하기가 용이해졌다. 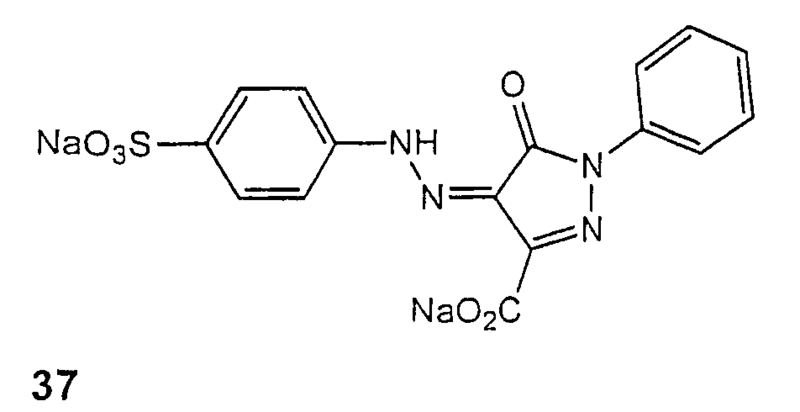 In addition, twin (R) has become an easy to remove the dye from the surface by the addition of a surface active agent. 소량의 물을 첨가하여도 표면으로부터 완전히 제거할 수 있지만, 계면활성제를 함유하지 않는 지점에 물을 첨가하는 것은 표면으로부터 제거의 용이함을 향상시키지 않았다. Can be completely removed from the surface by a small amount of water was added, but the addition of water in the branch which does not contain the surfactant did not improve ease of removal from the surface. 여러 다른 용매를 사용하여 제조된 레이차트 염료 코팅물의 거동을 평가하였다. Was evaluated for the ray chart dye coating behavior prepared using various other solvents. 아세토니트릴, 이소프로판올 및 크실렌 중의 레이차트 염료 용액을 제조한 뒤 용액들을 사용하여 스코트 (등록상표) 주방용 롤 타월을 코팅한 후 통풍 건조하였다 (도 12A 및 12D). Acetonitrile, using after producing a vector chart dye solution in isopropanol and xylene solution SCOTT (R) kitchen roll towels were then coated with a blow-dried (Fig. 12A and 12D). 처리된 타월에 100 ㎕ 분량의 S. 아우레우스를 묻힌 후 (12B, 12E), 코팅물의 색 변화를 관찰하였다. Then moistened with 100 ㎕ amount of S. aureus to the treated towel (12B, 12E), the coating was observed to change color of the water. 세균 현탁액을 묻힌 곳에서, 아세토니트릴 용액-기재 코팅물 만이 신속한 탈색을 보였다 (12C). Where the bacterial suspension is buried, an acetonitrile solution-based coatings, only showed a rapid discoloration (12C). 레이차트 염료는 아세토니트릴에 용해되었을 때 일정한 색을 나타내는 것으로 관찰되었다. Ray chart dyes have been observed to exhibit a predetermined color when dissolved in acetonitrile. 나머지 두 용매의 코팅물에서는 가시적인 색 변화가 관찰되지 않았다 (12F). The coatings of the other two solvents a visible color change was observed (12F). 본 발명자들은 염료의 용매로서 이소프로판올을 사용할 수 있도록 레이차트 염료의 농도를 조절할 수 있음을 발견하였다. The inventors have found that to control the concentration of the dye-ray chart for use of isopropanol as a solvent of the dye. 아세토니트릴에 비하여 염료의 색이 덜 강하지만, 미생물의 오염에 반응하는 탈색이 즉시 그리고 용이하게 관찰되었다. Only the color of the dye is less strong than in acetonitrile, the color of the reaction to the contamination of the microorganism was observed immediately and easily. 폴리스티렌 접시에 신선한 닭 (슈퍼마켓으로부터 구입)의 절반을 투명 필름으로 덮은 상태로 상온에서 3주 동안 보관하였다. The state covered half of the (purchased from the supermarket) Fresh chicken on a polystyrene plate with a transparent film was stored at room temperature for 3 weeks. 폴리스티렌 접시에서 수집된 담황색 즙을 피펫을 이용하여 채취한 후 시험을 위해 사용하였다. After collecting the pale yellow juice collected in a polystyrene plate using a pipette it was used for testing. 47 mg의 1-도코실-4-(4-히드록시스티릴)-피리디늄 브로마이드 (알드리치 케미컬)를 10 g의 디메틸포름아미드와 혼합하였다. 47 mg of 1- docosyl-4- (4-hydroxy styryl) pyridinium bromide (Aldrich Chemical Co.) was mixed with dimethylformamide of 10 g. 진탕하고 정치하면 소량의 고체가 남는다. If you shake the political left and a small amount of solid. 오렌지색 상층액을 평량 (29.2 cm x 20.3 cm = 6.888 g)의 면직물 위에 떨어뜨려 오렌지색-황색의 원을 형성하였다. The basis weight of an orange supernatant was dropped on the cotton fabric (29.2 cm x 20.3 cm = 6.888 g) an orange-yellow to form a circle. 1 N의 수산화나트륨 용액 한 방울을 면직물 위의 오렌지색-황색 지점에 첨가하면 오렌지색-황색에서 분홍빛 오렌지색으로 색이 변화하였다. The addition of the yellow spot orange - a sodium hydroxide solution of 1 N drops orange cotton above the color was changed from yellow to a pinkish orange. 오래된 닭즙을 면직물 상의 오렌지색-황색 지점에 떨어뜨리면, 매우 옅은 황색으로 색 변화가 일어났다. Daljeup on old orange cotton - dropped points in amber, the color change took place in a very pale yellow. 면직물에서 색 변화는 신속하였다. Color changes in the cotton was quick. 이와 유사하게, 오래된 닭즙을 면직물의 분홍빛 오렌지색 영역 (염료 + NaOH 용액)에 떨어뜨리면, 분홍빛 오렌지색에서 매우 옅은 황색으로 유사한 색 변화가 일어났다. Similarly, if it is dropped the old daljeup a pinkish orange region (dye + NaOH solution) of cotton, occurred a similar color change to very pale yellow in pinkish orange. 여성의 소변을 수집한 후 상온의 유리 용기에서 8일간 보관하였다. After collecting the urine of women was eight days kept in a glass container at room temperature. 상기 기재된 바와 같이 하기 구조의 N-메틸 메로시아닌 염료를 합성하였다. 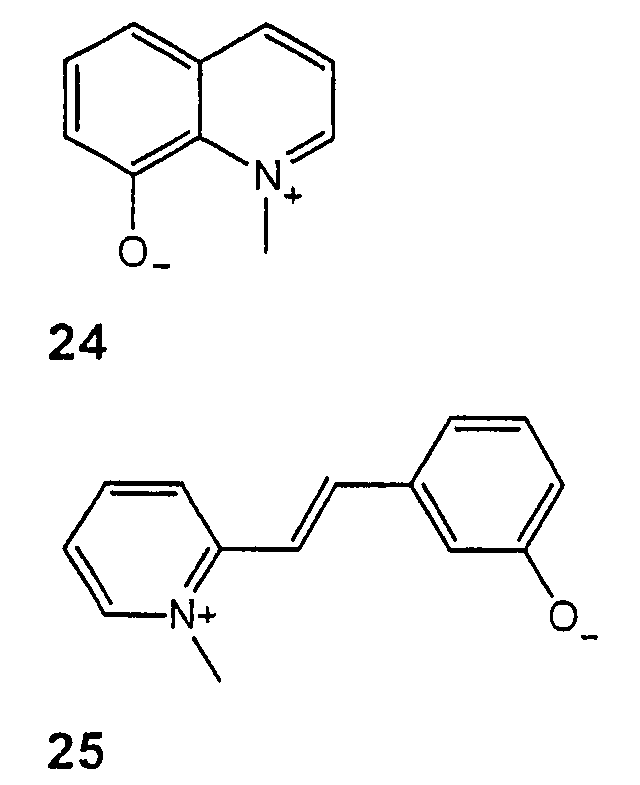 Described above other than the dye when N- methyl booties of the following structures were synthesized as described. 0.5 g을 20 ml 탈이온수에 용해시키고, 타월을 용액에 침지시키고, 과량을 방울방울 떨어뜨린 다음 코팅된 타월을 주변 조건에서 건조시킴으로써 스코트 (등록상표) 주방용 롤 종이 타월에 코팅하였다. 0.5 g was dissolved in 20 ml of deionized water, it was immersed in the towel the solution and coating and then the coated towel dropped excess dropwise to SCOTT (R) kitchen roll paper towel by drying at ambient conditions. 종이 타월은 염료에 의해 진한 오렌지색으로 염색되었다. Paper towels were stained dark orange by the dye. 오래된 소변을 오렌지색으로 착색된 타월에 떨어뜨리면 진한 오렌지 색에서 담황색으로 즉각적인 색 변화가 일어났다. Dropping the towel stained with old urine orange immediate color change from pale yellow to deep orange rose. 대조군으로서, 오래된 소변을 0.2 마이크로미터 필터를 통해 여과하여 세균 및 기타 미생물을 제거하였다. As a control, the old urine to remove bacteria and other microorganisms by filtration through a 0.2 micrometer filter. 여과 후에, 오래된 소변은 타월 위에 떨어뜨렸을 때 색 변화를 일으키지 않았으며, 이는 미생물이 색 변화를 일으키는 원인이 되는 반면 오래된 소변 내의 다른 성분은 그렇지 않다는 것을 시사한다. After filtration was old urine did not cause a change in color when dropped onto a towel, suggesting that microorganisms of different components in the urine, while the old, causing a color change otherwise. 여성의 소변을 수집하고 37℃에서 24시간 동안 보관하였다. Collect the urine of women, and was stored at 37 ℃ for 24 hours. 풀링 여성 소변은 이러한 조건 하에서 보관한 후에 대략 1×10 5 CFU/ml의 세균 수를 갖는 것으로 예상될 수 있다. Pooled female urine may be expected to have approximately 1 × 10 5 CFU / ml of the bacteria after storage under such conditions. 하기 화학식 33의 N-메틸 메로시아닌 염료를 상기 기재된 바와 같이 합성하였다. And the product was synthesized as described above when the dye is not N- methyl booties of formula 33. 0.5 g을 20 ml 탈이온수에 용해시키고 타월을 용액에 침지시키고, 과량을 방울방울 떨어뜨린 다음 코팅된 타월을 주변 조건에서 건조시킴으로서 스코트 (등록상표) 주방용 롤 종이 타월에 코팅하였다. 0.5 g to 20 ml is dissolved in deionized water, it was immersed in the towel the solution was coated and then the coated towel dropped excess dropwise to dry sikimeuroseo SCOTT (R) kitchen roll paper towel at ambient conditions. 종이 타월은 염료에 의해 진한 오렌지색으로 염색되었다. Paper towels were stained dark orange by the dye. 오래된 소변을 오렌지색으로 착색된 타월 위에 떨어뜨리면 진한 오렌지색에서 담황색으로 즉각적인 색 변화가 일어났다. Dropping onto a colored towels with old urine is pale yellow to orange happened to immediate color change from dark orange. 대조군으로서, 오래된 소변을 0.2 마이크로미터 필터를 통해 여과하여 세균 및 기타 미생물을 제거하였다. As a control, the old urine to remove bacteria and other microorganisms by filtration through a 0.2 micrometer filter. 여과 후에, 오래된 소변은 타월 위에 떨어뜨렸을 때 색 변화를 일으키지 않았으며, 이는 미생물이 색 변화를 일으키는 원인이 되는 반면 오래된 소변 내의 다른 성분은 그렇지 않다는 것을 시사한다. After filtration was old urine did not cause a change in color when dropped onto a towel, suggesting that microorganisms of different components in the urine, while the old, causing a color change otherwise. 새장의 애완용 잉꼬로부터 잉꼬 배설물을 수집하고 약 10 ml의 아틀란타시 가정용 수돗물 중에서 진탕하였다. Collect droppings from a pet parakeet parakeet's cage and was shaken from Atlanta household tap water of about 10 ml. 상기 화학식 33의 N-메틸 메로시아닌 염료를 상기 기재된 바와 같이 합성하였다. When the dye is not N- methyl booties of Formula 33 was synthesized as described above. 0.5 g을 20 ml 탈이온수에 용해시키고 타월을 용액에 침지시키고, 과량을 방울방울 떨어뜨린 다음 코팅된 타월을 주변 조건에서 건조시킴으로써 스코트 (등록상표) 주방용 롤 종이 타월 상에 코팅하였다. 0.5 g was dissolved in the towel was immersed in solution, and then the coated towel dropped the excess droplets drop by drying at ambient conditions on a coating SCOTT (R) kitchen roll paper towel in 20 ml of deionized water. 종이 타월은 염료에 의해 진한 오렌지색으로 염색되었다 (도 13A). Paper towels were stained by dark orange dye (Fig. 13A). 수돗물 중의 잉꼬 배설물 현탁액의 방울을 코팅된 타월 위에 떨어뜨리면 (13B), 현탁액이 첨가된 곳에서 진한 오렌지색에서 담황색으로의 즉각적인 색 변화가 일어났다 (13C). Do not let the drops of parakeet feces suspension in tap water dropped onto the coated towel (13B), an immediate color change from dark orange to light yellow rose from where the suspension is added (13C). 대조군으로서, 아틀란타시 가정용 수돗물을 타월의 다른 영역에 떨어뜨리면, 물에 의해 색이 다소 옅어졌으나 상기 영역은 여전히 오렌지색이었다. Dropping in as a control, another area of ​​the towel Atlanta home tap water, jyeoteuna colors are somewhat faded by water the area was still orange. 히드록시프로필 메틸 셀룰로스 1 g, 화학식 33의 N-메틸 메로시아닌 0.5 g을, 양호하게 교반하면서, 물 10 g과 이소프로필 알콜 10 g의 혼합물에 용해시킬 수 있다. Hydroxypropylmethylcellulose 1 g, and 0.5 g of methyl N- not when booties of formula 33, preferably stirred, may be dissolved in a mixture of water with 10 g isopropyl alcohol 10 g. 상기 용액을 폴리에스테르 필름에 코팅하고 실온에서 건조시켜, 미생물의 존재를 검출할 수 있는 코팅된 가요성 필름을 생산할 수 있다. The solution was coated on a polyester film and dried at room temperature, it can produce a coated flexible film capable of detecting the presence of microorganisms. 에틸셀룰로스 1 g, 화학식 33의 N-메틸 메로시아닌 0.25 g을 테트라히드로푸란 20 g에 용해시킬 수 있다. The ethyl cellulose 1 g, 0.25 g and not when N- methyl booties of Formula 33 may be dissolved in tetrahydrofuran, 20 g. 상기 용액을 폴리에스테르 필름에 코팅하고, 실온에서 건조시켜 미생물의 존재를 검출할 수 있는 코팅된 가요성 필름을 생산할 수 있다. The solution was coated on a polyester film, and can produce a coated flexible film capable of detecting the presence of the microorganisms by drying at room temperature. 밀리포어 니트로셀룰로스 HF75 막 (미국 메사츄세츠주 빌레리카 소재의 밀리포어 코포레이션(Millipore Corporation))을 약 30 cm의 길이를 갖는 플라스틱 지지 카드 (밀리포어 코포레이션) 위에 적층하였다. Millipore nitrocellulose HF75 membrane (US Massachusetts Ville silica material Millipore Corporation (Millipore Corporation) of) the supporting plastic card having a length of about 30 cm (Millipore Corporation) was laminated on top. 검출 대역 및 대조 대역 양쪽에서, 이소프로판올 중의 5 중량％ 레이차트 염료 용액을 손으로 가늘고 길게 묻혔다. In both the detection zone and the control zone, buried thin and long to 5% by weight solution in isopropanol ray chart dye by hand. 막을 37.5℃ 온도의 실험실 오븐에서 1시간 동안 건조시켰다. Film was dried for 1 hour in a lab oven at 37.5 ℃ temperature. 막 카드를 오븐에서 꺼낸 후에, 셀룰로스 흡상 패드 (밀리포어 코포레이션으로부터 목록번호# CFSP203000)를 대조 대역에 근접한 막의 한쪽 말단에 부착하였다. After the film eject the card from the oven, cellulose wicking pad was attached to the film adjacent one end of the control band (ms list number # CFSP203000 from fore Corporation). 샘플 패드를 부착하기 위해 사용되는 카드의 나머지 말단을 잘라내었다. In order to attach the sample pad, it was cut out of the other end of the card to be used. 이어서 카드를 4 mm 스트립으로 얇게 잘라서 반쪽 스틱을 형성하였다. Followed by cutting the thin card to 4 mm strips to form half of the stick. 일단 반쪽 스틱이 제조되면, 세균 용액을 검출 막의 말단에 도포하였다. Once the half sticks are prepared, it was applied to the film end detecting the bacteria solution. 모세관 작용은 용액 및 세균을 검출 대역 내로 끌어당기고, 검출 대역에서 색 변화가 관찰되었다. Capillary action will pull the solution and bacteria into the detection zone, a color change was observed in the detection zone. 대조 라인 색이 시험하는 동안 계속 동일하게 유지되었다. It has continued to remain the same while the contrasting color lines tested. 먼저, 스코트 (등록상표) 종이 타월을 침지에 의해 수용액 (20 ml 중의 1 g)으로서 히드록시프로필-베타-시클로덱스트린 (미국 인디애나주 해몬드 소재의 세레스타 인터내셔널)으로 코팅하고 주변 온도에서 통풍 건조시켰다. First, Scott (R) hydroxypropyl A (1 g in 20 ml) the aqueous solution by a paper towel to the immersion-beta-cyclodextrin (celebrity star of Indiana, USA Hammond Material International) as was coated and blow-dried at ambient temperature . 건조될 때 코팅된 종이 타월을 이소프로판올 중의 레이차트 염료 용액 (1 중량％)으로 처리하고 통풍 건조시켰다. Treating the coating when dried with a paper towel ray chart dye solution (1% by weight) in isopropanol, and dried ventilation. 건조된 타월은 보라색/청색이었다. The dried towels were purple / blue. 이때, 시클로덱스트린은 염료의 결정화를 방해하여, 종이 타월 상에서 염료가 더욱 강한 색이 되도록 한다. In this case, the cyclodextrin is to hinder the crystallization of the dye, so that the dye is a stronger color on a paper towel. 이러한 코팅된 타월을 그람-음성 세균 (대장균)을 사용하는 시험에 사용하고, 10,000 CFU/ml를 함유하는 배지 100 마이크로리터 분량을 타월에 도포하면 5초 미만 내에 무색으로 변하는 것을 발견하였다. This coated towel Gram - when used in a test using negative bacteria (E. coli), and the medium containing 10,000 CFU / ml 100 microliter volume applied to the towel has been found that changes to colorless in less than 5 seconds. 이러한 탈색은 15초 정도로 오래 걸리긴 하지만 500 CFU/ml의 세균 농도까지는 발생하는 것으로 밝혀졌다. The discoloration has been found that long-consuming, but caused by bacterial concentration of 500 CFU / ml to about 15 seconds. 따라서 염료가 결정화되는 것을 방해함으로써, 염료가 단일 분자로서 기재 상에 존재하는 것으로 생각되며, 그에 따라 세균 수준에 대한 염료의 감도가 증가하였다. Therefore, by preventing that the dye is crystallized, and the dye is believed to exist on the substrate as a single molecule, the sensitivity of the dye to bacteria levels were increased accordingly. 본 발명자들은, 타월에 코팅물 (예를 들면, 시클로덱스트린)을 조심스럽게 사용함으로써 염료의 단일-분자 코팅이 기재의 표면 상에서 일어나고 최고 감도가 얻어질 것이라고 믿고 있다. The present inventors, the coating on a towel (for example, cyclodextrin) of the dye by using a carefully single-believe that taking place on the surface of the molecule coating the substrate highest sensitivity is obtained. 용액이 아니라 "건조" 세균 샘플을 사용하여, 레이차트 염료 코팅된 종이 타월의 시험을 수행하였다. This solution as the "dry" using a bacterial sample, were tested for ray chart dye coated paper towel. 일련의 성장 배지를 함유하는 한천 페트리 디쉬에서 수거한 대장균 세균 콜로니의 건조 샘플을 사용하였다. The dried sample of E. coli bacterial colonies collected from agar petri dish containing a series of growth medium was used. 이러한 건조 샘플을 미리 보습된 염료 코팅 스코트 (등록상표) 종이 타월에 문질렀다. The pre-dried sample dye Moisturizing These coatings Scott (registered trademark) was rubbed on paper towels. 콜로니가 위치하고 문질러진 영역은 1 내지 5초 내에 무색으로 변화하였다. Jean region colonies are located rubbing was changed to colorless within 1-5 seconds. 이것은 젖은 와이프 타월이 사용되는 방법과 유사하며 양호하게 수행되었다. This is similar to the method used in wet wipes and towels were well done. 레이차트 염료와 3,3',5,5'-테트라메틸벤지딘 (TMB)의 혼합물을 스코트 (등록상표) 종이 타월에 코팅하고 통풍 건조시켰다. A mixture of a dye and a ray chart of 3,3 ', 5,5'-tetramethylbenzidine (TMB) SCOTT (R) which was coated on a paper towel and dry airflow. 묽은 표백제 용액을 종이 타월에 도포하면, 레이차트 염료 탈색 및 오렌지색/황색으로의 TMB 변화가 일어났다. When applying a dilute bleach solution to the paper towels, ray chart dye decolorizing and the TMB change in the orange / yellow occurred. 이것은 표백제 지시제가 세균 지시 와이퍼로 만들어질 수 있음을 보여준다. This shows that bleach instructed me to be made of bacteria indicating wiper. 최종 시험에서, 레이차트 염료 및 TMB 화합물의 코팅물을 갖는 스코트 (등록상표) 종이 타월을 대장균 세균의 현탁액에 적가 방식으로 노출시켰다. In the final test, Scott-ray (registered trademark) having a coating of the dye and TMB chart compound exposed drop by drop a paper towel to a suspension of E. coli bacteria. 세균과 접촉되어진 타월 영역은 10초 미만 내에 백색 점으로 탈색되었다. Towel Area been in contact with the bacteria was decolorized with white point within less than 10 seconds. 오렌지색/황색이 나타나지 않는 것으로 관찰되었다. The orange / yellow was observed does not appear. 추가의 정제 없이 레이차트 염료를 사용하였다. It was used as a vector chart dyes without further purification. Nn-헥실 및 Nn-도데실 메로시아닌 염료를 기재된 바와 같이 합성하였다. The Nn- hexyl and dodecyl Nn- dyes other than during actual Mero was synthesized as described. 사용된 용매는 알드리치 케미컬로부터 입수하였으며 HPLC 등급이었다. The solvent used was obtained from Aldrich Chemical Co. was HPLC grade. 시마즈 UV-1601 UV-가시광선 분광광도계 (시마즈 코포레이션(Shimadzu Corporation))를 사용하여 400 내지 800 nm 범위에서 염료의 최장 파장 피크 흡수를 측정하였으며, 상기 염료는 석영 커벳에 함유된 3가지 서로 다른 용매에 용해되어 있다. Shimadzu UV-1601 UV- visible light spectrophotometer (manufactured by Shimadzu Corporation (Shimadzu Corporation)) was measured by the longest wavelength peak absorption of the dye at 400 to 800 nm range used, the dye three different solvent contained in the quartz curvet It is dissolved in. 하기 표는 좌측의 용매 및 상단의 염료를 사용한 시험 결과를 포함한다. The following table includes the test results with the dyes of the solvent of the left and top. 메로시아닌 염료는 더욱 긴 파장의 흡수 이외에도 400 nm 근처에서 흡수를 보였으며, 이는 감지되는 색을 변화시켰다. Merocyanine dyes besides absorbing in the longer wavelength showed an absorption at near 400 nm, which changed the color to be detected. 명백하게, 분광학법 측정을 기초로 하여, 이들 염료는 상이한 용매에 용해되었을 때 미생물 검출 염료 간의 최장 파장 피크 흡수가 큰 변위 (10 nm 초과)를 나타냈다. Obviously, on the basis of the spectroscopic measurement method, these dyes exhibited a large displacement longest wavelength peak absorption between microbial detection dyes when dissolved in different solvents (more than 10 nm). 본 발명에 따라 바이러스 존재를 검출하는 색소원의 능력이 설명되어 있다. There is a source of dye ability is described for detecting the presence of viruses in accordance with the present invention. 폴리오 바이러스 제1형, 헤르페스 심플렉스 바이러스 1 (HSV-1), 리노바이러스, 미즐즈, 백시니아 및 인플루엔자 A를 작제하고 증식된 MA-104 배아 원숭이 신장 세포에 접종하고, 둘베코 변형 이글 배지 (DMEM)를 공급하고 태아 송아지 혈청을 5％의 농도까지 보충하고 5％ CO 2 의 존재하에 6일 동안 37±1℃에서 인큐베이션하였다. Polio virus type 1, herpes simplex virus 1 (HSV-1), rhinovirus, US RazzIes, vaccinia and constructing influenza A and inoculated in the growth MA-104 embryonic monkey kidney cells, and Dulbecco's modified Eagle's medium ( DMEM) were supplied, and the fetal calf serum supplement to a concentration of 5% and incubated at 37 ± 1 ℃ for 6 days in the presence of 5% CO 2. 감염된 세포 시트를 현미경 관찰함으로써 바이러스 증식을 세포 시트의 적어도 50％에서 관찰되는, 세포 붕괴 (세포변성 효과, CPE), 예컨대 원형화, 무딘톱날모양, 세포용해, 핵농축 등으로 검출하였다. By observing the infected cell sheet was microscope detects a virus grown in cell disruption, observed in at least 50% of the cell sheet (cytopathic effect, CPE), e.g., prototyping, dull blade shape, cell lysis, nuclear enrichment or the like. 바이러스 없이 시약 단독에 의해 초래된 세포 붕괴의 정도로서 세포독성을 측정하였다. The degree of cytotoxicity caused by the collapse of the cells was measured reagent alone without the virus. DMEM 중의 10-배 연속 희석액을 사용하여 바이러스를 적정하고, 희석액마다 MA 104 배양액을 4개 복제하고, 각각의 복제물에 0.1 ml의 바이러스 희석액을 접종하였다. Using a 10-fold serial dilutions in DMEM titration of the virus and, four for each dilution culture MA 104 clone, which was then inoculated with the virus dilutions of 0.1 ml in each replica. 바이러스 복제 정도를 리드(Reed) 및 멘치(Muench)의 방법에 의해 결정되는 조직 배양액 감염 투여량-50％ (TCID 50)으로서 계산하였다. Virus replication was calculated as the degree of lead (Reed) and menchi method tissue culture infection dose of -50% (TCID 50) as determined by the (Muench). 레이차트 염료-코팅된 스티커 (160 mg/10 mL 아세토니트릴, 80 mg/10 mL 아세토니트릴, 40 mg/10 mL 아세토니트릴 및 20 mg/10 mL 아세토니트릴)를 시험 표면으로서 사용하였다. Ray chart dye-coated stickers (160 mg / 10 mL acetonitrile, 80 mg / 10 mL acetonitrile, 40 mg / 10 mL acetonitrile, and 20 mg / 10 mL acetonitrile) was used as a test surface. 배지 중 50 ㎕의 희석되지 않은 바이러스 (TCID 50 10 -8 폴리오 바이러스/mL; TCID 50 10 -7 HSV-1/mL; TCID 50 10 -7 리노바이러스/mL; TCID 50 10 -6 미즐즈 바이러스/mL; TCID 50 10 -6 백시니아/mL; 및 TCID 50 10 -7 인플루엔자/mL)를 각각의 스티커에 떨어뜨리고, 3분 동안 둔 후에 면봉으로 방울을 제거하였다. Undiluted virus in 50 ㎕ the medium (TCID 50 10 -8 poliovirus / mL; TCID 50 10 -7 HSV -1 / mL; TCID 50 10 -7 rhinovirus / mL; TCID 50 10 -6 US RazzIes virus / mL; TCID 50 vaccinia 10 -6 / mL; and dropped TCID 50 influenza 10-7 / mL) on each of the stickers, with a cotton swab to remove the bubbles after placed for 3 minutes. 배지 및 염수로 희석된 리노바이러스 및 폴리오 바이러스에 있어서는, 배지 단독, 바이러스-무함유 세포 배양 배지 및 바이러스-무함유 세포 배양 염수의 분취물을 대조 샘플로서 사용하고 이들 또한 면봉으로 채집(swabbing)하기 전에 3분 동안 놓아두었다. To-free cells collected (swabbing) with separated water is used as the control sample, and these also swab culture brine-Reno in the virus and polio virus, medium alone, virus diluted with media and saline--free cell culture medium, and virus It was placed for three minutes ago. 나머지 바이러스 (그들의 원래 배양 배지에서 희석되지 않은 상태로 사용됨)는 배지 대조군만이 사용되었다. The remaining virus (used as undiluted state from their original culture medium) is only a medium control was used. 폴리오 바이러스에 있어서, 염수 대조군은 염료가 간섭받는 것으로 나타난 반면, 배지는 색 변화가 일어나지 않았다. In poliovirus, saline control group is shown to be receiving while the dye is interference, the medium is a color change did not occur. 따라서, 나머지 실험을 위하여 배지 중의 폴리오 바이러스의 희석액을 사용하였다. Therefore, the dilution of polio virus in the medium was used for the remaining experiments. 바이러스를 10-배 증분으로 배지에서 연속적으로 희석하고, 각각의 스티커에 50 ㎕ 분량을 도포하였다. Diluting the virus in a row in a culture medium to 10-fold increments, and the mixture was applied to a 50 ㎕ amount to each sticker. 3분 동안 둔 후에, 방울을 스티커로부터 면봉으로 채집하였다. Once placed for 3 minutes, followed by collecting a swab from the sticky droplets. 리노바이러스에 있어서, 배지 대조군은 간섭이 나타난 반면, 염수 대조군은 염료의 색 변화를 유도하지 않았다. In the rhinovirus, while the medium control group was indicated interference, saline control group did not induce a change in color of the dye. 따라서, 염수 중에서 희석된 바이러스의 10-배 연속 희석액을 50 ㎕ 분량으로 스티커에 도포하고 3분 후에 면봉으로 채집하였다. Therefore, applying a 10-fold serial dilutions of the virus diluted in saline on the sticker 50 ㎕ amount, which was collected with a cotton swab after three minutes. 폴리오 바이러스 및 리노바이러스에 있어서, 스티커는 10 -6 (10-배 연속 희석액에서 여섯번째)까지는 색이 변하였으며, 이는 염료-코팅된 스티커가 이들 바이러스의 검출에 대한 감도를 가지고 있음을 나타낸다 (폴리오 바이러스의 경우에 약간 더 강하게 탈색됨). Folio according to virus and rhinovirus, a sticker 10-6 (sixth in a 10-fold serial dilution) until the color was changed, that the dye-coated stickers have shown that this is the sensitivity for the detection of these viruses (Polio being slightly stronger discoloration in the case of viruses). HSV-1, 인플루엔자 A, 미즐즈 및 백시니아는, 단지 (희석되지 않은) 바이러스의 50 ㎕ 방울을 스티커에 묻혔다. HSV-1, influenza A, US RazzIes and back shinny know, just buried a drop of 50 ㎕ (undiluted) virus on a sticker. 관찰된 후속 탈색을 바이러스-무함유 대조 배지에서 관찰된 탈색 및 살모넬라 (10 8 CFU/mL) 양성 대조군과 비교하였다. The observed subsequent bleaching virus were compared to the contrast-free positive control decolorized and Salmonella (10 8 CFU / mL) observed in the medium. 탈색이 살모넬라 세균에서 관찰된 것만큼 강하지는 않았지만, 희석되지 않은 HSV-1 바이러스에의 노출은 리노바이러스 및 폴리오 바이러스에서 관찰된 것보다 더욱 강한 스티커 탈색을 유도하였다. The discoloration of the exposed just as strong, the undiluted HSV-1 virus did not observed in the Salmonella bacteria to induce stronger discoloration sticky than that observed in rhinovirus and poliovirus. 인플루엔자 A, 백시니아 및 미즐즈 바이러스에 반응한 탈색은 다른 바이러스로 관찰된 것보다 덜 강하였다. Influenza A, vaccinia and a bleaching reaction on the non-river RazzIes virus was less than that observed with other viruses. 또한 레이차트 염료의 2가지 용액 (400 ㎕의 트윈 80 계면활성제를 함유하거나 함유하지 않은 80 mg/10 mL 아세토니트릴)을 제조하였다. Additionally prepare a solution of the two kinds of ray chart dye (400 ㎕ of Tween 80 surfactant-containing, or 80 mg / 10 mL acetonitrile containing no). 폴리오 바이러스 또는 리노바이러스 (양쪽 모두 배지에서 희석되지 않음)의 100 ㎕ 방울을 접힌 스코트 (등록상표) 종이 타월에 피펫으로 떨어뜨리고, 각각의 바이러스-함유 지점에 레이차트 염료 방울을 첨가하였다. Poliovirus or a folded Scott 100 ㎕ drop in rhinovirus (not both undiluted in media) (R) dropped with a pipette on a paper towel, each of the viruses were added to the dye-ray chart droplets containing the point. 계면활성제-함유 및 계면활성제-무함유 용액 양쪽 모두에서 색이 신속히 탈색되었다. Surfactant-containing and surfactant-free solution was quickly color fading in both. 색이 일정해질 때까지 염료를 첨가하였다 (대략 9 방울). The dye was added until the color is constant (approximately 9 drops). 앞서 언급된 것과 동일한 배지 및 염수 대조군 또한 시험하였다. A control the same media and saline as the one mentioned above was also tested. 배지가 염료 탈색능을 약간 나타내었으나, 염수는 앞서 물을 사용하여 관찰된 것과 동일한 적정 거동을 나타내었다. Eoteuna medium is slightly exhibited dye bleaching ability, salt exhibited the same titration behavior as that observed before the use of water. 세균 농도에 관한 반-정량적 정보를 제공하는 레이차트 염료의 능력이 설명되어 있다. Half of the bacterial concentration-ray chart of the power dye to provide a quantitative information is described. 종이-기원 기재 (니나 본드(Neenah Bond); 상표명) (미국 조지아주 알파레타 소재의 니나 페이퍼, 인크. (Neenah Paper, Inc.)로부터 입수가능함)를, 종이를 코팅물에 침지하거나 종이에 브러쉬-코팅한 후에, 종이를 걸어 건조시킴으로써 레이차트 염료 용액 (80 mg/아세토니트릴 10 ml)으로 초기에 처리하였다. Paper-based origins (Nina Bond (Neenah Bond); TM) (Nina Paper, Inc. of Alpharetta, Georgia, USA Material (Neenah Paper, Inc.) obtained from possible) to immersion in water, coated paper, or brush on paper - after coating, it was treated initially with ray chart dye solution (80 mg / acetonitrile 10 ml) by walking drying the paper. 기지 농도의 S. 아우레우스 (ml당 10 1 , 10 2 , 10 3 , 10 4 , 10 5 , 10 6 및 10 7 CFU) 7 방울을 각 시트의 상단에 떨어뜨렸다. Aureus of known concentration S. (10 1, 10 per ml 2, 10 3, 10 4 , 10 5, 10 6 and 10 7 CFU) was dropped to 7 drops at the top of each sheet. 대략 2분 후에, 방울을 제거하고 압지로 닦아내면, 10 5 CFU/mL 이상의 S. 아우레우스 농도에서 분명한 색 변화가 나타났다. About 2 minutes later, the inner surface to remove the droplets and wiped with blotting paper, 10 5 CFU / mL showed a clear color change in at least S. aureus concentration. 보다 낮은 농도에서는 색차가 덜 분명하고, 특히 브러쉬-코팅된 시트의 경우에 그렇다. In lower concentrations the color difference is less clear, particularly brush-so in the case of coated sheet. 이어서 맹검 검사를 실시하였다. It was then subjected to blind test. 시험 목적으로, 10 6 CFU/mL 농도로 100 ㎕를 함유하는 첫번째 방울을 레이차트 염료를 함유하는 침지-코팅된 시트의 일부에 떨어뜨렸다. For testing purposes, 10 6 immersion containing the first ray chart drops dyes containing 100 ㎕ in CFU / mL concentration-dropped to a portion of the coated sheet. 10 5 CFU/mL 농도로 100 ㎕를 함유하는 두번째 방울을 레이차트 염료를 함유하는 브러쉬-코팅된 시트의 일부에 떨어뜨렸다. 10 5 CFU / mL brush containing the second ray chart drops dyes containing 100 ㎕ a concentration-dropped to a portion of the coated sheet. 최종적으로, 10 4 CFU/mL 농도로 S. 아우레우스를 함유하는 세번째 방울을 레이차트 염료를 함유하는 침지-코팅된 시트의 일부에 떨어뜨렸다. Finally, 10 4 CFU / mL concentration in the immersion containing the dye-ray chart of the third drop containing S. aureus-dropped to a portion of the coated sheet. 이들 세 방울의 농도를 실험 참가자 중 두명에게는 알려주지 않았다. The concentration of these three drops did not give two of those participants. 대략 2분 후에, 방울을 제거하고 압지로 닦아냈다. About 2 minutes later, he found remove droplets and wiped with blotting paper. 대조 영역을 사용하여, 각 샘플의 농도를 이들 두 사람이 각각 시각적으로 추정하였다. Using a contrast area, the concentration of each sample of these two people were each visually estimated. 두 사람 모두 첫번째 샘플의 농도를 10 6 CFU/mL로 정확하게 추정하였다. The concentration of the both of them first sample 10 6 was accurately estimated by CFU / mL. 이들은 또한 두번째 샘플에 대해서도 10 5 CFU/mL의 농도로 정확하게 추측하였다. It also speculated correctly with 10 5 CFU / mL concentration of about the second sample. 그러나, 이들은 세번째 샘플을 10 3 CFU/mL로 잘못 추정하였다. However, it was incorrectly assumed to 10 3 CFU / mL for the third sample. 이러한 부정확성은 적어도 부분적으로, 10 5 CFU/mL 미만의 농도에서는 대조 영역의 색이 비교적 덜 차이나기 때문인 것으로 생각된다. This inaccuracy is thought to be due at least in part, in a concentration of less than 10 5 CFU / mL smoking, the color of the contrasting areas relatively less difference. 그러나, 본 발명자들은 색소원의 농도 및 코팅물의 균일성을 이러한 낮은 농도에서 정확한 결과를 얻을 수 있도록 용이하게 선택할 수 있을 것이라고 믿고 있다. However, the present inventors believe would be able to readily select to get the correct result the concentration and the coating uniformity of a dye-circle in such a low concentration. 어떠한 경우에도, 대조 영역이 보다 높은 농도 (예를 들면, 10 5 CFU/mL 이상)에서 보다 뚜렷한 색차를 제공하기 때문에, 임상적으로 보다 관련있는 높은 농도에서는 정확한 결과가 달성된다고 생각된다. In any case, the contrast area higher concentrations as it provides a more distinct color difference in (for example, 10 5 CFU / mL or more), the high concentration in the relevant than clinically is considered to achieve the correct result. 세균 농도에 관한 정량적 정보를 제공하는 레이차트 염료의 능력이 설명되어 있다. The ability of the dye-ray chart to provide a quantitative information about the concentration of bacteria is described. 종이-기원 기재 (니나 본드; 상표명) (미국 조지아주 알파레타 소재의 니나 페이퍼 인크.로부터 입수가능함) 및 라벨 (애버리-데니슨으로부터 입수가능함)을 레이차트 염료 용액 (80 mg/아세토니트릴 10 ml)으로 초기에 코팅하고 걸어 건조하였다. Paper-origin base (Nina bond; trade name) (available from Nina Paper Inc. of Georgia, USA Alpharetta material) and labeling (Avery-available available from Dennison) the ray chart dye solution (80 mg / acetonitrile 10 ml) the coating was dried initially and walking. 기지 농도의 S. 아우레우스, P. 애루기노사 및 대장균의 분취물 (100 마이크로리터)을 사용하여 각 종류의 세균에 대하여 대조 곡선을 그렸다. Using the aliquot (100 microliters) of a known concentration of S. aureus, P. Ke rugi labor and E. coli to drew a contrast curve for each type of bacteria. 보다 구체적으로, 레이차트 염료로 코팅된 지시제 스트립을 세균 분취량을 감소시키면서 노출시켰다. More specifically, the ray was exposed to the indicator strip chart coated with dye reducing bacteria aliquots. 각 분취물의 도포 후에 소형 분광광도계를 사용하여 각 CFU/mL 농도에 대해 "델타 E" 값 (L * , a * 및 b * 값을 사용하여 계산함)을 측정하였다. The "Delta E" value (L *, a * and b * by using the value calculation) for each CFU / mL concentration using a spectrophotometer after each small aliquot of water applied was measured. 결과를 하기 표 4 (종이) 및 표 5 (라벨)에 기재하였다. The results are shown in Table 4 (paper) and Table 5 (label). 상기로부터, S. 아우레우스, P. 애루기노사 및 대장균 각각에 대하여 표준 검출 곡선을 도 5 내지 7에 도시한 바와 같이 그렸다. From the, S. aureus, P. Ke rugi painted as shown in Figures 5 to 7, the standard curve is detected with respect to labor and E. coli respectively. 도시된 바와 같이, 각 종류의 세균은 염료 처리된 기재의 색을 약간 상이한 방식으로 변화시켜, 독특한 표준 곡선을 만들었다. , Bacteria of each type as shown by changing the color of the dye-treated substrate in a slightly different way, created a unique standard curve. 그 후에, 미지의 세균 농도의 방울을 스티커에 떨어뜨리고 분광광도계를 사용하여 나타난 색의 "델타 E"를 측정하였다. Thereafter, it was measured for dropping a drop of the bacterial concentration of the unknown on the sticker shown using a spectrophotometer color "Delta E". 각 미지 샘플로 얻어진 수치를 하기 표 6 및 표 7에 기재하였다. To the value obtained in each unknown sample are shown in Table 6 and Table 7. 수치 데이터로부터 알 수 있는 것처럼, 미지 농도의 델타 E 값이 어느 기지의 델타 E 값에 근사한지를 판단함으로써 미지 농도가 예상되었다. As can be seen from the numerical data, by determining whether the delta E value for the unknown concentration approximate the value of delta E any base was expected that the unknown concentration. 몇몇 결과는 완전히 정확하지는 않았지만, 본 발명자들은 코팅물의 균일성을 개선하는 것이 검출 정확성을 더욱 향상시킨다고 믿고 있다. Some results although not entirely accurate, the inventors believe sikindago to further improve the detection accuracy to improve the coating uniformity. 비교예를 위해 세균 공급원으로서 오래된 닭을 사용하였다. Comparative Example As a source of bacteria was used for the old chickens. 폴리스티렌 접시에 신선한 닭 (슈퍼마켓으로부터 구입)의 절반을 투명 필름으로 덮은 상태로 상온에서 3주 동안 보관하였다. The state covered half of the (purchased from the supermarket) Fresh chicken on a polystyrene plate with a transparent film was stored at room temperature for 3 weeks. 폴리스티렌 접시에서 수집한 담황색 즙을 피펫을 이용하여 채취하여, 시험에 사용하였다. Collected a pale yellow juice collected in a polystyrene plate using a pipette was used for the test. 오래된 닭즙을 스코트 (등록상표) 종이 타월 위에 방울로 떨어뜨렸다. He dropped the towel drops over old daljeup to Scott (TM) paper. 하기 화학식 34의 Cl 산 그린 41 (알드리치 케미컬) 용액 (0.008 몰/l) (히드록시안트라퀴논 염료의 예)을 오래된 닭즙에 방울로 떨어뜨렸다. Dropped to the mountain 41 Cl (Aldrich Chemical Co.) was painted in the formula (34) (0.008 mol / l) (example of the hydroxy anthraquinone dye) to drop the old daljeup. 색 변화가 관찰되지 않았다. The color change was observed. 대조군으로서, 100 mg의 레이차트 염료를 10 ml 아세토니트릴에 현탁시켰다. As a control, it was suspended in a dye-ray chart of 100 mg in 10 ml of acetonitrile. 이 현탁액을 오래된 닭즙에 방울로 떨어뜨리면 즉시 탈색되었다. Dropping the suspension to drop the old daljeup was fading away. 오래된 닭즙을 스코트 (등록상표) 종이 타월 위에 방울로 떨어뜨렸다. He dropped the towel drops over old daljeup to Scott (TM) paper. 하기 화학식 35의 Cl 산 그린 25 용액 (0.008 몰/l) (안트라퀴논 염료의 예)을 오래된 닭즙에 방울로 떨어뜨렸다. It dropped to a 25 solution of the formula Cl acid green 35 (0.008 mol / l) (for example, the anthraquinone dye) to drop the old daljeup. 색 변화가 관찰되지 않았다. The color change was observed. 대조군으로서, 100 mg의 레이차트 염료를 10 ml 아세토니트릴에 현탁시켰다. As a control, it was suspended in a dye-ray chart of 100 mg in 10 ml of acetonitrile. 이 현탁액을 오래된 닭즙에 방울로 떨어뜨리면 즉시 탈색되었다. Dropping the suspension to drop the old daljeup was fading away. 오래된 닭즙을 스코트 (등록상표) 종이 타월 위에 방울로 떨어뜨렸다. He dropped the towel drops over old daljeup to Scott (TM) paper. 하기 화학식 36의 Cl 산 레드 37 (알드리치 케미컬) 50 mg (아미노아조 염료의 예)을 10 ml 탈이온수에 용해시켰다. The following (for example, the amino azo dye) Cl acid Red 37 (Aldrich Chemical Co.) 50 mg of the formula 36 was dissolved in 10 ml of deionized water. 이 염료 용액을 종이 타월 위의 오래된 닭즙에 방울로 떨어뜨렸다. This dye solution was dropped to the drop of the old daljeup on paper towels. 색 변화가 관찰되지 않았다. The color change was observed. 대조군으로서, 100 mg의 레이차트 염료를 10 ml 아세토니트릴에 현탁시켰다. As a control, it was suspended in a dye-ray chart of 100 mg in 10 ml of acetonitrile. 이 현탁액을 오래된 닭즙에 방울로 떨어뜨리면 즉시 탈색되었다. Dropping the suspension to drop the old daljeup was fading away. 오래된 닭즙을 스코트 (등록상표) 종이 타월 위에 방울로 떨어뜨렸다. He dropped the towel drops over old daljeup to Scott (TM) paper. 하기 화학식 37의 Cl 산 옐로우 23 (식품 착색제 타르트라진으로도 공지됨) (알드리치 케미컬) 50 mg (페닐피라졸론 염료의 예)을 10 ml 탈이온수에 용해시켰다. The following (for example, a phenyl-pyrazolone dyes) Cl acid yellow 23 (also known as the food colorant tartrate search l) (Aldrich Chemical Co.) 50 mg of the formula 37 was dissolved in 10 ml of deionized water. 이 염료 용액을 종이 타월 위의 오래된 닭즙에 방울로 떨어뜨렸다. This dye solution was dropped to the drop of the old daljeup on paper towels. 색 변화가 관찰되지 않았다. The color change was observed. 대조군으로서, 100 mg의 레이차트 염료를 10 ml 아세토니트릴에 현탁시켰다. As a control, it was suspended in a dye-ray chart of 100 mg in 10 ml of acetonitrile. 이 현탁액을 오래된 닭즙에 방울로 떨어뜨리면 즉시 탈색되었다. Dropping the suspension to drop the old daljeup was fading away. 오래된 닭즙을 스코트 (등록상표) 종이 타월 위에 방울로 떨어뜨렸다. He dropped the towel drops over old daljeup to Scott (TM) paper. 하기 화학식 38의 Cl 산 레드 52 (술포르호다민 B) (크산텐 염료의 예)의 수용액을 종이 타월 위의 오래된 닭즙에 방울로 떨어뜨렸다. It dropped to an aqueous solution of the acid of formula 38 Cl Red 52 (alcohol formate Huoda min B) (Examples of xanthene dyes) to drop the old daljeup on paper towels. 색 변화가 관찰되지 않았다. The color change was observed. 대조군으로서, 100 mg의 레이차트 염료를 10 ml 아세토니트릴에 현탁시켰다. As a control, it was suspended in a dye-ray chart of 100 mg in 10 ml of acetonitrile. 이 현탁액을 오래된 닭즙에 방울로 떨어뜨리면 즉시 탈색되었다. Dropping the suspension to drop the old daljeup was fading away. 오래된 닭즙을 스코트 (등록상표) 종이 타월 위에 방울로 떨어뜨렸다. He dropped the towel drops over old daljeup to Scott (TM) paper. 하기 화학식 39의 Cl 산 블루 74 (인디고 카르민으로도 공지됨) (알드리치 케미컬) (인디고이드 염료의 예) 30 mg을 10 ml 탈이온수에 용해시켰다. To (also known as Indigo Carmine), Blue 74 Cl acid of formula 39 (Aldrich Chemical) (e.g., the indigoid dye) was dissolved 30 mg in 10 ml of deionized water. 이 염료 용액을 종이 타월 위의 오래된 닭즙에 방울로 떨어뜨렸다. This dye solution was dropped to the drop of the old daljeup on paper towels. 색 변화가 관찰되지 않았다. The color change was observed. 대조군으로서, 100 mg의 레이차트 염료를 10 ml 아세토니트릴에 현탁시켰다. As a control, it was suspended in a dye-ray chart of 100 mg in 10 ml of acetonitrile. 이 현탁액을 오래된 닭즙에 방울로 떨어뜨리면 즉시 탈색되었다. Dropping the suspension to drop the old daljeup was fading away. 당업자에 의해 이해될 수 있듯이, 본 발명에 대한 변화 및 변형은 당업자의 능력 범위 내에 있는 것으로 간주된다. As can be appreciated by those skilled in the art, changes and variations to the present invention are considered to be within the ability of those skilled in the art range. 이러한 변화의 예는 상기 확인된 특허에 포함되고 상기 특허는 각각 본 명세서와 일치되는 정도까지 그 전체내용이 참고문헌으로 본원에 포함된다. Examples of such changes are contained in the above-identified Patent This patent is incorporated herein in its entirety the reference to the extent that is consistent with the specification, respectively. 이러한 변화 및 변형은 발명자에 의해 본 발명의 범주 내에 있는 것으로 해석된다. Such changes and modifications are construed as within the scope of the present invention by the inventors. 또한, 본 발명의 범주는 본원에 기재된 특정한 실시양태로만 제한되는 것으로 해석되어서는 안되고, 상기 개시내용을 고려하여 판단할 때 첨부된 청구의 범위에 따른다는 것을 이해하여야 한다. Further, the scope of the invention is to be understood that should not be construed as limited to the specific embodiments described herein, in accordance with the appended claims when judged in view of the above disclosure. 를 포함하며, 상기 대조 염료의 색은 기지 미생물 농도에 대응하는 것인, 샘플내 미생물 존재의 반-정량적 또는 정량적 검출 방법. To include, and is, half of the sample microorganisms present to control the color of the dye corresponds to the base of the microorganism concentration-quantitative or quantitative detection methods. 제1항에 있어서, 시험 염료, 대조 염료 또는 양자 모두가 용매화발색 염료인 방법. The method of claim 1, wherein the test dye, the control dye, or both a solvated dye for color development. 제1항에 있어서, N-페놀레이트 베타인 염료가 레이차트(Reichardt's) 염료인 방법. According to claim 1, N- phenolate betaine dye ray chart (Reichardt's) Dye method. 제1항에 있어서, 시험 염료의 색을 복수 개의 대조 염료의 색과 비교하며, 상기 대조 염료는 각각 서로 다른 기지 미생물 농도에 대응하는 색을 갖는 것인 방법. 9. The method of claim 1, comparing the color of the test dye and the color of the plurality of contrast dye, wherein the dye will contrast, each having a color corresponding to different known microbe concentrations. 를 포함하며, 상기 대조 염료는 각각 서로 다른 기지 미생물 농도에 대응하는 색을 갖는 것인, 샘플내 미생물 존재의 반-정량적 또는 정량적 검출 방법. The included and the contrast dye in, a sample of the anti-microbial will present each having a color corresponding to different known microbe concentration-quantitative or quantitative detection methods. 제10항에 있어서, 시험 염료 및 대조 염료가 레이차트 염료인 방법. 11. The method of claim 10, wherein the test dyes and the control dye-ray chart dyes. 제1항, 제2항, 제7항, 제9항, 제10항 및 제12항 중 어느 한 항에 있어서, 시험 염료, 대조 염료 또는 대조 염료들, 또는 이들의 조합물의 색 강도를 측정하는 단계를 더 포함하는 방법. Of claim 1, claim 2, claim 7, claim 9, claim 10 and claim 12 according to any one of claims, wherein the test dye, the control dye or contrast dye, or a combination of these measures the water color intensity the method further comprises the step. 제13항에 있어서, 시험 염료의 색 강도가 시료내 미생물의 농도에 비례하는 방법. 14. The method of claim 13, wherein the color intensity of the test dye is proportional to the concentration of the microorganism sample. 제13항에 있어서, 대조 염료 또는 대조 염료들의 색 강도를 복수 개의 기지 미생물 농도에 대하여 플롯팅함으로써 검출 곡선을 그리는 단계를 더 포함하는 방법. 14. The method of claim 13, contrast dyes, the method further comprising drawing the detection curve by plotting the relative intensity of the color contrast dye to a plurality of base biomass concentration. 제15항에 있어서, 검출 곡선에서 시험 염료의 색 강도를 미생물 농도와 상호 연관시키는 단계를 더 포함하는 방법. 16. The method of claim 15, further comprising the step of correlating the concentration of the microorganism the color intensity of the test dye in the detection curve. 제1항, 제2항, 제7항, 제9항, 제10항 및 제12항 중 어느 한 항에 있어서, 기재가 시험 염료를 함유하는 검출 대역 및 대조 염료 또는 대조 염료들을 함유하는 대조 대역을 형성하는 것인 방법. Of claim 1, claim 2, claim 7, claim 9, claim 10 and claim 12 according to any one of items, the control, which contains the detection zone and the control dye or contrast dye to the substrate containing the test dye band the method of forming a. 제1항, 제2항, 제7항, 제9항, 제10항 및 제12항 중 어느 한 항에 있어서, 색 변화가 5분 이내에 일어나는 방법. Of claim 1, claim 2, claim 7, claim 9, claim 10 and as claimed in claim 12, wherein a color change occurs in less than 5 minutes. 검출 대역 및 대조 대역을 형성하며, 이때 시험 염료는 미생물의 존재하에서 검출가능한 색 변화가 일어날 수 있는 검출 대역 내에 함유되고, 복수 개의 대조 염료는 대조 대역 내에 함유되며, 대조 염료 각각의 색은 서로 다른 기지 미생물 농도에 대응하는 것이고, 상기 시험 염료 및 대조 염료는 양쪽성 이온인 N-페놀레이트 베타인 염료인, 샘플내 미생물 존재의 반-정량적 또는 정량적 검출용 기재. To form a detection zone and a control zone, wherein the test dye is contained in the detection band can happen that a detectable color change in the presence of a microorganism, a plurality of contrast dye is contained in the control band, each of the color contrast dyes are different is to correspond to the base biomass concentration, the test dyes and the control dye is amphoteric ion of N- phenolate betaine dye, and sample the presence of anti-microbial-quantitative or quantitative detection substrate for. 제1항, 제2항, 제7항, 제9항, 제10항 및 제12항 중 어느 한 항에 있어서, 색 변화가 1분 이내에 일어나는 방법. Of claim 1, claim 2, claim 7, wherein according to 9, claim 10 and any one of claim 12, wherein a color change occurs in less than one minute. 제19항에 있어서, 시험 염료, 대조 염료 또는 이들의 조합물이 레이차트 염 료인 기재. The method of claim 19, wherein the test dye, the control dyes, or combinations thereof, the salt-ray chart ryoin substrate. Evans et al. 1979 Hemagglutination patterns of enterotoxigenic and enteropathogenic Escherichia coli determined with human, bovine, chicken, and guinea pig erythrocytes in the presence and absence of mannose.